The 1950’s were a time of radical change in weather forecasting. Radar was being adapted as a tool for analyzing storm systems. The radar signature known as a “hook echo,” now associated with tornado formation, was first observed in 1953. These innovations would save countless lives in subsequent decades. However they proved too late to prevent the terrible tragedies of 1953. 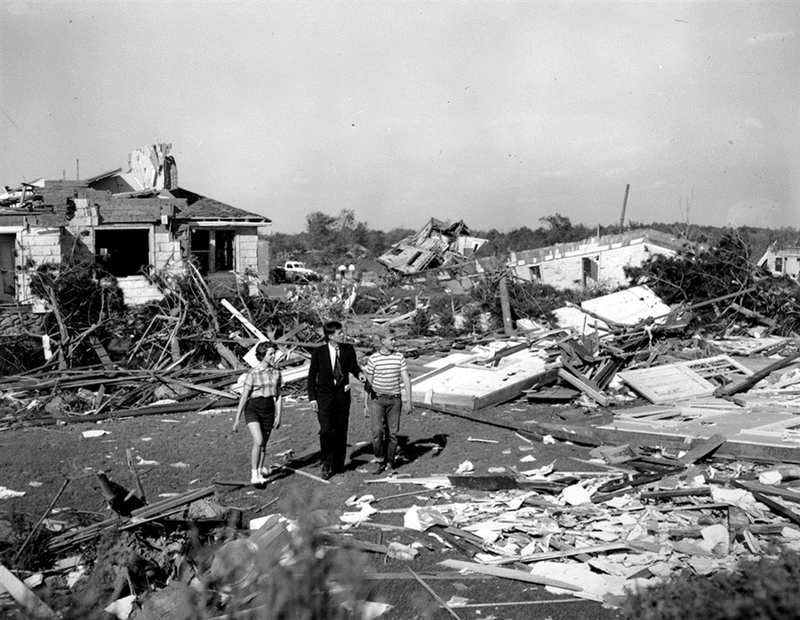 1953 was one of the worst tornado years in American history. 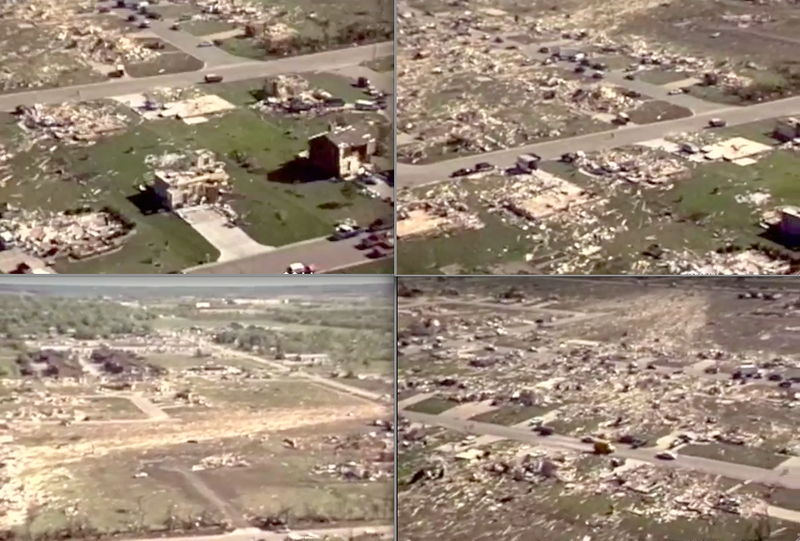 Three massive, F5 tornadoes combined to kill 324 people. In all, 519 people died as a result of tornadoes that year. It was a mild but muggy day in Waco, Texas. Temperatures were in the mid-70s and violent storms were in the forecast. At 2:30 pm, a large F4 struck downtown San Angelo, 130 miles west of Waco, killing 13 and injuring 153. There was a feeling of uneasiness across central Texas as the afternoon progressed. No one, however, could’ve imagined what was about to happen to Waco. According to old Native American legend, the culvert by the Brazos River in which Waco now sits was protected by the spirits of the land. The city is surrounded by bluffs, making tornadoes relatively rare in the area (for Texas at least). Tornadoes and violent storms always went around the city, never through it. All that changed that day in May, 1953. Numerous large, steel frame, masonry buildings in Waco were reduced to rubble. The tornado touched down at 4:10 pm ten miles south southwest of the city near the intersection of Spring Valley and Old Lorena roads and moved north northeast, straight for downtown Waco. Meanwhile, the city was inundated by heavy rain, making it very difficult for residents to see the tornado coming. But the tornado was on them so fast that there was very little they could’ve done anyway. It curved between the suburbs of Hewitt and Woodway, rapidly intensifying. At a third of a mile wide, it was not a particularly large tornado, but it was incredibly powerful. It ripped through downtown Waco at around 4:30 pm, causing incredible devastation. It took everyone completely by surprise. Over 600 homes were obliterated and hundreds more were heavily damaged. Huge, multi-story brick and masonry buildings were in ruins. 30 people were killed when a six-story furniture store collapsed. The Dr. Pepper bottling plant was heavily damaged. Rubble was piled over ten feet high in some places. The destruction was so great that some survivors were buried in the ruins for over 14 hours before being rescued. The last survivor was rescued 18 hours after the tornado struck. The tornado crossed the Brazos River into the suburb of Bellmead, where it continued to cause heavy damage before curving northeast, lifting near the town of Axtell. 114 people died and 597 were injured, all of them in the Waco metro area. 61 people died in a single block bounded by 4th and 5th streets, and Franklin and Austin avenues…just eight blocks from Baylor University, which was miraculously spared, and less than three blocks from City Hall. A Baylor professor and his wife were among the dead. Over 600 homes and businesses were completely destroyed and over 1,000 were seriously damaged. 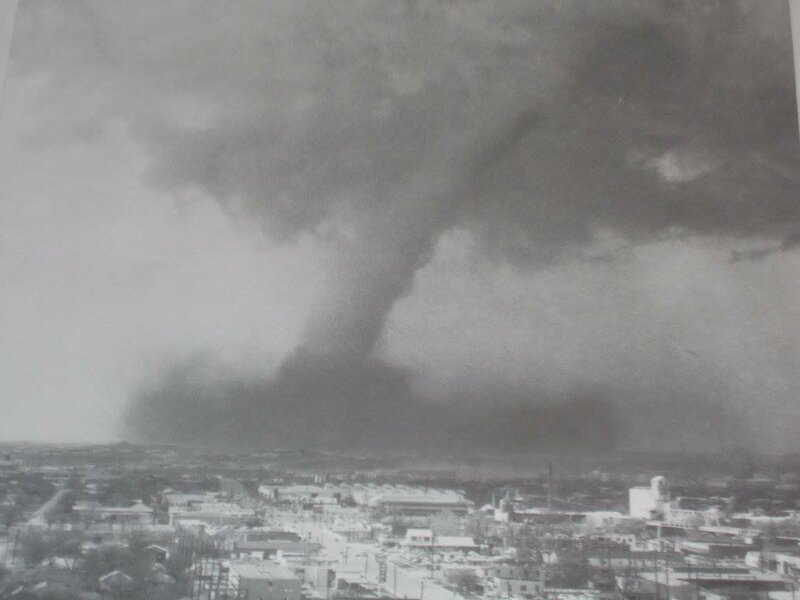 The Waco tornado is tied with the 1902 Goliad tornado, an F4, for the deadliest in Texas history. The bottling plant, now the Dr. Pepper Museum, like many brick structures over a certain age in Waco, still bears the scars of May 11, 1953. A large section of its brick is noticeably lighter colored than the rest of the building, just one of the many reminders of that terrible day. Fort Rice, North Dakota was an old frontier fort dating back to the American Civil War. Established on the west bank of the Missouri River in 1864, it was an active military post until it was abandoned in 1878. Two companies from Fort Rice fought with General Custer in the Battle of Little Bighorn. It is now a state historic site. 75 years later, Fort Rice would gain notoriety for an entirely different reason. One mile north of the old fort was the small village of Fort Rice, home to about 100-200 people. Not much is written about the tornado that struck here that day in 1953. It touched down over open farm country four miles northwest of Cannon Ball and moved northeast, steadily strengthening. It was not a particularly large tornado at a third of a mile wide, but it was extremely powerful. It raked by the northwest side of Fort Rice and continued northeast, jumping the river into Emmons County and lifting about seven miles west southwest of Moffit. Though Fort Rice didn’t take a direct hit, virtually every house in the town was damaged to some degree. The Catholic church just outside of town was obliterated, the debris scattered about the surrounding fields. Church pews were driven into the ground up to four feet deep by the force of the wind. Two people were killed and twenty were injured. The tornado is one of only two F5s to strike North Dakota to date. Some contemporary experts have disputed the official rating, arguing that the destroyed structures were not of sturdy enough construction to warrant an F5 rating. One of the many homes swept away in Beecher. 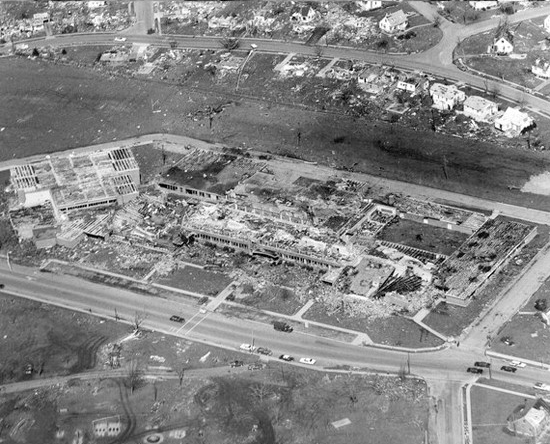 Less than a month after the Waco tornado, another devastating F5 struck the northern suburbs of Flint, Michigan. A powerful storm system roared across the Great Lakes and abundant low level moisture poured in from the Ohio Valley. The tornado touched down at 8:30 pm two miles north of Flushing near a drive-in movie theater and moved due east toward suburban Flint. It rapidly intensified and tore through Beecher, a densely populated residential suburb three miles north of downtown Flint as a half-mile wide F5. Entire rows of houses along either side of Coldwater Road were obliterated. Nearly every home along the road for over a mile, including some large brick homes, was completely swept away, the debris scattered for miles. All that was left were holes in the ground; basements filled with assorted debris, sometimes not even from the same house that used to stand there. Cars were thrown great distances and some were never found, flung over the neighboring hills. A 350-gallon oil tank vanished. One car was thrown into a stand of trees with such force that it was impaled on the branches. In the darkness, few had any idea the tornado was coming. Most people were taken completely by surprise. It had been just a normal night for them. They were eating dinner, or watching TV, or listening to the radio, when, out of nowhere the tornado obliterated their homes. The death toll was appalling. Some entire families were wiped out. The Gensel and Gatica families each lost five members. The carnage was so great that the National Guard Armory was turned into a temporary morgue. 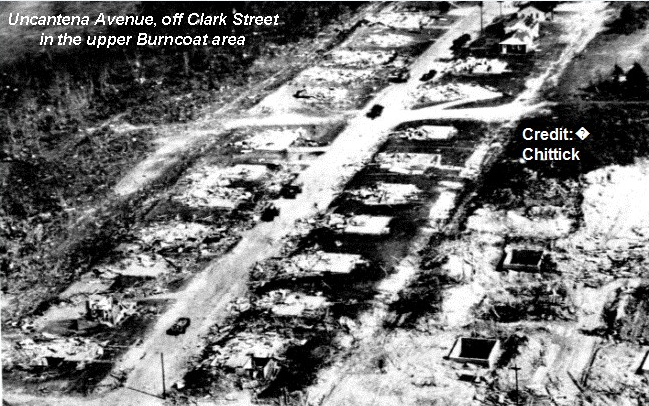 116 people died, all but three of them on a two and a half mile stretch of Coldwater Road between Clio Road and the Dort Highway, and 340 homes were annihilated. It remains Michigan’s worst natural disaster. After leaving Beecher, the tornado curved to the east-northeast, striking the Russellville area before passing by what is now Holloway Reservoir, whose dam was then under construction. The tornado lifted over rural Lapeer County near Five Lakes Road. Then Massachusetts governor John F. Kennedy inspects the damage. As the citizens of Beecher were picking up the pieces, the storm system moved into the northeast. Tornadoes were one thing residents of Massachusetts didn’t worry much about. To that point, the deadliest tornado in state history was the F3 that struck Lawrence in July, 1890, killing eight. Massachusetts hadn’t had a deadly tornado in six years. The strong storm system produced unusually ripe conditions for severe weather in the northeast. The weather bureau office in Buffalo told residents of upstate New York to be on the lookout for possible tornadoes. Not much was said about the threat in Massachusetts. Tornadoes were rare in the state and forecasters reportedly didn’t want to cause panic. In the preceding days, temperatures had soared as high as 90F in Worcester, but by June 8th had plunged to the mid 70’s. However, the cooler air mass began to clash with warmer air to the south and thunderstorms began to initiate. Residents of Worcester awoke on the morning of June 9th to a steady rain and news of devastation in Michigan. The front page of the Boston Globe told of the horror that had been wrought on Beecher. Few, however, imagined that similar devastation would soon visit them. Tornadoes began to touch down that afternoon in western New York and New Hampshire. Exeter, New Hampshire was slammed by an F3 tornado that may be the strongest in state history. The tornado that would change everything in New England touched down at 4:25pm twenty miles northwest of Worcester near the town of Petersham and moved southeast, steadily intensifying. It ripped through the towns of Barre, Rutland and Holden. By the time it moved into the northern suburbs of Worcester, it was a mile wide F5. Assumption College after the tornado. It slammed into Assumption College, a Catholic liberal arts school. A multi-story stone and masonry dormitory was leveled. The main building’s three-foot thick stone walls were reduced by three floors and its signature tower was snapped in half. A priest and three nuns were killed. The college would move a few miles southwest after the tornado. A community college occupies Assumption’s old buildings. Just a few blocks away, the Brook Valley subdivision along Uncatena Avenue was wiped from the face of the earth; foundations swept bare and most of the debris carried downstream. There was evidence of scouring around some of the foundations. Forty people died in a roughly one square mile area on either side of Clark Street. A twelve ton bus was picked up and rolled several times before being thrown into the side of the newly-built Curtis Apartments forty feet away. The Brookside Home Farm was obliterated, with debris and bodies of farm animals being blown into Lake Quinsigamond. An entire neighborhood near Worcester almost completely vanished. Note the scouring around some of the foundations. Shingles and other debris from suburban Worcester was found as far away as Boston, nearly 50 miles away. Debris fell on Blue Hill Observatory 35 miles away for over half an hour, including chunks of roof ten feet square and six-foot boards. Debris was even found floating in Massachusetts Bay, drifting out into the Atlantic Ocean and being observed by passing ships. A frozen mattress was found in Boston Harbor. Debris was reportedly found as far away as Cape Cod, 110 miles away, one of the greatest recorded distances for tornado debris. The tornado was still a mile wide when it moved into Shrewsbury, where another twelve people died. Downtown Westborough was heavily damaged and five people were killed. The tornado then curved toward the northeast and began to weaken. It finally lifted as it moved through the southern portions of Southborough. In all, 94 people were killed. It was by far the most devastating tornado in New England’s history and one of the worst in US history. 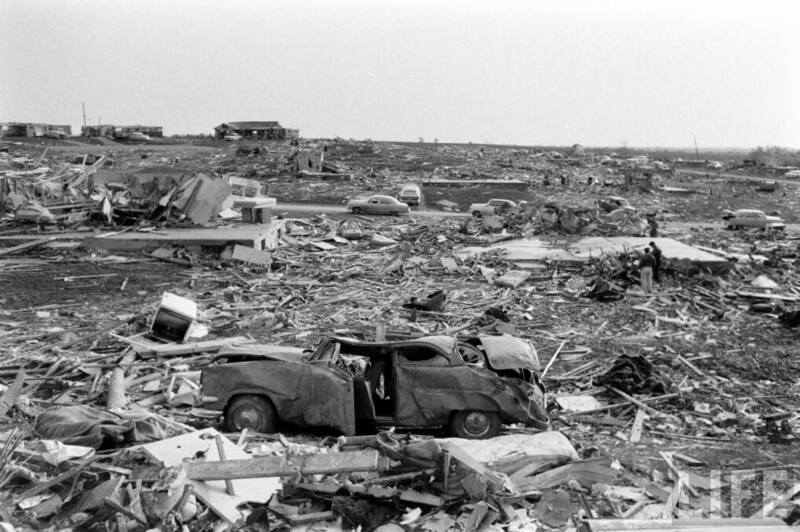 A staggering 10,000 people were left homeless, a record for a single tornado until it was surpassed by the Wichita Falls, Texas tornado of 1979. The Worcester tornado and the 1953 tornado season as a whole resulted in sweeping changes to the tornado warning system. The Weather Bureau’s Severe Local Storms Unit, the predecessor to today’s Storm Prediction Center, was formed. Adaptation of weather radar was accelerated and storm spotter networks were expanded. The results were positive; no tornado would kill more than 90 people for another 58 years. This tornado formed a few miles southeast of Anita, Iowa and moved northeast, devastating four farms in Cass and Adair Counties. One farm near the county line about three miles east of Anita was utterly obliterated. All farm buildings were completely swept away. Nothing was left at the site of the large farmhouse. Heavy machinery was thrown in excess of 100 yards and boards were driven into trees. One person was killed and two others were injured when the farmhouse was destroyed. The tornado lifted about four miles south of Adair. This tornado is traditionally credited to Adair, but the worst damage was closer to Anita. Winter in the Deep South is often mild. Thunderstorms in December are not uncommon, but tornadoes, particularly destructive ones, are rare. So residents of Vicksburg, Mississippi weren’t too concerned with the weather on December 5, 1953. It was just a typical Saturday afternoon. Spotty showers had been popping up throughout the day as people went about their business. The holiday season was in full swing and retail shops and storefronts were packed with Christmas shoppers. At around 5pm, as shops and weekend businesses began to close for the day and shoppers headed home, the sky grew dark as clouds moved in and it began to rain again. Few, however, could’ve imagined what was about to happen. 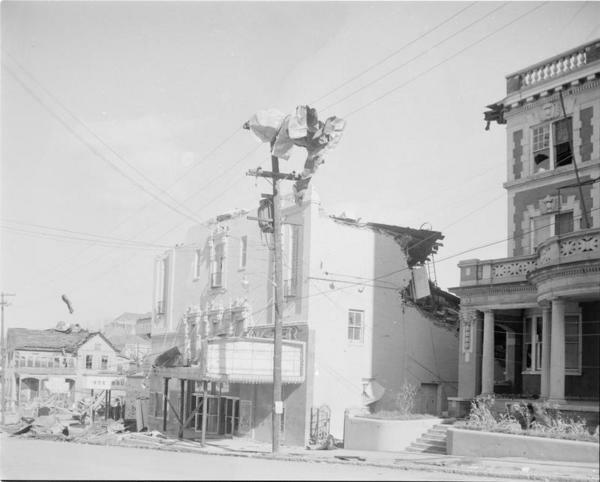 Numerous buildings in downtown Vicksburg were heavily damaged. At 5:35pm, a tornado touched down over the west bank of the Mississippi River and exploded into an F5 within a few minutes as it roared across the river into downtown Vicksburg. Residents had no warning whatsoever. The business district was devastated. Four city blocks were leveled and some large brick and masonry buildings were virtually demolished. Others had their top floors wiped out. It was a busy afternoon and several people driving through town in their cars were killed when the cars were thrown into buildings or crushed by collapsing brick walls. Dozens of children had packed the Saenger Theater to see a movie when the roof collapsed on top of them, killing five and seriously injuring many others. In the coming days, newspapers would print the heartrending stories of the young children who survived the theater collapse, many of whom were close friends with the five who died. Three tenement houses along the Mississippi River were leveled and an incredible seventeen industrial plants were destroyed. The city’s residential section was also hard hit. Many homes were destroyed and some were completely swept away. Several fires broke out among the wreckage, amplifying the destruction. One of many destroyed homes in Vicksburg. The city was without power for days as nighttime temperatures dipped below freezing. Few would forget the scene of smashed, darkened storefronts adorned with torn and tattered Christmas decorations as fires continued to burn and armed National Guardsmen patrolled the streets to deter looters. In all, 38 people died, 270 were injured, and nearly 1,300 lost their homes. It remains the deadliest December tornado in recorded history and occurred just six months after the city marked the 90th anniversary of the Civil War siege that made it famous. In recent years, the F5 rating of this tornado has come into question. Evidence has emerged that the homes that were reportedly swept away were of poor construction and that homes of stronger construction were not completely swept away. The damage to brick and masonry structures, while impressive, was comparable to, or even slightly less significant than that inflicted by the catastrophic 1896 St. Louis tornado, now estimated by historians to have been an F4. This casts doubt on whether this tornado was in fact an F5. Not officially rated an F5, this tornado touched down near Crowell, Texas, which had itself been hit by an F5 tornado in 1942, and moved northeast over open farm country. It ripped through empty farmland four miles northwest of Vernon before weakening and curving north-northeast into Oklahoma, where it lifted near Tipton. This tornado obliterated three homes and hurled a full-size car half a mile through the air. It did little else, however, and probably for this reason was only rated F4. However the severity of that one brief section of damage has led modern researchers to conclude that the tornado may have been underrated. Fortunately, no one was killed and only two people were injured. The devastation in Blackwell following the tornado. The day dawned dark and stormy over north central Oklahoma. Between 8:30 and 9am, strong storms with damaging winds blew through Kay County. Such weather was just a part of life for residents of Blackwell, Oklahoma. That afternoon, a violent tornado outbreak began to unfold. A large F4 tornado ravaged farms south of Shamrock, Texas, killing two. The worst of the tornadoes, however, touched down after dark. At around 9pm, a tornado touched down about five miles west of Marland, Oklahoma and moved due north into Kay County. The tornado remained relatively weak through the first half of its life as it passed just a few miles east of Tonkawa. However, as the tornado approached Blackwell, it began to rapidly intensify. By the time it reached the south side of town, it was a half-mile wide F5. The tornado ripped through the east side of Blackwell at 9:27pm, causing incredible devastation. The residential section on the southeast side of town in particular was utterly obliterated. Two of Blackwell’s major industries, the Hazel Atlas Glass factory and the Acme Foundry (both very large facilities), were completely destroyed and the Riverside Osteopathic Hospital was heavily damaged. Rescue efforts were hampered by the very heavy rain that followed the tornado. In fact, the Chickaskia River burst its banks during the overnight hours and flooded parts of the city. Very intense electrical activity and unusual electromagnetic phenomena was recorded with this storm and has been the subject of academic study. Some 400 homes in Blackwell were destroyed, and some were completely swept away. Twenty people died, nineteen in Blackwell and one on a farm north of town. The tornado continued on to the north, passing east of Braman before curving to the northwest into south central Kansas, lifting near the town of South Haven. Unfortunately the night’s events were only just beginning. As the Blackwell tornado passed by Braman, another storm cell was gaining strength in southern Kansas. Aerial view of the devastation. Just thirty minutes after the Blackwell, Oklahoma tornado, another tornado touched down just eight miles northeast near the Kansas border west of Arkansas City and moved north-northeast. The tornado was shrouded by rain and the primitive radar at the National Weather Service office in Wichita couldn’t see it. No warnings were issued. The tornado churned through open farm country in eastern Sumner County, not changing much in intensity. The chief of police of the Wichita suburb of Mulvane, who was returning from Blackwell after assessing the damage wrought by the first tornado, spotted the second from the road and tried frantically to warn towns out ahead of it via police radio. However, the Udall Police Department did not have a police scanner and the warnings fell on deaf ears. This was once a pickup truck. It was carried at least a quarter of a mile and ended up like this. The tornado churned past the town of Oxford, which narrowly missed taking a direct hit, and gradually turned more to the northeast on a direct line towards Udall. Now the tornado began to intensify as it moved into Cowley County. It struck Udall at 10:35pm as a three-quarter mile wide F5. Virtually the entire town was obliterated. Just a handful of buildings were left standing. Just a single home was livable after the storm. The town’s residents, many of whom were sleeping, never knew what hit them. Many homes simply vanished, their foundations swept bare. A concrete block community center near the center of town was reduced to rubble. Several other large brick buildings, including a local school, were also left in ruins. 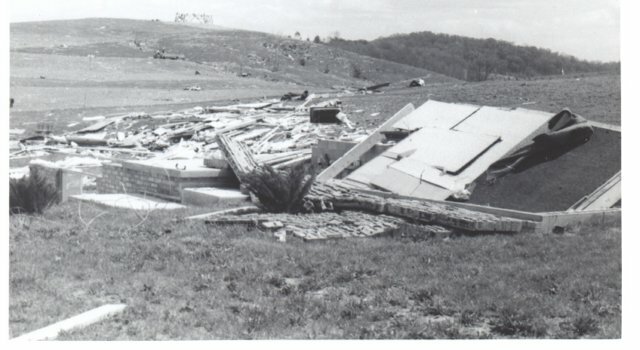 The large water tower on the northeast side of town was toppled to the ground. A pickup truck was stripped to the steel frame and wedged in a tree a quarter mile outside of town. Other vehicles were thrown large distances. A home reduced to its slab in Udall. The town was utterly decimated. 77 people died in Udall alone, nearly a third of the town’s population, and roughly 90% of the town was gone. Five other people were killed on farms back in Sumner County for a total of 82. The tornado weakened shortly after passing Udall. It brushed by the small village of Rock with relatively minor damage before lifting east of Douglass just across the line in Butler County. It was the worst natural disaster in Kansas history. 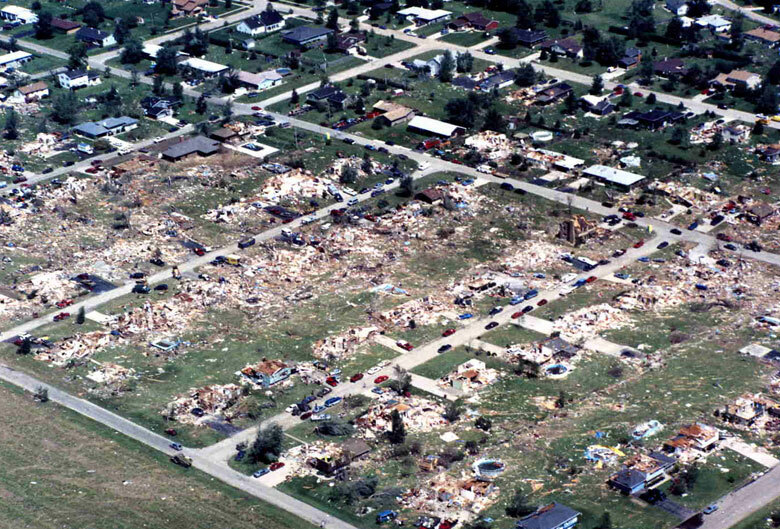 Three years after the catastrophic Flint-Beecher tornado, this tornado devastated the western suburbs of Grand Rapids. The day before, a series of strong tornadoes struck the Great Plains. Now the same storm system was affecting the Great Lakes region. 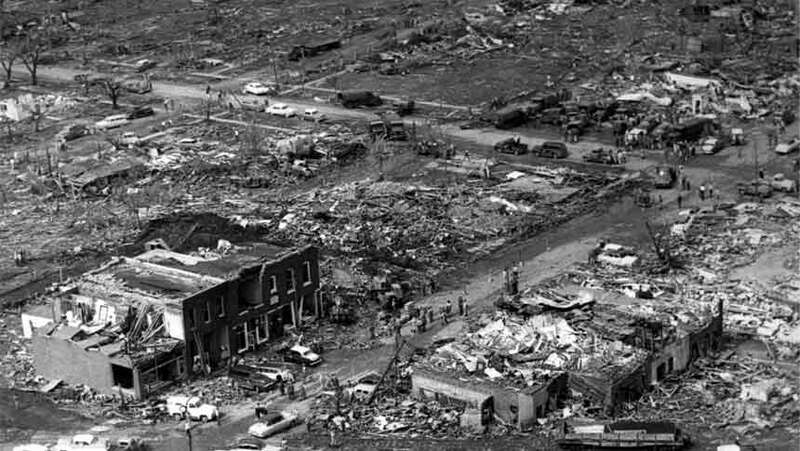 That morning, an F4 struck Berlin, Wisconsin, killing seven people and destroying numerous homes. After producing an F4 south of Holland, Michigan, the same supercell dropped another tornado near Vriesland, a small town east of Zeeland. This tornado moved northeast, strengthening rapidly and heading straight for the town of Hudsonville. At the time, Hudsonville was a quiet suburban town about seven miles southwest of Grand Rapids. The tornado slammed into Hudsonville at around 6:45pm as an F5. It was only a quarter of a mile wide but it was extremely powerful. Numerous homes were demolished and some simply vanished, their foundations completely wiped clean. In some places, hardly a splinter was left behind. Vehicles were thrown large distances and smashed to pieces. 15 people died here. The tornado continued northeast through the Georgetown area, weakening slightly, crossing the Grand River toward the Grand Rapids metro area. This home in Hudsonville completely vanished and the debris was carried well away from the site. The tornado restrengthened as it approached the community of Standale. Water and mud from Fennessey Lake were plastered on surrounding homes and anything else in the storm’s path. Standale was devastated. Numerous homes were destroyed and some were completely swept away. Fortunately there was only one fatality in Standale proper. Further northeast, a mobile home park was annihilated off Bristol Avenue northwest of Grand Rapids proper and two people were killed. The tornado rolled through Comstock Park, still doing significant damage and killing one person before it finally began to weaken. After hitting Rockford at diminished intensity, the tornado moved through rural areas in northern Kent County before finally lifting near Trufant in southwestern Montcalm County. In all, 19 people were killed and 340 were injured. As of 2017, it is the last F5/EF5 tornado to strike the state of Michigan. Kansas City, even in 1957, was a sprawling metropolis home to roughly half a million people and covering some five counties in Missouri and Kansas. Ruskin Heights is a small suburban community roughly ten miles south of Kansas City that in 1957 was largely independent but has now been swallowed up by KC’s urban sprawl. The tornado that struck here that day in 1957 carved a 71 mile path of destruction across eastern Kansas and western Missouri. It touched down at roughly 6pm near Williamsburg, Kansas in the warm sector of an occluded low pressure system ahead of a dryline (a boundary between warm and moist, and hot and dry airmasses), heading northeast along and south of I-35. A view of the devastation in the Ruskin Heights area of Kansas City. The tornado raked by Ottawa, destroying a few homes and killing two people. Eyewitnesses reported seeing several funnels snaking across the prairie, shrouded by clouds of dust. By the time it reached Spring Hill along the Miami-Johnson County line, it was a single, large wedge tornado roughly half a mile wide. Four people were killed as the tornado passed just north of Spring Hill into Johnson County, demolishing several homes as it moved through more densely populated areas southeast of Olathe, steadily intensifying. It crossed the Missouri state line at 7:30pm and by that time, news of the tornado had reached Kansas City and local TV and radio stations began broadcasting urgent warnings. For many, however, the warnings came too late. Martin City was the first Missouri community to be hit. 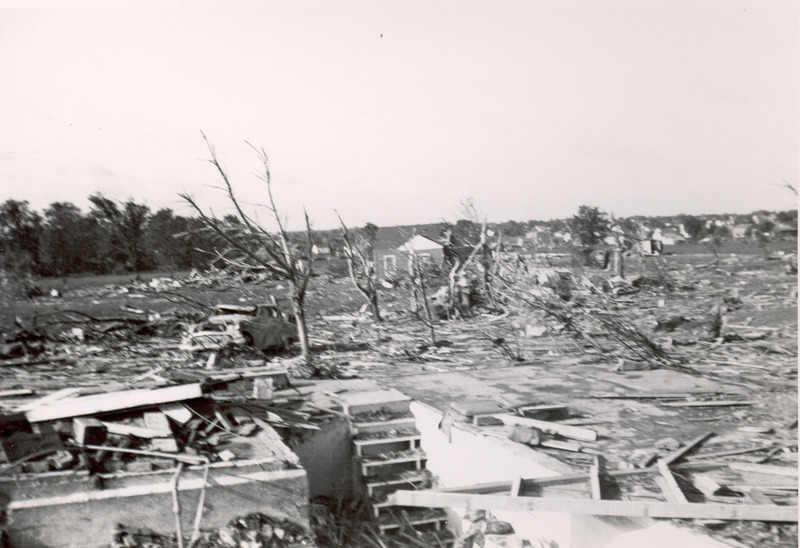 25-30 homes and a few churches were leveled and virtually every home in Martin City was damaged or destroyed. Two people were killed and 35 were injured. That was just the beginning. Several homes were completely swept away. The tornado continued to intensify as it moved northeast. Hickman Mills was next. The community was devastated. Several square blocks were completely wiped out and many people were killed. The Hickman Mills Furniture Company’s warehouse was demolished. Cars from a local car dealership were picked up and thrown blocks away. Then the tornado moved into adjacent Ruskin Heights. It slammed into the Ruskin Heights Shopping Center, where dozens of shoppers were taken completely by surprise. The roof was torn clean off and survivors reported seeing cars and people flying though the air. One car with a mother and child inside was thrown into a water tower behind the shopping center. Both occupants were killed. 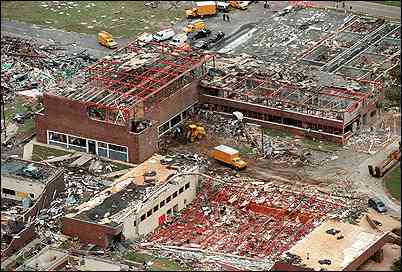 The tornado demolished the sprawling high school complex, which was just a year old at the time. Many homes didn’t have basements, leaving residents with nowhere to go. Dozens of homes were completely demolished and many, including at least one entire neighborhood, simply vanished. The tornado weakened soon after leaving Ruskin Heights, lifting roughly six miles to the northeast in the Lakewood area. 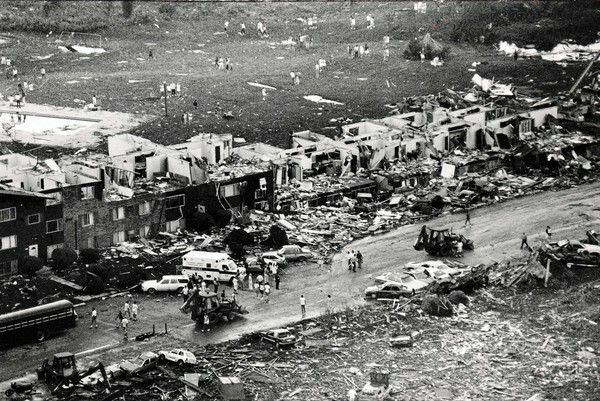 In all, the tornado killed 44 people, 37 of them in the Hickman Mills-Ruskin Heights area alone. It demolished hundreds of homes and businesses, causing $2.5 million in damage, roughly $20.5 million in 2012. The tornado over open country west of town. Four years after Fort Rice, North Dakota’s most famous tornado touched down. That June day, a handful of independent supercells moved through the northern Great Plains. The Fargo tornado came essentially out of nowhere. It touched down near the village of Wheatland, North Dakota and moved almost due east. Not much is written about what the tornado did before it reached Fargo. It just missed Casselton and made a direct hit on Mapleton, apparently without doing much damage. It was a narrow “stovepipe” tornado only about 250 yards wide but it was extremely powerful and visible for miles. Numerous people sat and watched the tornado churn slowly across the prairie towards Fargo. Sirens were sounded and hundreds of Fargo residents sought shelter. However there’s only so much you can do when an F5 is headed your way. The sun was still up when the tornado slammed into the northwest side of the city shortly after 9pm. The Golden Ridge subdivision was devastated. Over 200 homes were destroyed in that neighborhood alone and some were completely swept away, leaving only the foundations. Most, if not all, of the fatalities occurred there. The Munson family lost all six of their children when their home was obliterated by the tornado. The parents were not home at the time and their eldest daughter was looking after her younger siblings. Mrs. Munson was at work and heard the weather reports and tried to call the house. Her daughter said, “It’s hitting!” just before the line went dead. Nearby Shanley High School was all but destroyed. 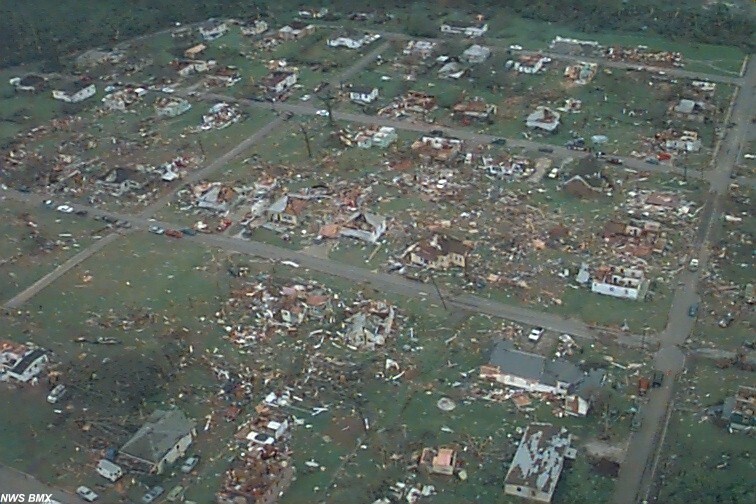 Aerial view of the Golden Ridge subdivision after the tornado. 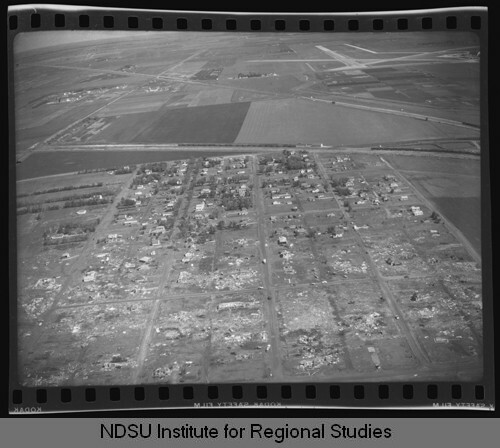 The tornado turned more to the northeast and ripped through the Roosevelt neighborhood, damaging portions of the campus of the North Dakota Agricultural College (now North Dakota State University), before crossing the Red River into Minnesota. Numerous cars were picked up and thrown great distances. Debris from Fargo rained down on Moorhead, Minnesota as the tornado crossed the river. By that time, however, the tornado had weakened. Northern portions of Moorhead suffered moderate damage. A convent was wrecked. But the area escaped the devastation suffered by Fargo. The tornado continued to churn through rural areas of Clay County, Minnesota along and north of US-10 for another 15 miles at diminished intensity before lifting just north of Hawley. In all, the tornado killed ten people and injured 103. Advanced warning undoubtedly prevented a higher death toll. Hundreds of homes and businesses were leveled. Debris from Fargo was found as far away as Detroit Lakes, Minnesota, 54 miles away. Violent tornadoes are extremely rare in the winter months, particularly at higher latitudes. The events of December 18, 1957 took everyone by surprise. It was an unusually warm December day in southern Illinois, with temperatures climbing into the mid 60s. A strong mid-latitude low pressure system was digging into the Midwest, setting the stage for one of the most significant winter tornado outbreaks in history. Tornadoes began touching down in Missouri at around noon. 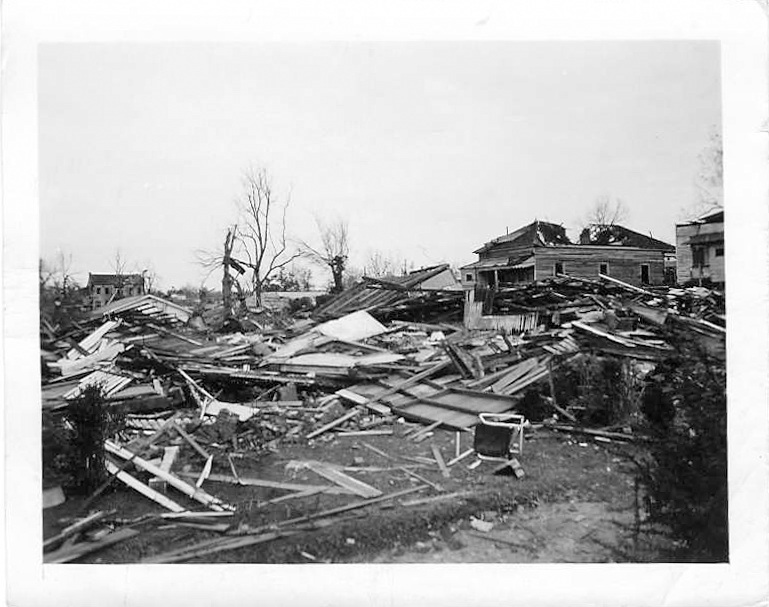 Everyone over a certain age in Murphysboro had vivid memories of March 18, 1925, when the greatest tornado cataclysm in history changed their town forever. The subsequent generations grew up hearing the stories of that day. Now, 33 years later, they were about to be hit again. Shortly before 4pm, a large F4 tornado ripped through Murphysboro, killing 11 people and devastating several neighborhoods. Some twenty minutes earlier, numerous Murphysboro residents reported hearing a loud roaring sound coming from the north. Most wrote it off as jet airplanes passing overhead. In fact, it was the sound of the powerful F5 tornado that was ripping through farmland 15 miles north of them, some five miles north of DeQuoin near the village of Sunfield. The tornado came virtually out of nowhere, touching down just a few miles west of town and exploding into an F5 roughly a quarter of a mile wide. Sunfield was all but obliterated. Several homes were completely swept away, leaving only bare foundations. At least one person was killed (some sources say three). Little else is known about the tornado. It was overshadowed by the devastating Murphysboro tornado that hit just minutes later and the two have often been confused. A third violent tornado struck the Mount Vernon area that day. It was one of the most violent December outbreaks on record. Colfax residents picking through the wreckage. In the background is a vehicle that was thrown. It was a rough, stormy day in the upper Midwest. Severe thunderstorms and a few tornadoes rolled through central Minnesota, steadily advancing eastward. The worst, however, was yet to come. As the storms moved into western Wisconsin, they began to intensify and powerful tornadoes began to touch down. This one formed over open country south of Interstate 94 in St. Croix County, a few miles south of Baldwin and Woodville…and twelve miles southeast of New Richmond, site of the devastating 1899 tornado…and moved east-northeast. Steadily intensifying, the tornado demolished numerous farm buildings south of Wilson and Knapp. The tornado continued to get stronger as it moved into Dunn County, headed for the northern suburbs of Menominee. It struck the small suburban village of Cedar Falls along the Red Cedar River as an F4. The village was completely destroyed. Just one home remained standing. The devastation continued as the tornado curved more to the northeast, ripping past Tainter Lake on a collision course with the town of Colfax. It slammed into Colfax at 7:04pm as a half-mile wide F5. Half the town was destroyed and several homes were eviscerated, leaving only the foundations. Debris fell on open farmland dozens of miles east of Colfax. Cars were picked up and thrown several blocks through the air. One was found wrapped around the girders of a bridge that collapsed in the tornado. 21 people were killed, 12 of them in Colfax, four in Cedar Falls, and the rest on farms in St. Croix and Dunn Counties. Damage amounted to roughly $2 million. The tornado lifted just five miles northeast of Colfax. Two other violent tornadoes would strike Wisconsin that day. Nearby Chippewa Falls was devastated by an F4 and four people were killed. Another F4 would rip through open country near the town of Fall Creek, also killing four. The Colfax tornado was Wisconsin’s first F5 in 34 years. Less than a week after the Colfax tornado, another devastating tornado touched down, this time in Kansas. It was a quiet day in the Great Plains. There were storms in the area and in the forecast, but there were no indications that a destructive tornado would hit anywhere that day. The El Dorado tornado came out of nowhere, touching down over farmland eight miles west-northwest of town at about 5:30pm and moved east-southeast, steadily intensifying. It demolished a few farms as it headed for northern portions of El Dorado. By the time it crossed the Kansas Turnpike, it was a massive and powerful tornado half a mile wide. It was evening rush hour and commuters crowded the streets. The tornado picked up cars from the freeway and hurled them through the air, killing at least three people and injuring several others. Some motorists abandoned their cars and took refuge in ditches and under an overpass. Two survivors who took shelter under the overpass reported that when they got back to the road after the tornado had passed, their cars were gone. The tornado had ripped the engines from the engine block and left them on road, along with other bits and pieces. Possible F5 damage in El Dorado. A relatively new home was completely swept away. It then ripped through neighborhoods along the north side of El Dorado, demolishing numerous homes, many of which were brand new. Some homes were completely swept from their foundations, leaving only concrete slabs. The tornado killed 15 people and injured numerous others. It lifted just east of town. This tornado was officially rated F4, possibly due to questions raised about the quality of the construction of the homes destroyed and the inconsistency of the damage path (a home would be completely swept away but all around it were homes that suffered lighter damage). Contemporary research has called the original rating into question. Namely many of the homes destroyed were brand new with sturdier construction. It is now believed that the El Dorado tornado may have in fact been an F5. This large and powerful tornado devastated a large swath of central Oklahoma. It touched down near Tecumseh in Pottawatomie County and moved northeast, gradually intensifying. By the time it reached the Lincoln County line at around 5:30pm, it was an F5 half a mile wide. It devastated 14 farms just east of Prague. Numerous farm buildings were obliterated, some completely wiped from their foundations, and heavy machinery was thrown great distances. A large, $1 million oil refinery was virtually destroyed. Damage came to $750,000, nearly equal to the building costs of the refinery. The tornado then moved through western Okfuskee County, doing significant damage to several farms, before moving into Creek County. Several homes were obliterated in the Iron Post area south of Bristow and two people were killed. The tornado then ripped by Kellyville before smashing into the west side of Sapulpa as an F4 at around 6:30. A handful of neighborhoods were devastated. 100 homes were completely destroyed and numerous others were severely damaged. Three people were killed. The tornado finally lifted just a few miles north of Sapulpa near the town of Oakhurst. It had traveled 72 miles across the plains of central Oklahoma. The thunderstorm that spawned it would then roar over nearby Tulsa, causing extensive wind damage and residents reported seeing swirling clouds in the sky. Numerous other destructive tornadoes struck Oklahoma that day. 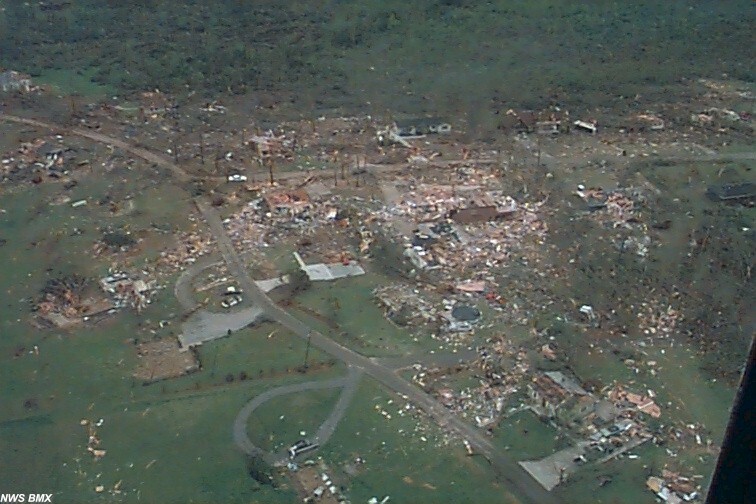 An F4 devastated the town of Wilburton and surrounding areas, killing 16 people, 11 of them in Wilburton. Another F4 killed five people when it completely destroyed a house near Roland and two cars were thrown over 100 yards, seriously injuring three people. A view of the tornado near the intersection of US 40 (I-70) and Kansas Highway 99 north of Alma. This bizarre and controversial tornado event caused extensive devastation across Wabaunsee and Shawnee Counties in northeastern Kansas. The first and believed to be the most powerful of a series of strong tornadoes spawned by the same supercell, this one touched down near the village of Wabaunsee in Wabaunsee County north of Interstate 70 and moved east-northeast. The tornado quickly intensified as it ripped through farmland south of the Kansas River. Numerous farms were heavily damaged and at least one was virtually wiped off the map. The tornado crossed the Kansas River into Shawnee County midway between St. Marys and Rossville. By that time, it was a massive tornado at least a mile wide. A farm some three miles north of Rossville was obliterated. The farmhouse was completely wiped from its foundation, as were most of the buildings on the farm. Fortunately nobody was killed and just twelve people were injured. 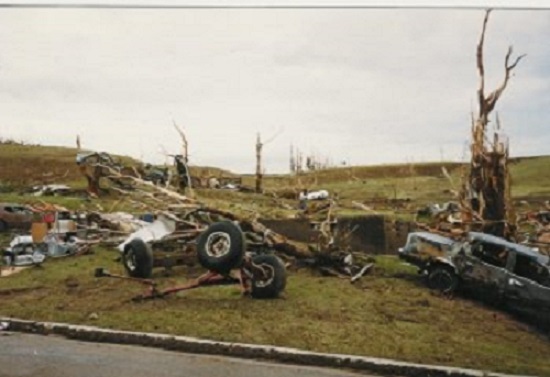 The tornado lifted shortly after destroying the Rossville farm. However, just a short time later, the same supercell dropped another strong tornado near the village of Grove. It went on to strike the town of Meriden as a half-mile wide F4, destroying numerous homes, some of which were virtually obliterated. One person was killed and nearly 100 more were injured. The same supercell would later drop two more tornadoes, both F3s. 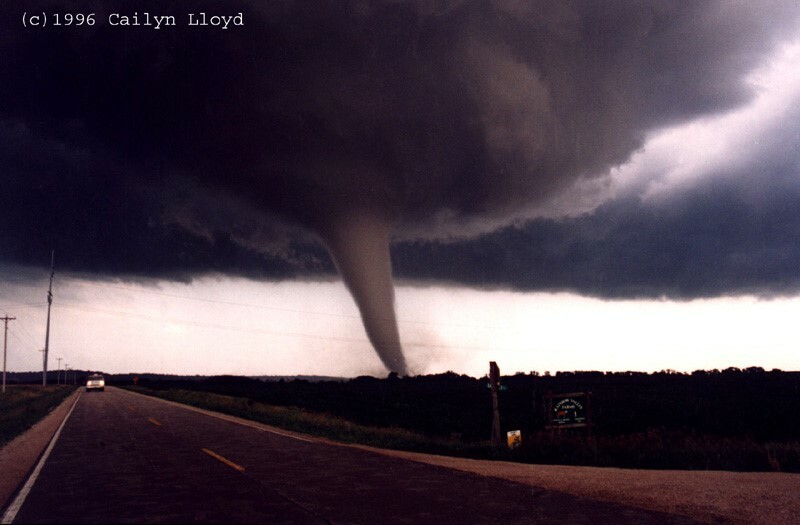 The first tornado is officially rated F4, however contemporary researchers have suggested that the damage on two farms may have warranted an F5 rating. This tornado tore through open farmland across central Nebraska. It touched down near Anselmo in Custer County and moved due east across the barren plains. It crossed the Loup River just south of Sargent and moved into Valley County, lifting just north of Ord. Fortunately, throughout most of the tornado’s path, there was hardly a fencepost, let alone homes. However, just east of the tiny farming community of Gates, roughly halfway between Anselmo and Sargent, a farm was wiped from the face of the earth. All buildings were completely swept away and heavy machinery was thrown great distances. Some of the heavy equipment was never found. Thirty head of cattle were also killed. This tornado was officially rated F4 but is widely believed to have been an F5. Like Murphysboro, Illinois, Wichita Falls, Texas is synonymous with tornadoes. It has become part of tornado lore. 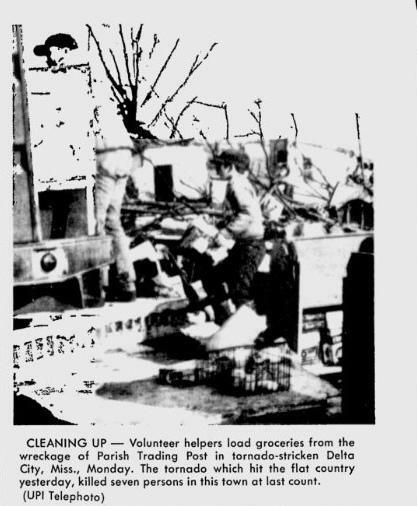 On April 10, 1979, a massive, F4 tornado tore through the heart of the city. Wichita Falls was devastated. Entire neighborhoods were wiped out and 42 people were killed. Over 1000 homes were heavily damaged or destroyed. At the time, it was the costliest tornado ever recorded in terms of property damage. This is the tornado that Wichita Falls is famous for. However, 15 years earlier, and ten years to the day before the legendary Super Outbreak, another even more powerful tornado hit the city. This spectacular image of the tornado entering Wichita Falls was captured by a local news tower cam. It touched down near the intersection of Seymour Highway and US 82 on the west side of town at 2:50pm and moved north-northeast. The tornado quickly intensified as it moved through more sparsely populated areas just west of the main residential section of Wichita Falls. Sirens were sounded in the city and the tornado was highly visible, undoubtedly saving many lives. It crossed Iowa Park Road and ripped through the Sunset Terrace subdivision. Numerous homes were destroyed and some were completely swept away, leaving only the foundations. The Lincoln Heights subdivision was also hard hit. 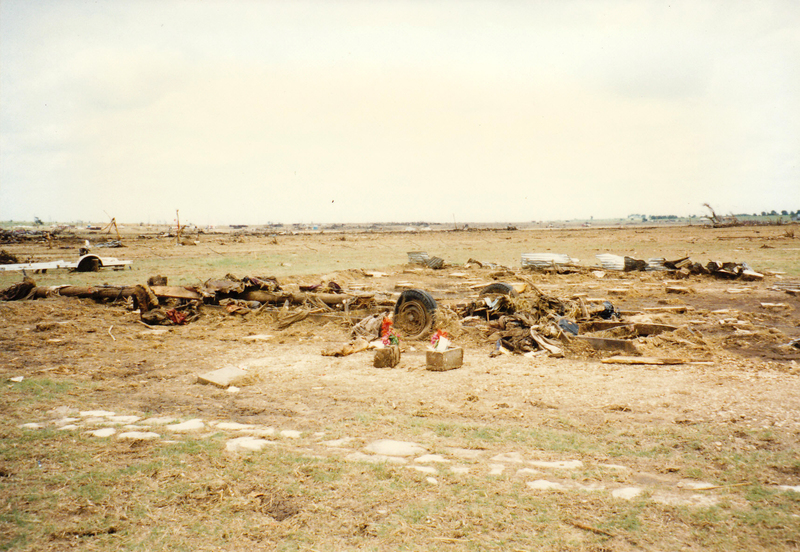 The tornado then struck Sheppard Air Force Base and adjacent housing units, causing widespread destruction. As in Sunset Terrace, numerous homes were obliterated. One survivor reported being thrown from his house as it disintegrated and seeing an 18-wheel tractor trailer swirling through the air like a toy inside the tornado’s funnel. Some guests in his home were killed. On base, a concrete aircraft hangar where 300 people were taking shelter was heavily damaged but no one inside was harmed. 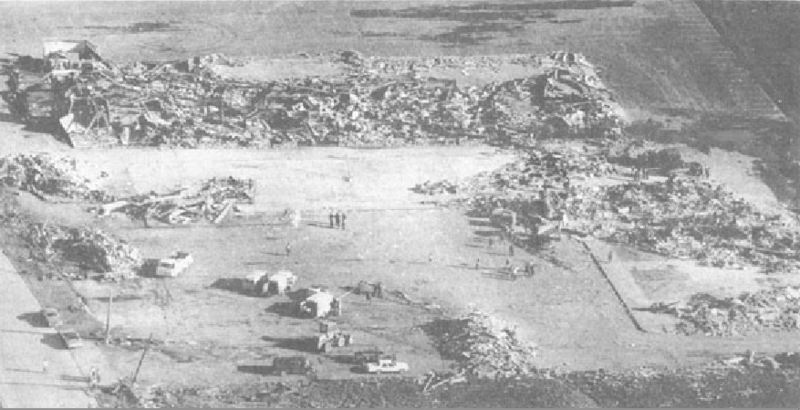 Fifty base buildings were destroyed or severely damaged. The tornado lifted a short distance north of the base. Seven people were killed, 111 were injured and 225 homes were completely destroyed. This tornado caused extensive devastation across portions of east-central Nebraska. It touched down near the city of Hastings at around 6:30pm and moved northeast. It derailed a few railroad cars east of town and wrecked a nearby municipal airport. The tornado intensified as it moved through Clay County and into Hamilton County. It devastated several farms west of Henderson before moving between Hampton and Bradshaw, crossing into York County. Some 14 farms around and just west Bradshaw were wiped out, and some were completely swept away. At least two people were killed in this area. The tornado weakened a bit as it continued northeast, heavily damaging four farms near Benedict, however it would restrengthen as it moved through rural Polk County. It devastated two farms in the Shelby area. Two trucks were flung through the air, landing some distance away. Two people were injured when a farmhouse was obliterated. The tornado steadily weakened thereafter, lifting near Bellwood in northwestern Butler County. At least two people were killed (some sources say four) and some 50 more were injured. The Palm Sunday outbreak of April 11, 1965 was one of the largest and most violent outbreaks in recorded history. 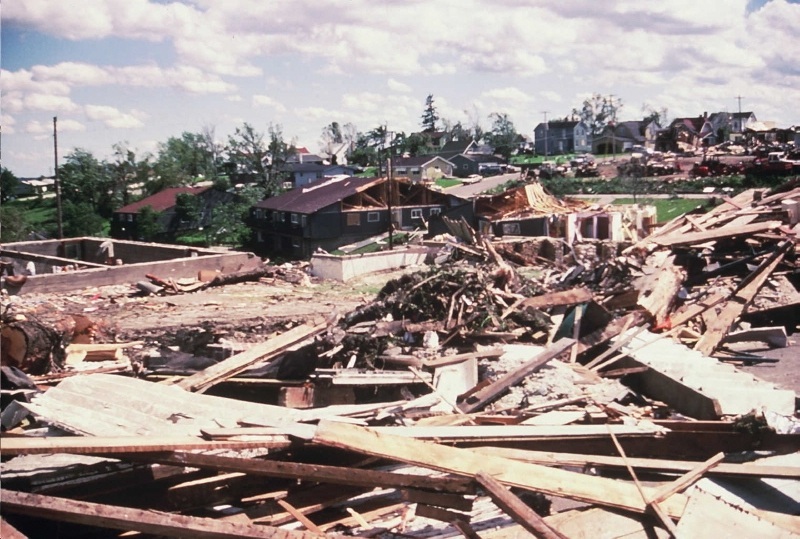 Forty seven tornadoes devastated portions of the upper Midwest and Great Lakes region, with Indiana, Michigan and Ohio being particularly hard hit. As day broke on April 11, a powerful, occluded mid-latitude cyclone was digging into the central United States. Somewhat atypical of major outbreaks, the greatest instability and most of the tornadoes occurred along and ahead of the warm front. Strong southerly flow from the Gulf of Mexico generated very strong temperature gradients and incredible instability along the warm front. Tornado alerts were broadcast across the Midwest but nobody could’ve foreseen the devastation that was to come. The chaos began shortly before 1pm when a long track F4 ravaged rural areas of eastern Iowa. Dunlap was a small community in northern Indiana just south of Elkhart. It was made up of small suburban homes and working class neighborhoods. At 6:15 local time, a tornado touched down near Wakarusa near the St. Joseph-Elkhart County line and moved northeast. This tornado grew into a powerful F4. 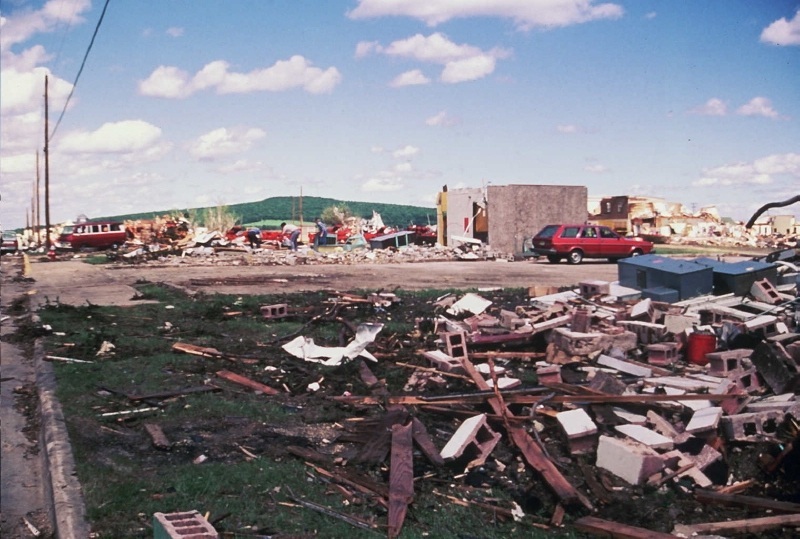 Passing between Dunlap and Goshen, it devastated the Midway Trailer Park, killing ten people, before ripping through Middlebury, demolishing several homes and killing another four. An airplane wing from the Goshen Municipal Airport was found 35 miles away near Centerville, Michigan. This tornado is famous for spectacular images taken by reporter Paul Huffman showing a massive double funnel as the tornado bore down on Midway Trailer Park. Damage in the Sunnyside subdivision. Just 45 minutes later, another tornado touched down about five miles south of South Bend and moved east northeast directly for Dunlap. It ripped through the north side of Dunlap as a powerful, half-mile wide tornado. The Sunnyside housing addition was obliterated. Dozens of homes were completely destroyed and many were completely swept away, leaving only bare foundations. The nearby Sunnyside Mennonite Church was also wiped out, though fortunately nobody was inside. 28 people died in Sunnyside alone. Another six people were killed when the tornado annihilated a truck stop at the intersection of Highways 15 and 20 four miles northeast of Sunnyside. The tornado then passed north of Middlebury before moving into rural Lagrange County, lifting near Interstate 80-90 just south of the Michigan state line five miles southwest of Sturgis. In all, 36 people were killed and over 300 were injured. It was Indiana’s worst tornado in nearly 50 years. 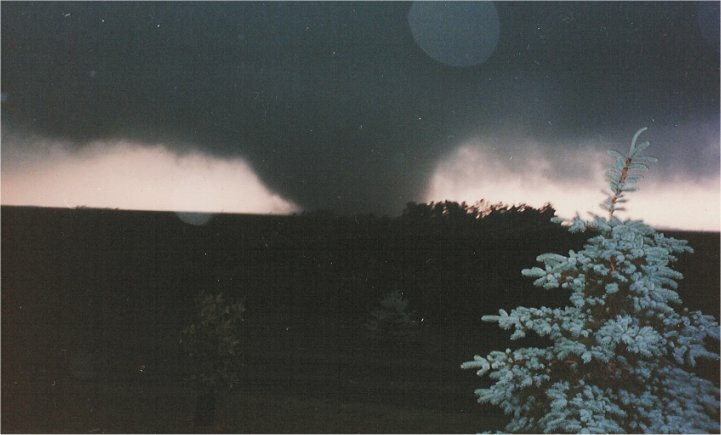 This tornado, along with the Pittfield-Strongsville tornado in Ohio later that night, was initially rated F5, but, in a controversial decision, both tornadoes were subsequently downgraded to F4. The severity of the damage at Sunnyside and the truck stop has led modern researchers to question that decision. These tornadoes are both widely believed to have been F5s. The devastation in the village of Pittsfield two days after the tornado. The devastation continued throughout the evening and into the night that terrible Palm Sunday. 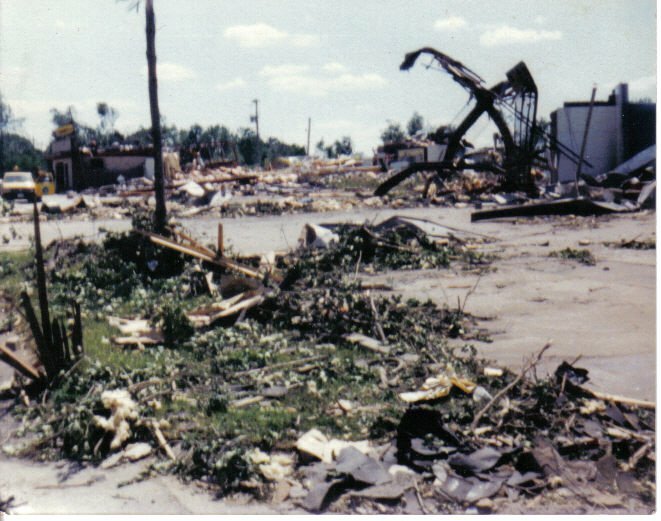 Shortly after the Dunlap tornado, a mile-wide F4 wiped out the community of Russiaville in Howard County before devastating southern portions of Kokomo. Greentown was also hit hard. 25 people were killed. Just half an hour later, another tornado ravaged rural neighborhoods near Lebanon and Sheridan about ten miles northeast of Indianapolis, killing 28. 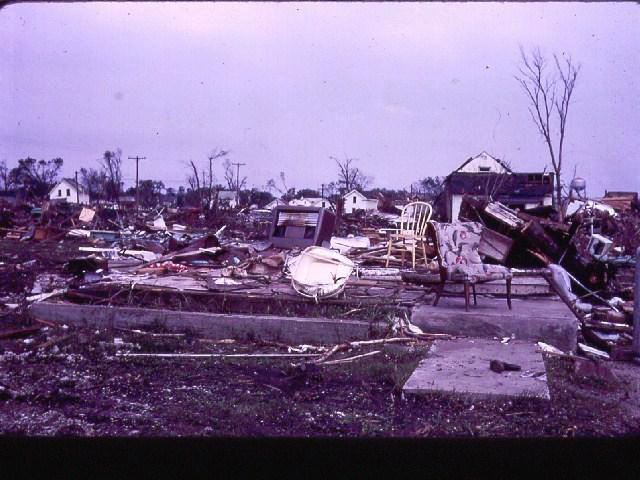 Two F4 tornadoes followed virtually the same path in southern Michigan, devastating the Manitou Beach-Devils Lake area. Coldwater Lake and Hillsdale were also hard hit. The tornadoes killed a combined 44 people. 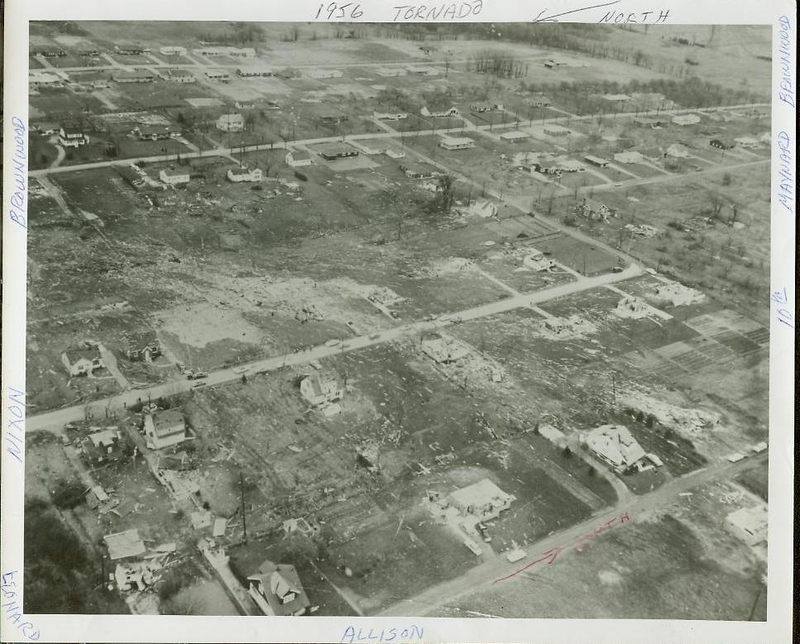 Yet another violent tornado tore through the north side of Toledo, demolishing numerous homes and killing 18 people. However, by 10pm, most thought the nightmare was over. Particularly for the people of eastern Ohio, who believed the chaos (the true extent of which was not yet known) was west of them and had burnt itself out. Shortly after 11pm, however, a tornado touched down over rural Lorain County southwest of Oberlin and moved northeast. It rapidly intensified into a monstrous tornado nearly a half mile wide. It slammed into the small village of Pittsfield without warning. The town was obliterated. Nearly every structure was destroyed and some homes were wiped from the face of the earth. Seven of the town’s fifty residents were killed. Continuing northeast, the tornado, now weaker, struck the town of Grafton, causing severe damage to some two hundred homes. It was in this area that eyewitnesses reported seeing multiple funnels swirling within the vortex. One of them split off and headed more north-northeast while the main funnel continued northeast. The tornado restrengthened as it bore down on the suburbs of Cleveland. It slammed into northern portions of Strongsville as a half mile wide F5. Rows of homes were annihilated, many of which simply vanished. 18 people died, some 200 more were injured, and hundreds of homes were completely destroyed. Like the Dunlap tornado, this tornado was initially rated F5 but later downgraded to F4. The decision remains controversial and both tornadoes, particularly the Pittsfield-Strongsville tornado, are widely believed to have been F5s. 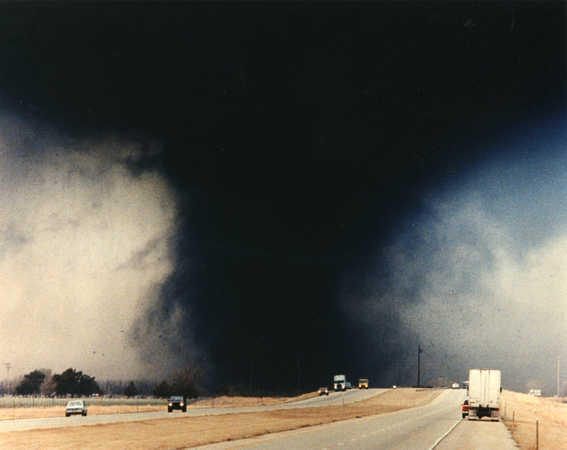 The Palm Sunday Outbreak produced 47 tornadoes and 17 violent tornadoes (F4-F5), second most for a single-day outbreak in recorded history. Those tornadoes caused incredible devastation and killed 271 people. Roughly a month after Palm Sunday, another large tornado outbreak struck the central United States, this time across the northern Great Plains of Nebraska and South Dakota. This massive tornado devastated farm country in rural south-central South Dakota. It touched down near the Nebraska border ten miles south of Colome and moved north-northeast. It soon grew into a monstrous, mile-wide F5. It devastated seven farms as it passed just east of Colome. Three were wiped from the face of the earth, the debris scattered for miles downstream. The tornado would continue for another seven miles or so before lifting over rural areas eight miles south of Hamill. 25 farms were heavily damaged or destroyed but fortunately nobody was killed and just one person was injured. This tornado was reportedly accompanied by multiple satellite tornadoes, at least one of which was surveyed by the National Weather Service. Devastation in the residential section of Primrose, including a home that’s been swept away. Just fifteen minutes after the Colome tornado, another powerful tornado touched down in eastern Nebraska. This tornado or family of tornadoes left a 125 mile path of destruction across seven counties. It touched down a few miles west of Grand Island and moved north-northeastward. Moving into Howard County, the tornado ripped by St. Paul, causing extensive damage to farms. A farm was flattened a few miles east of Wolbach near the Greeley County line. The tornado intensified even more as it moved through southeastern Greeley County and into Boone County. Primrose was, at the time, a small village of 129 people on the north bank of the Cedar River. The tornado tore through the town at around 7pm as a half-mile wide monster. Primrose was devastated. Three quarters of the town was obliterated. Some homes were completely swept away, leaving only the foundations. Cars were thrown 300 yards through the air. The body of a truck was found two miles away from where it originated. Fire swept the ruins in the wake of the tornado and the town’s only firehouse was destroyed, so firefighters rushed from nearby towns to extinguish the blaze. The tornado continued north-northeastward after passing Primrose, curving more to the northeast as it passed between Petersburg and Elgin and into Antelope County, causing significant damage to farms along the way. Crossing into Pierce County, it passed between Plainview and Osmond as a weaker tornado before lifting near Wausa in Knox County. Four people were killed, all of them in Primrose, and 53 were injured. Papers and other lightweight debris from Primrose were found up to 55 miles away. The town has declined considerably since the tornado. Its population at the 2010 census was just 61. This tornado was officially rated F4, but it has been suggested by modern experts that the damage in Primrose may have warranted an F5 rating. 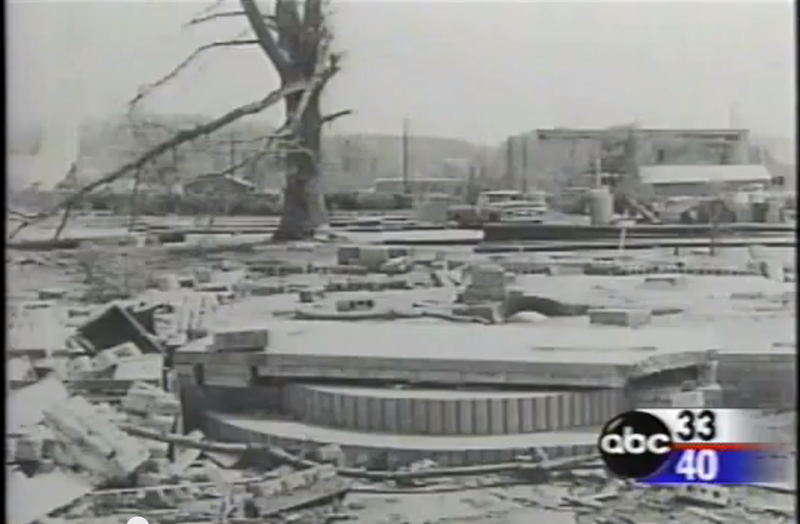 The tornado forecast and warning system had come a long way by 1966, but the devastating Candlestick Park tornado demonstrated just how hard it is to keep people safe. It was an unusually warm late-winter day in the southeast, with morning temperatures in the 70’s and dewpoints in the 60’s. Significant dry, stable air in the mid levels of the atmosphere (a “capping inversion”) precluded a widespread outbreak, but several strong discrete cells developed across the lower Mississippi Valley. The tornado touched down at around 4pm near old Adams Station in western Hinds County southwest of Learned and moved northeast, strengthening rapidly. It caused major damage to rural homes and farms and toppled a large TV tower. 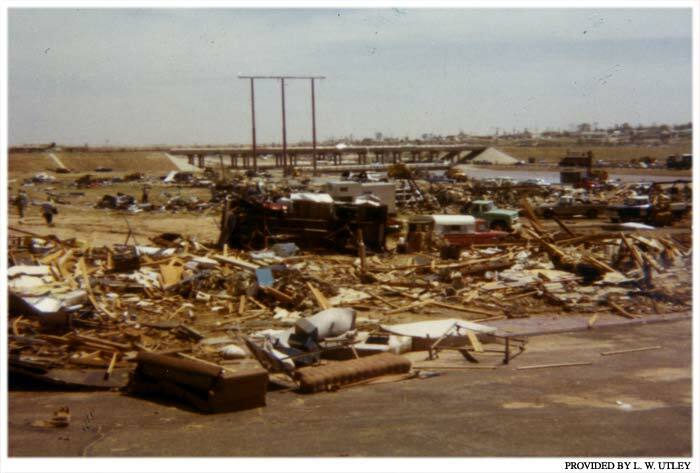 Aftermath of the tornado at the Candlestick Park Shopping Center. By the time it reached the Mississippi state capital of Jackson, it was a half-mile wide monster. It ripped through the southern portions of the city at around 4:30pm. It was the start of evening rush hour and numerous cars were on the roads. The tornado slammed into the crowded Candlestick Park shopping center on Cooper Road and the entire complex was flattened, trapping dozens of people inside when the roof collapsed on top of them. Cars in the parking lot were picked up and thrown hundreds of yards. Pavement was scoured from the ground. Nearby homes and businesses were also destroyed. Nineteen people were killed in the Jackson area, most of them at Candlestick Park. Some vehicles were reportedly thrown half a mile. 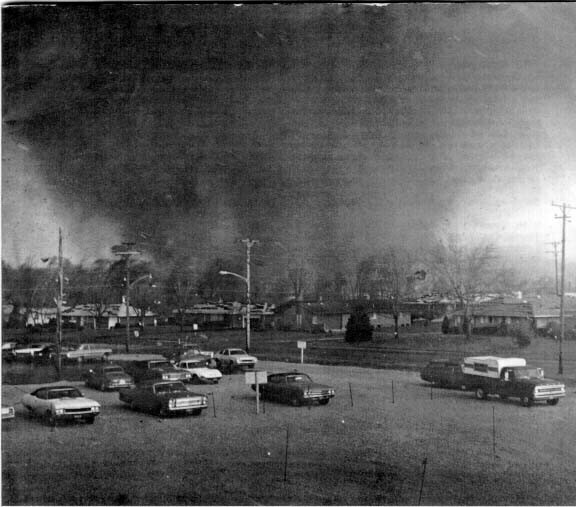 The tornado then crossed the Pearl River into Rankin County, causing heavy damage to an industrial area near Flowood and ripping past the then three year old Jackson Municipal Airport (now Jackson-Evers International Airport). The tornado continued into rural areas, obliterating several homes in the area of Leesburg and killing six people. It remained incredibly powerful as it moved into Scott County. Rural homes near Branch and Forkville simply vanished. Pavement was scoured from the roads and large swaths of trees in Bienville National Forest were annihilated. 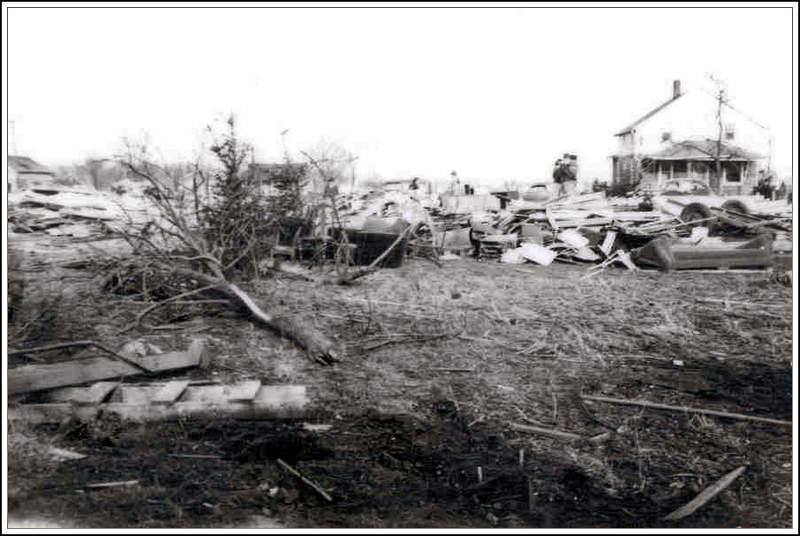 Further northeast, several homes near the village of Midway were heavily damaged. 26 people died in rural Scott County alone. The tornado crossed into Leake County just south of Walnut Grove along Highway 36 and the destruction continued. Some 40 homes and other buildings were demolished between the communities of Madden and Salem and six people were killed before the tornado moved into Neshoba County. A dozen homes were heavily damaged or destroyed near the community of Dowdville and one person was killed. The tornado finally lifted a few miles to the northeast. The original official track continued the tornado all the way to Tuscaloosa County, Alabama. The tornado is now no longer believed to have been continuous for that long. The same supercell, however, would continue to produce tornadoes well into Alabama. In all, 58 people were killed, 500 were injured and hundreds of homes were destroyed. It was Mississippi’s worst tornado since 1942. The tornado ripping through a residential section of Topeka. According to Native American legend, Burnett’s Mound on the outskirts of Topeka, Kansas protected the river valley in which the Kansas capital now sits from tornadoes. Tornadoes that attempted to cross the mound (believed to be a burial mound) would disintegrate. According to Kansas historical records, ten tornadoes had hit the city since 1887, but none of them were particularly strong or did much damage, and none had hit the city in the previous 16 years of official record. 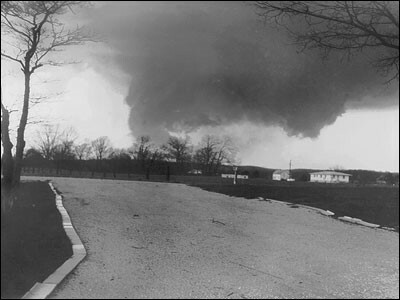 The tornado that would destroy that sense of security touched down at around 7pm on a muggy night in June, 1966 in southwestern Shawnee County near the intersection of Crawford Road and 89th Street and moved northeast, steadily intensifying. The tornado was not spotted on the National Weather Service’s outdated radar and took Topeka by surprise. It ripped through rural areas southwest of town headed directly for the city. After leaving Washburn, the tornado roared into downtown. Train cars on the Santa Fe Railway were thrown from the tracks. Employees in downtown office buildings went scrambling for cover as hundreds of windows blew in and debris crashed into the city’s high rises. The tornado narrowly missed the state capitol building, the dome sustaining minor damage from flying debris. Moving into East Topeka, the tornado continued to cause heavy damage. Lime and Lake Streets were particularly hard hit. Entire blocks were flattened. The tornado weakened slightly before hitting the municipal airport, flipping over several airplanes and damaging some of the buildings. The National Weather Service office was located at the airport and forecasters quickly sought shelter as the tornado narrowly missed the building. After leaving the airport, the tornado jumped across the Kansas River, lifting back into the clouds shortly after reaching the north bank. In all, 16 people were killed and 450 were injured. 820 homes and 250 businesses were completely destroyed. Damage came to $100 million. It was weeks before power and other utilities were restored, and the myth of Burnett’s Mound, like much of Topeka, was gone. October is typically a very quiet month for severe weather. Conditions are normally very unfavorable for thunderstorm development. Since 1950, only seven violent tornadoes have occurred in October. All but two of them were in the first few days of the month and one was spawned by a hurricane. Only three occurred on the Great Plains. Prior to 1950, an estimated 12 occurred dating back to the mid 1870’s. This one remains the only F5. It was homecoming weekend in Belmond, Iowa, a small town in the north central part of the state along the banks of the Iowa River, and the locals were getting ready for some Friday night football. The team from local Belmond High School was due to face a team from Lake Mills that night and there was a parade slated for that afternoon. The parade took place as scheduled shortly after 2pm under somewhat ominous skies and the threat of severe weather later that afternoon. But the weather was far from everybody’s minds. It was October, after all. The tornado touched down three miles southwest of town at around 2:45pm just as the parade was ending. Just 15 minutes later, it slammed into Belmond as a monstrous F5 three-quarters of a mile wide. Students who had just returned to school from the parade were immediately herded into basements. The town’s business district and numerous homes were destroyed and some were completely swept away. Nineteen cars of a freight train were thrown from the tracks. Six people were killed and 172 were injured, a total greatly lessened by advance warning. The tornado lifted five miles northeast of Belmond just west of the town of Meservey. The F5 rating of this tornado has been disputed by modern experts. The tornado threw this piece of metal debris with such force that it was speared on a bolt on a steel truss tower. Several of these towers were snapped off at the base and thrown. This tornado carved a swath of destruction across portions of Kentucky and southern Ohio, devastating the Ohio River town of Wheelersburg. It touched down in far northeastern Kentucky at around 4pm near the town of South Shore and moved east northeast, rapidly intensifying. It roared across the Ohio River into Wheelersburg as an F4 a third of a mile wide. Cars were thrown from Route 52 along the riverbank. A train moving along an adjacent railway was derailed, the cars tossed clear of the tracks. The tornado caused heavy damage to the old Wheelersburg Cemetery and neighboring residential areas. It continued to intensify as it moved through Wheelersburg. By the time it reached the Dogwood Ridge subdivision on the northeast side of town, it was an F5. Over a hundred homes were destroyed and many more were heavily damaged. Some were completely wiped from their foundations. This anchored home was nearly swept away. After leaving Wheelersburg, the tornado moved through rural areas of southeastern Ohio, causing significant damage in and around the communities of Lyra and Buckhorn before moving into Gallia County. Significant damage also occurred in the area of Centenary before the tornado struck Gallipolis, destroying eight homes. Fifteen buildings were damaged at the Gallipolis State Institute. The tornado lifted as it was crossing the Ohio River into West Virginia. In all, seven people were killed, at least a hundred were injured (some sources say 200), and hundreds of homes were destroyed. Damage came to roughly $2 million. Some modern experts have called the F5 rating into question, alleging that the homes that were swept away were not properly anchored. A spectacular view of the tornado taken by a local sheriff along highway 14 when the tornado was two miles southwest of Charles City. 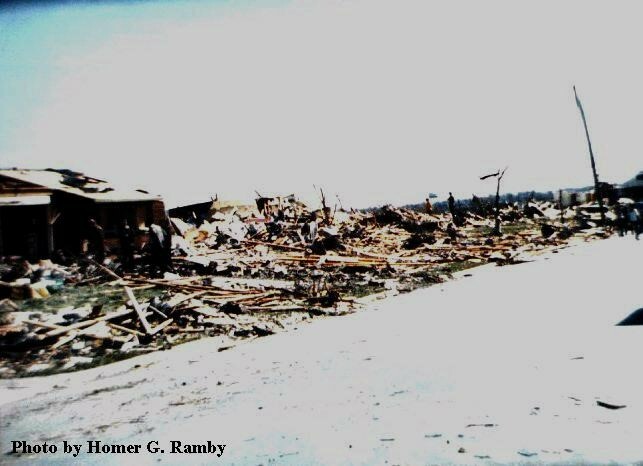 On May 15, 1968, two F5 tornadoes devastated two towns in northeast Iowa. The two tornadoes formed in the warm sector of an occluded low pressure system. The surface layer was capped by an inversion (dry air aloft), which, while inhibiting widespread thunderstorm development, also allowed instability to build up in the atmosphere that could be unleashed with a significant enough source of rising air at the surface (like a front). Shortly after 4pm, a tornado touched down over northeastern Franklin County near the town of Hansell and moved northeast. It skimmed by the town of Aredale in Butler County, where two funnels were sighted. Most of the buildings on a farm just east of town were destroyed. Debris from another farm five miles northeast of Aredale was found half a mile away. Moving into Floyd County, the tornado passed by Marble Rock, where it evolved into a single funnel and began to intensify. By the time it reached Charles City, it was an F5 half a mile wide. It tore through the heart of the town at 4:50pm, causing widespread devastation. Rows of homes, covering eight city blocks, were annihilated, and some were completely swept away. A new housing project was leveled. A local department store was also flattened and the business district was heavily damaged. 372 homes and 58 businesses were completely destroyed and together another 278 sustained major damage. Debris from Charles City was found up to 80 miles away. One of the many obliterated homes in Charles City. Continuing northeastward, the tornado passed by the village of Colwell before clipping Chickasaw County and moving into Howard County. It struck the town of Elma, causing extensive damage; destroying five homes and damaging numerous others. Turning more to the north, the tornado finally lifted near the town of Chester near the Minnesota state line. Thirteen people were killed, all of them in Charles City, and 462 more were injured. The day’s events, however, were only just beginning. Just seven minutes after the first F5 hit Charles City, another tornado touched down just south of Oelwein near the Fayette-Buchanan County line and moved north-northeast, rapidly intensifying. It ripped right down Oelwein’s main boulevard, Frederick Avenue, as an F5 nearly half a mile wide. It took the town completely by surprise. The tornado sirens sounded for about 15 seconds before the power failed. 68 homes were destroyed and another 132 were heavily damaged. Some homes were completely swept away. 51 businesses, two churches, an elementary school and the middle school were also destroyed. The business district was ravaged. In addition to the 51 destroyed, virtually every building suffered damage. Guy Atkinson surveys his demolished home in Oelwein. The tornado continued north-northeast, ravaging farms over rural Fayette County. At least four farms were wiped out and several others were severely damaged. The tornado then slammed into Maynard. The devastation was just as bad as at Oelwein. Five city blocks were virtually obliterated and some homes were completely swept away. Twenty-five homes and a large, brand new, Lutheran church were destroyed. The tornado lifted near the town of Fayette four miles northeast of Maynard. In all, five people were killed, 156 were injured, and roughly a hundred homes were destroyed. Eric Lantz’s spectacular photo of the tornado. One month after the Iowa F5s, another one struck southwest Minnesota. This spectacular stovepipe tornado touched down near Lake Sarah in Murray County and moved northeast over open farmland. It quickly intensified as it moved into extreme southeast Lyon County, headed right for the town of Tracy. A farmer who saw the tornado southwest of town called the volunteer fire department in Tracy to warn them of the tornado. The town’s tornado siren sounded, but it was too late. The devastation at the Tracy Elementary School. The tornado ripped through Tracy at 7pm as an F5 just a quarter of a mile wide. Many homes simply vanished. Some of the homes had plumbing left but little else. Two 25-ton boxcars were hurled three blocks through the air over rooftops, landing in the heart of the debris field. Numerous cars were also thrown great distances, leading to the deaths of three people. 111 homes were completely destroyed and 76 were severely damaged in the town of 2,800. The tornado continued five miles northeast of town before lifting over rural Redwood County. In all, nine people were killed and 150 were injured. The farmer who called the local fire department, Delpha Koch, a local police officer and a train crew are credited with alerting residents to the danger and greatly reducing the death toll. 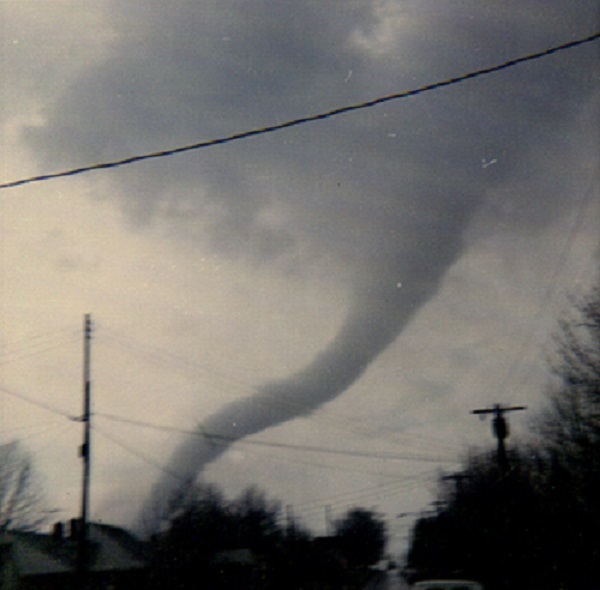 This tornado has been popularized by the spectacular photograph taken by 16 year old Eric Lantz for his uncle’s newspaper, the Walnut Grove Tribune. It was nominated for an award by the National Newspaper Association. Tornadoes are typically thought of as uniquely American phenomena. However they are found throughout the world. Hot spots are found in the backcountry of Argentina, portions of Europe (particularly Russia), and Australia. 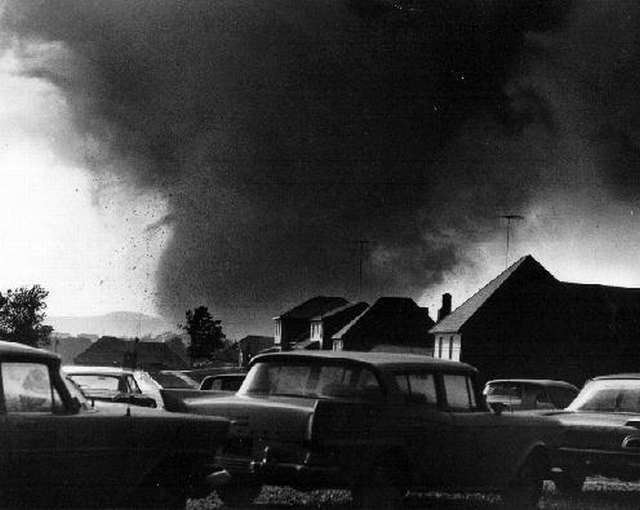 In 1967, a pair of violent tornadoes caused major damage to portions of France. Other destructive tornadoes have been reported in the Netherlands, Italy, Poland, and South Africa. Devastating outbreaks in Argentina in 1973 and Russia in 1984 will be discussed later in this article. Six international tornadoes grace this list: three from Canada, and one each from Argentina, Russia, and Australia. Tornadoes are not uncommon in Australia, with about a dozen or two touching down each year. This one is thought to be the most powerful and destructive in the country’s history. It struck rural areas near the town of Bulahdelah in New South Wales. It carved a path of destruction 14 miles long and up to a mile wide through the Bulahdelah State Forest. Over a million trees are believed to have been destroyed or stripped of their branches. A two-ton tractor was thrown some 300 yards through the air and a caravan was also thrown a great distance and destroyed. Debarking of trees and significant disruption of topsoil was also observed. This damage has led some tornado experts to believe that this tornado may have been an F5. Luckily, no one was seriously injured by this tornado. The Western Ways Motel was obliterated by the tornado. 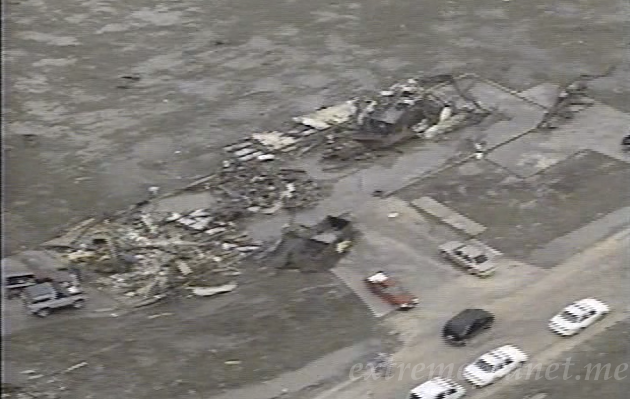 Exactly 17 years after Waco, another Texas city was devastated by an F5 tornado. A “dryline” in meteorological parlance is like a front, but instead of separating two air masses of different temperatures, it separates two air masses of drastically different moisture levels. These boundaries often produce favorable conditions for thunderstorms to develop. Tornadoes spawned by dryline thunderstorms are very common in west Texas and the Texas Panhandle. Occasionally, they can be exceptionally powerful. The Lubbock tornado, however, was not a typical dryline event. The greatest instability typically occurs when the dryline is progressive. But if there’s not a storm system to move it, it will advance during the day as the air warms but then retreat during the evening as it cools. The latter is not the type of situation you would expect to find strong thunderstorms, but on May 11, 1970 a small cluster of strong cells formed along a retreating dryline and headed straight for Lubbock. It was a typical May day in Lubbock, Texas: hot and dry. Storms initially weren’t even forecast. What happened that night would take everybody by surprise. As the day wore on, skies became more ominous and humidity went up. By dinner time, thunderstorms began to pop up in the area, progressively increasing in intensity. At 8:10pm, a small tornado touched down in the eastern suburbs of Lubbock but did little damage. Then, an hour and a half later, another tornado touched down at the intersection of 22nd Street and University Avenue, just three blocks south of Texas Tech University, and moved northeast. It exploded into a monstrous F5 over a mile wide as it tore through the heart of the city. Entire neighborhoods and the main business district were devastated. Numerous homes in the Overton and Guadalupe neighborhoods simply vanished. Much of Guadalupe was destroyed. Large residential sections of Lubbock were devastated. The tornado turned more northward as it raked by MacKenzie Park. Nearly all the homes along Mesa Road by the Lubbock Country Club were severely damaged or destroyed. 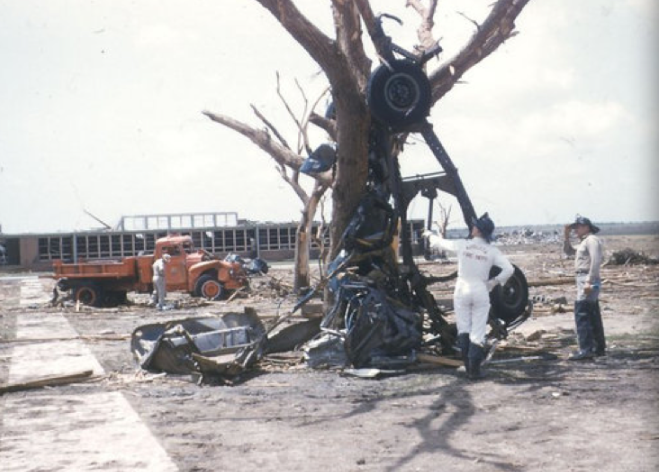 Now somewhat weaker, the tornado then ripped right through the municipal airport (now Preston Smith International Airport), destroying over a hundred private planes and 19 military planes. It passed directly over the local National Weather Service office, where forecasters scrambled for cover. The tornado continued north of the city, where an industrial area suffered severe damage. Heavy, metal covers were pealed off the tops of silos like tin cans. A 26,000 pound fertalizer tank was reportedly thrown nearly a mile through the air and several other large tanks were thrown hundreds of yards. A train car was also rolled fifty yards. However, the tornado quickly weakened thereafter, passing near the towns of New Deal and Abernathy before lifting near the town of Petersburg. Downtown Lubbock looked like a war zone. The 271-foot Great Plains Life Building nearly took a direct hit. The entire structure was damaged so severely that it was feared it would collapse. The steel frames on the building’s south side were significantly deformed and most of the windows were blown out. Amazingly, the building survived and is now called the Metro Tower. 430 homes, some 600 apartments, and over 250 businesses were destroyed. Some homes simply disappeared. One was reportedly lifted into the air and carried into a field 200 yards away and destroyed, killing a family of five. In all 26 people died and some 500 were injured. Damage totaled $250 million, equivalent to over $1.4 billion in 2012, making it the costliest tornado in history until it was surpassed by the Omaha tornado of 1975 (it now ranks seventh). It was Texas’ worst tornado since Waco. Severe weather is not uncommon in February, particularly in the south. Powerful tornadoes, however, are relatively rare in February, but when they happen, they are often very destructive. No February outbreak was more destructive than the one that hit the lower Mississippi Valley on February 21, 1971. It was spawned by a powerful occluded low pressure system that ripped through the central Great Plains, bringing heavy snows to the Midwest and sparking significant instability and tornadoes in the south. Two powerful, long track tornadoes would devastate large swaths of western Mississippi and northeastern Louisiana. A destroyed home in Delta City. The first was the most powerful. It formed about three miles south of Delhi, Louisiana and moved northeast, strengthening quickly. It ravaged the small village of Waverly a few miles east of Delhi, demolishing several homes, some of which were swept away, and killed multiple people. 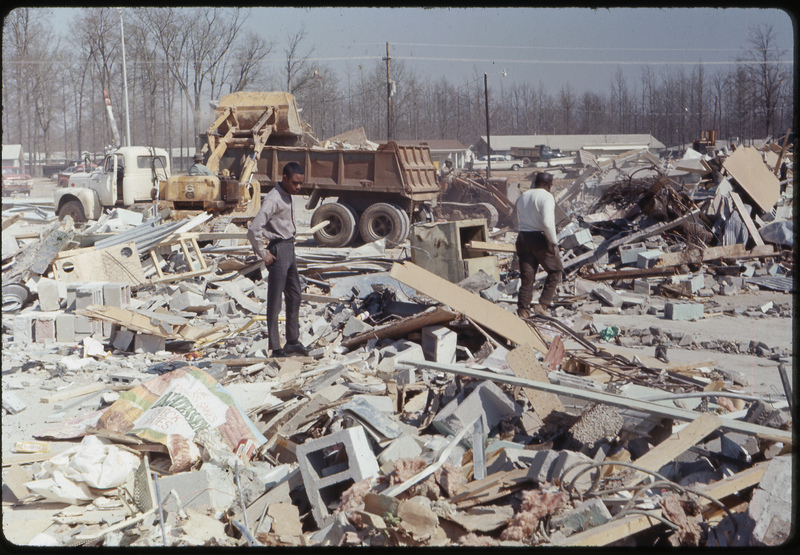 More homes were destroyed in the Alsatia and Transylvania areas before the tornado crossed the Mississippi River into Mississippi. Eleven people were killed in Louisiana. 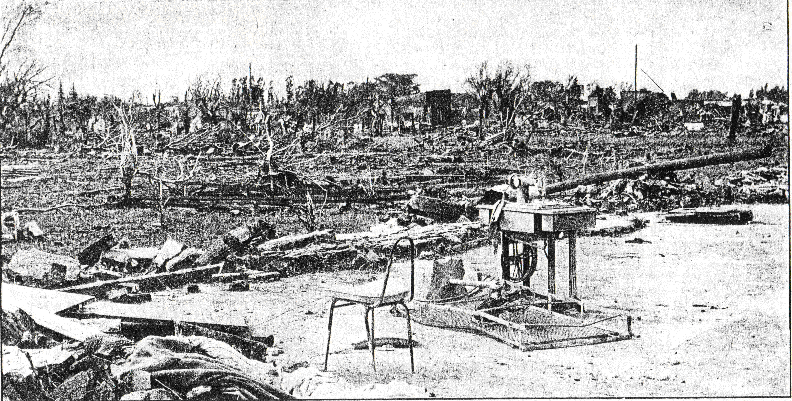 The tornado passed between Mayersville and Rolling Fork before striking the town of Delta City, destroying several homes and killing seven people. Clipping Washington and Humphreys Counties, the tornado passed very near the town Isola before moving into Sunflower County. 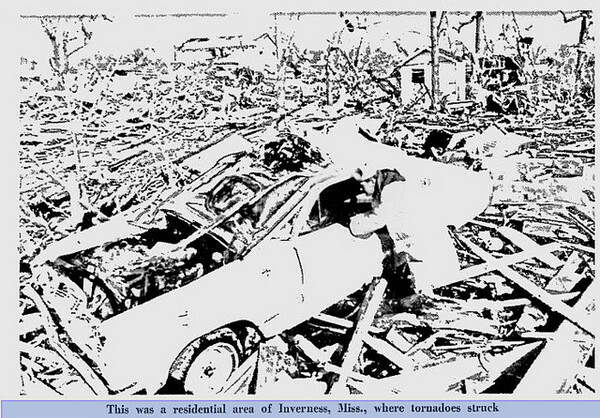 After weakening somewhat between Delta City and Isola, the tornado rapidly restrengthened as it bore down on the town of Inverness. The tornado slammed into Inverness shortly after sunset as an F5 a third of a mile wide. Over half the town was destroyed and several well built homes were completely swept away. Entire neighborhoods were leveled and 21 people were killed. 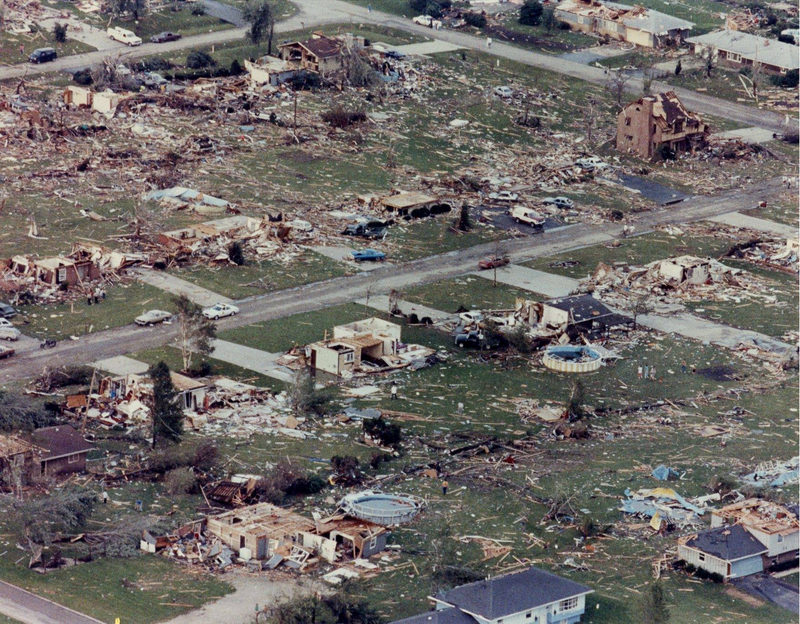 Continuing northeast, the tornado struck the town of Moorhead, killing four people and virtually leveling the town’s northwest side. The tornado crossed into Leflore County, steadily weakening, finally lifting just south of Schlater after traveling 109 miles. Devastation in the residential section of Inverness. In all, the tornado killed 47 people, injured 510 and destroyed hundreds of homes. Some homes, particularly in Waverly and Inverness, were wiped from the face of earth, including well built brick structures. 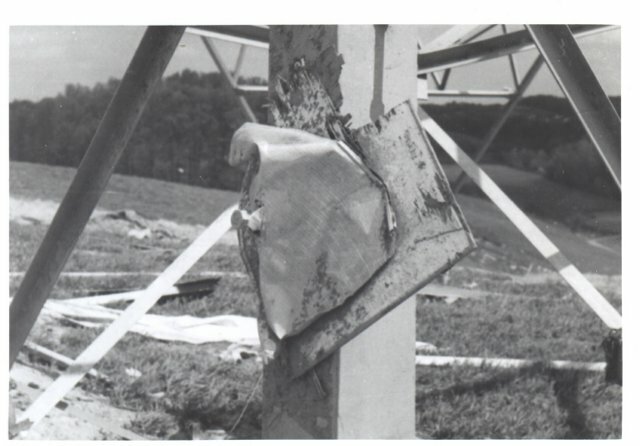 Metal frames from mobile homes were reportedly wrapped around trees like bits of wire. Bodies and boards were carried great distances and deposited over rural fields well away from towns. The outbreak, however, was just beginning. Just an hour after the first one, another massive, long-track tornado, this one an F4, touched down over western Mississippi and moved just east of and nearly parallel to the path of the first tornado (the two tornadoes were concurrent for a portion of their paths in Mississippi). It devastated the towns of Cary in Sharkey County and Morgan City in Leflore County, as well as the small communities of Swiftown and Pugh City. 21 people died in Pugh City alone and the town no longer exists. The tornado killed 58 people and injured 800, destroying hundreds of homes, some of which were swept away. It also affected the large towns of Greenwood and Oxford. It officially traveled 202 miles, not lifting until it had crossed into Tennessee, but is believed to have been a tornado family. Another F4 tornado traveled 68 miles through central Mississippi, causing major damage in Yazoo County. The towns of Little Yazoo and Benton were particularly hard hit. 13 people were killed. 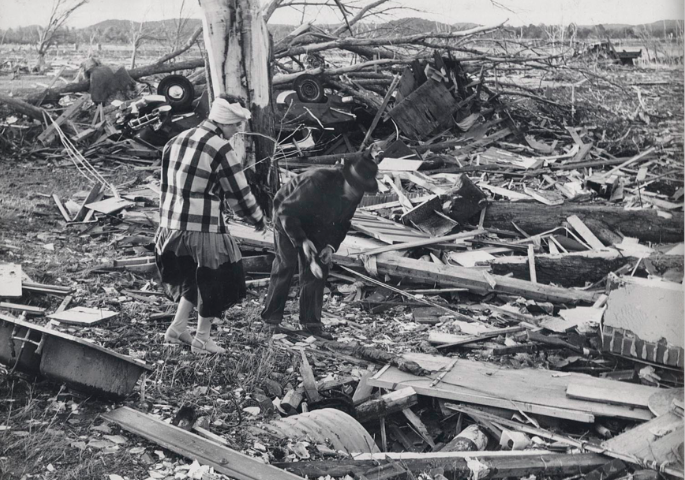 The three tornadoes combined to kill 118 people and lay waste to large portions of Mississippi. A swept away home in San Justo. The plains of the western Pampas and southern Gran Chaco of Argentina and Paraguay experience tornadoes fairly often. In 1926, a powerful tornado reportedly killed hundreds and destroyed hundreds of homes in Paraguay. 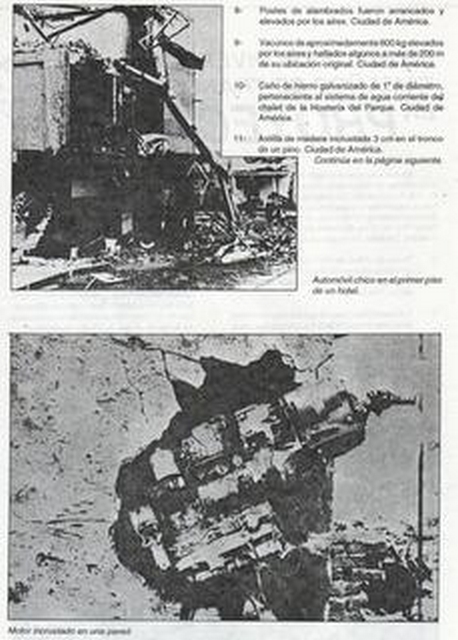 More recently, on April 13, 1993 (southern hemisphere autumn), a widespread outbreak caused major damage to numerous communities near the capital of Buenos Aires and killed five people. On September 7, 2009, a powerful tornado reportedly demolished the Santa Rosa community in Misiones Province in the northeastern part of the country, killing ten. 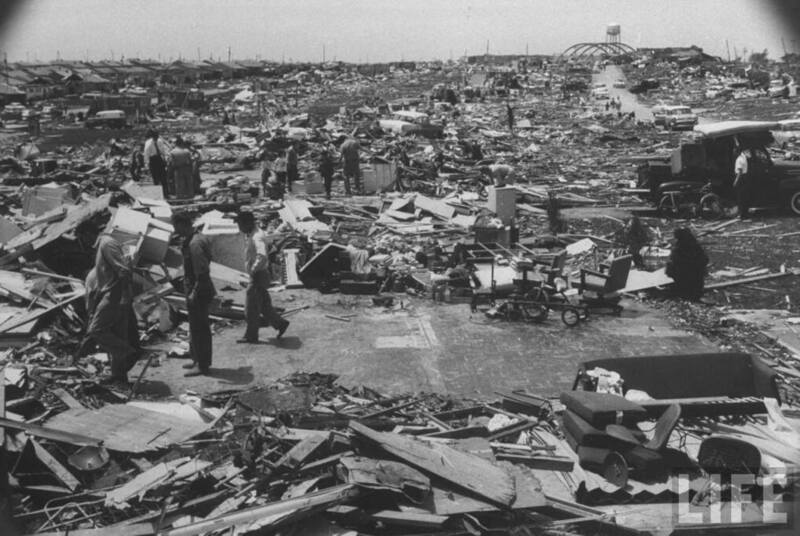 The 1973 tornado, however, was the deadliest and most powerful in the country’s history. This photo of an engine block embedded in a concrete wall was published in a local newspaper. It devastated the town of San Justo, Santa Fe Province on January 10, 1973. Numerous homes were destroyed and some completely vanished, with little debris remaining at the site. Vehicles were thrown hundreds of yards through the air and destroyed beyond recognition. A tractor weighing as much as a small car was thrown 500 meters (roughly 550 yards) into a stand of trees. Grass was scoured from the ground. An engine block was found imbedded in a concrete wall. A photograph of it was published in a local newspaper. A pond just outside of town was reportedly sucked dry by the tornado. 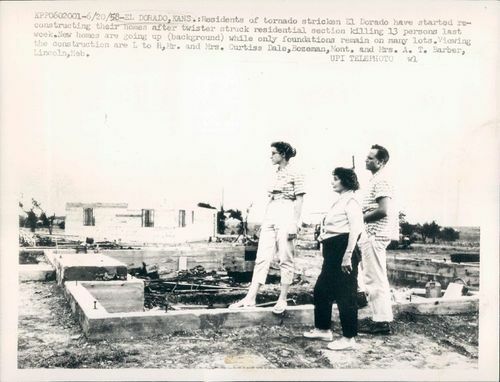 This tornado is widely believed to have been an F5, including by former meteorologist and tornado researcher Tom Grazulis (on whose research the pre-1950 portion of this list is based, as well as most of the unofficial entries). Fifty seven people were killed and 350 were injured. Some 500 homes were severely damaged or destroyed. It was the worst tornado to hit South America since at least 1926. One of the inherent problems with the Fujita scale is that it is a purely damage based scale. Thus, by definition, a tornado must hit something to be accurately rated. Unfortunately for meteorologists (but fortunately for humanity), the Great Plains contain vast expanses of utter nothingness. When a tornado hits nothing but sagebrush and fenceposts, it makes it very difficult for meteorologists to accurately gauge the tornado’s intensity. 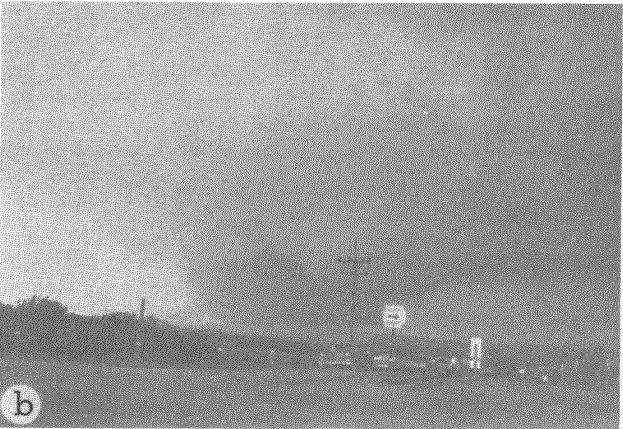 On May 6, 1973, as multiple F2 tornadoes were threatening the Dallas area, a tornado touched down near Valley Mills, Texas in far western McLennan County twenty miles west-northwest of Waco near the Bosque County line and moved northeast, rapidly intensifying. On a farm just east of Valley Mills, two pickup trucks were picked up and thrown hundreds of yards through the air. One was carried half a mile. The tornado travelled just ten miles, lifting five miles northwest of China Spring. The only structure it hit was a barn. No one was injured. The impressive flight of the pickup trucks is what earned this tornado an F5 rating. The Super Outbreak was one of the most remarkable weather events in recorded history. Over a span of just fifteen hours, 148 tornadoes ravaged the Ohio and Tennessee River valleys. An incredible thirty of those were of F4 intensity or greater, more than any other whole year on record except 1965 (31), and seven of them were F5s (no other day has had more than four and only one had more than two). Taken near New Salisbury looking west towards Depauw. As March turned to April, 1974, a broad longwave trough spawned a powerful leeside low pressure system that began to dig through the upper Midwest. Fueled by significant upper level divergence from a jet streak exit region and a steady stream of warm moist air flowing north from the Gulf of Mexico at low levels, storms began to fire over the Great Plains on April 2. However, as the low pressure system deepened, a very well mixed mid-level layer (an Elevated Mixed Layer or EML) with steep lapse rates (temperature changes with height) over a stable surface layer covered a vast expanse of the eastern United States. While this type of environment acts to suppress severe weather, it also allows energy to build up in the atmosphere, and if a large scale lifting mechanism (such as a cold front) is strong enough, it can release this energy almost instantaneously. The atmosphere was like a soda can that had been violently shaken, and the steady stream of warm, moist air, an influx of atmospheric spin (called “vorticity”), and afternoon heating were about to blow it open. At 3:20pm, the first of thirty violent tornadoes touched down about five miles north of Tell City in Perry County and moved northeastward. It churned through the rural areas of Hoosier National Forest, gradually organizing. It was a multi-vortex tornado for the first half of its life, with witnesses reporting multiple funnels swirling across the ground like so many serpents. 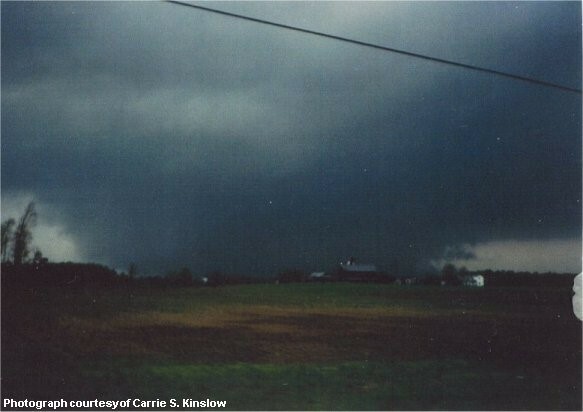 By the time it crossed Interstate 64 south of Grantsburg, however, it had evolved into a monstrous wedge tornado up to a mile and a half wide. It was so massive that the funnel was difficult to discern. It just looked like a low cloud rolling across the landscape. It ripped by the village of Depauw, where several homes simply vanished, swept to their foundations in a classic example of F5 damage. Next the tornado passed near Palmyra, where several homes were destroyed, and slammed into the village of Martinsburg, which was virtually annihilated. All but ten homes were destroyed. The destruction continued as the tornado passed northwest of Borden. Several homes along Daisy Hill Road were completely swept away. Continuing northeast, the tornado gradually began to weaken. It passed between Henryville and Underwood before lifting about five miles east of Lexington. It left a trail of devastation 68 miles long across southern Indiana. Six people were killed, including a woman who was crushed when a school bus was thrown into the ditch where she was taking cover, and another 86 were injured. Hundreds of homes were destroyed, many of which were completely swept away. And the day’s events were only just beginning. This terrifying photo was taken by a shopping center security camera as the tornado entered Xenia. It was the week before Spring Break in Xenia, Ohio, a suburban town about ten miles southeast of Dayton. The students of Xenia High School were ready to get the rest of the week over with and go home for a much needed vacation. That fateful Wednesday, they awoke to dire forecasts and the weather wasn’t far from everyone’s minds. Students attended class that day under ominous skies. However, when school let out shortly after 3pm, all remained quiet. A number of students went to the auditorium to rehearse for a play. None of them had any idea of the terrible tragedy that was about to strike their town. Just ten minutes after the Depauw tornado touched down in Indiana, another fell from the sky near Bellbrook, seven miles southwest of Xenia and headed right for the town, rapidly intensifying. Xenia, which lacked tornado sirens at the time, had very little warning. The tornado slammed into the town at 3:42pm. The destruction was absolute. Rows of homes were utterly annihilated. Residents heard the roar and saw the tornado moving into town and raced for cover. Many of them didn’t make it. For others, it didn’t much matter anyway. The tornado was just too powerful. Devastation in the the residential section of Xenia. The Arrowhead subdivision between Bellbrook Avenue and West Second Street was eviscerated. Virtually every home was destroyed and some completely vanished. The devastation continued along Dayton Avenue just west of downtown, where five people were killed at a root beer stand and several businesses were destroyed. Downtown was ravaged. Large masonry buildings were reduced to piles of rubble. A Penn Central freight train moving through town was picked up and thrown from the tracks like a toy. Train cars were scattered across the parking lot of the nearby Kroger Store and an adjacent car dealership. A tractor trailer truck was thrown over a hundred yards through the air and dropped onto the roof of a bowling alley. A donut shop was wiped out, with the bar stools left embedded in the empty floor. 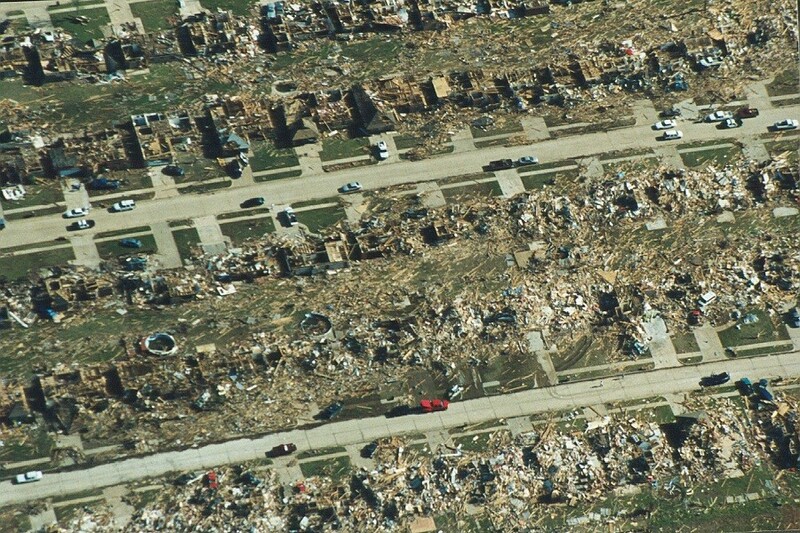 Aerial view of Xenia High School after the tornado. The tornado narrowly missed Greene Memorial Hospital. Homes along Marshall Drive were obliterated as the tornado bore down on nearby Xenia High School. Children and teachers in the auditorium heard the roar and raced for the main hallway as the tornado slammed into the school. The entire sprawling, two-story, brick complex was virtually destroyed. The entire second floor was wiped out. In the auditorium, a school bus from the parking lot was thrown onto the stage where the children had been moments before as the roof collapsed on top of them. Remarkably, none of them were seriously injured. Continuing northeast, the tornado destroyed several homes in the Pinecrest Gardens neighborhood before finally moving out of Xenia. It struck the suburb of Wiberforce, doing heavy damage to the campus of Wilberforce University. The tornado struck the Cedarville area as a weaker tornado before moving out over more rural areas, curving more to the north-northeast. It passed to the west of South Charleston, lifting near South Vienna. In all, 36 people were killed, 32 of them in Xenia, and 1,142 were injured. Over 1,400 homes and businesses (roughly half the town) were heavily damaged or destroyed. Damage came to over $100 million (nearly $500 million in 2013). It was, and remains, Ohio’s worst tornado since 1924. The third F5 in barely an hour, this one devastated the Ohio River town of Brandenburg, Kentucky. It touched down over rural Breckenridge County and moved north-northeast. It ripped through the north side of Hardinsburg as an F3, causing extensive damage in the town. The tornado passed near Irvington as an F4, where sixty homes were damaged or destroyed. Moving into Meade County, the tornado struck the village of Midway, demolishing several homes. It continued to intensify as it headed for Brandenburg. The town’s residents received very little warning. The disc jockey at the local WMMG AM radio station saw the tornado through his window and screamed at his listeners to take cover before running for shelter. The radio station was destroyed. The tornado slammed into Brandenburg as a half-mile wide F5 shortly after 4:30pm EDT. This home was swept away and the concrete walls of the the partially above ground basement severely buckled. The town was devastated. Entire neighborhoods were wiped out and some homes were completely swept away. At one home, not only was the above ground structure eviscerated, the basement walls, made of solid concrete, buckled and caved in. Cars were thrown hundreds of yards and destroyed, some of them being stripped to the frame rails. In some places, grass was pulled from the ground. Meade County High School and the Meade Hotel were heavily damaged. The town’s residents were taken completely by surprise. Eighteen people died on a single block of Green Street. Another 13 died in the tornado, all of them in Brandenburg. Another 270 were injured.128 homes and 30 businesses were destroyed and many others were heavily damaged. It was Kentucky’s worst tornado since 1933 and remains the state’s only F5. 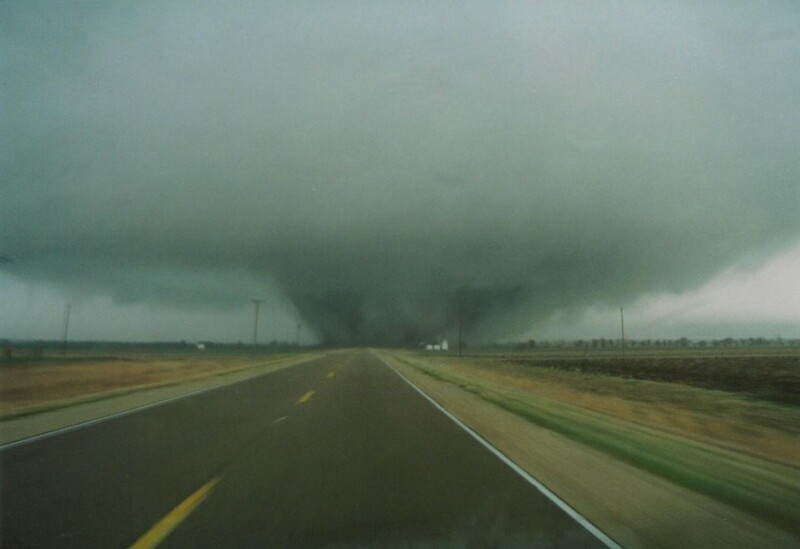 One of the many photographs of this tornado, this one was taken by a local resident as it approached a neighborhood. The same supercell that produced the Depauw tornado had been leaving a trail of destruction across southern Indiana, producing violent tornado after violent tornado. It produced an F4 that ravaged the towns of Madison and Hanover and another that struck rural areas of southeastern Indiana. The Sayler Park tornado was #4 and the second F5. It tore through the western suburbs of Cincinnati, causing widespread severe damage. It touched down near Rising Sun in extreme southeastern Indiana near the banks of the Ohio River. Crossing into Kentucky, the tornado gradually gained strength. It moved through rural areas north of Burlington and Hebron, striking the village of Bullittsville. Several homes were damaged or destroyed and twenty people were injured. Damage along River Road in Taylorsport, Kentucky, across the river from Sayler Park. The tornado crossed the Ohio River again near Taylorsport, where damage was also extensive, and roared into the community of Sayler Park as an F4, continuing to intensify. It devastated a subdivision in the hills above the river along Rapid Run Road. Nearly every home was heavily damaged or destroyed and some were completely swept away. Cars and boats were thrown great distances. A large barge on the Ohio River and the restaurant that sat on it was flipped over and sent downstream. Heavy damage continued as the tornado moved deeper into suburban Cincinnati. 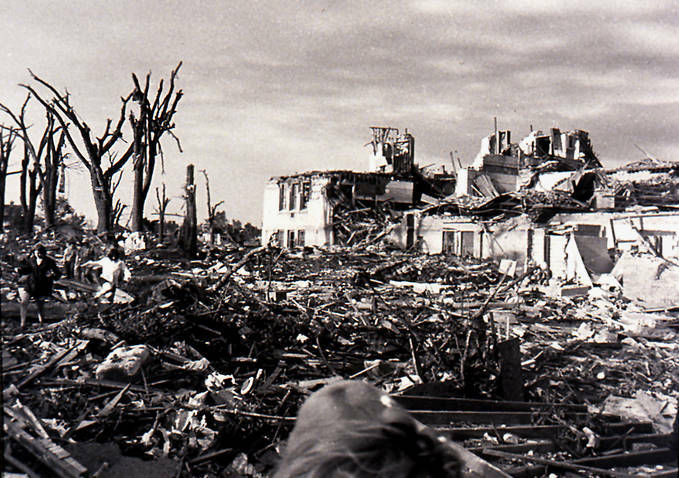 Numerous homes were destroyed on the west side of Delhi, where it struck as an F4. The communities of Mack, Bridgetown, and Dent were also hard hit as the tornado moved through, gradually weakening. The tornado finally lifted just west of White Oak. In all, three people were killed, a remarkably low number, and 210 were injured. Over a hundred homes were destroyed. The tornado was highly visible and slow moving, which gave people in its path time to seek shelter, reducing the death toll. This tornado was extensively photographed and is considered to have been the most documented tornado up until that point. The same, prolific supercell that spawned Depauw and Sayler Park would produce yet another violent tornado in the northern Cincinnati suburb of Mason that also caused extensive damage and killed two people. That one supercell produced an incredible five violent tornadoes, including two F5s, over a span of two hours. It was one of the most prolific and violent individual storm cells ever documented. Tanner, Alabama is a quiet southern community about four miles south of Athens near the north bank of Wheeler Lake. It’s a small town where everybody knows everybody. They go to church on Sunday and look after one another. Its humility belies its remarkable and tragic history. Everyone over a certain age in Tanner remembers that terrible Wednesday, the day that changed their little town forever. 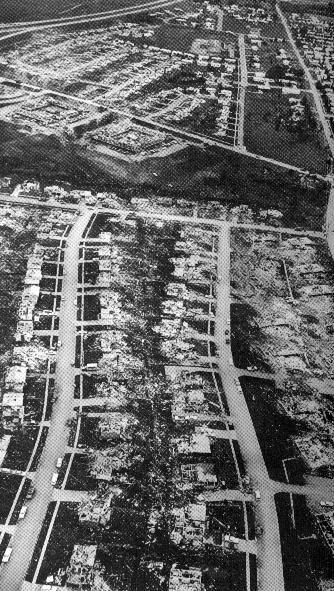 One of a couple of pictures of some lighter damage in the Tanner area, probably F2 to F3, with some homes in the background almost entirely destroyed. Just as the activity in the Ohio Valley was dying down, the activity in the southeast was heating up. At around 5 pm, several intense supercells formed over the northern portion of Alabama. The first tornado touched down over open country eight miles west of Moulton in Lawrence County at around 6:15pm CDT, rapidly intensifying as it moved northeast. It slammed into the Mount Moriah community five miles northwest of Moulton without warning. The little village was obliterated and 14 people were killed, including an entire family of six. Some homes were completely swept away. Vehicles trying desperately to flee the tornado were picked up and thrown great distances. 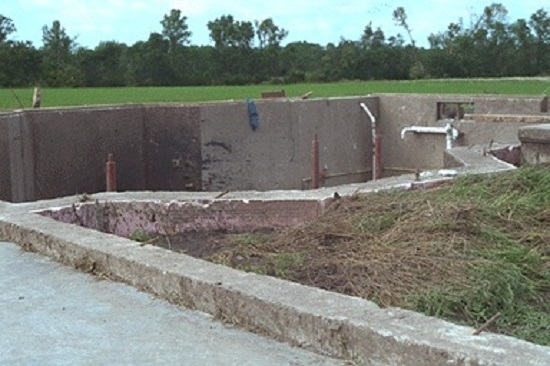 A nearby chemical plant was completely destroyed and a heavy industrial water pump was pulled from a well house and deposited in an adjacent field. The residents of Tanner had no idea what was about to hit them. 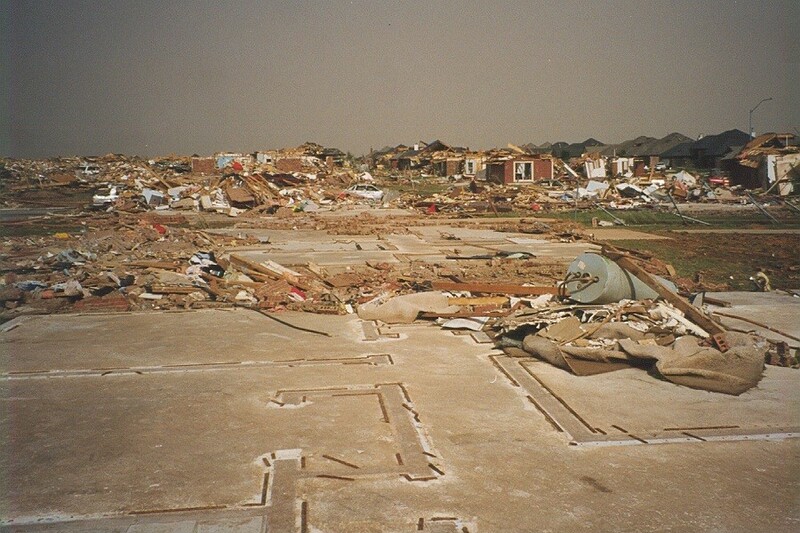 A wrecked housing complex in Tanner. The tornado roared across Wheeler Lake and into Tanner as an F5 roughly half a mile wide. Half the town was wiped from the face of the earth. Some homes were so completely erased that hardly a scrap of debris remained. Pavement was scoured from the roads and in many places, several inches of topsoil was ripped from the ground and plastered against debarked trees. Crossing I-65, the tornado moved over more rural areas, continuing to cause heavy damage. 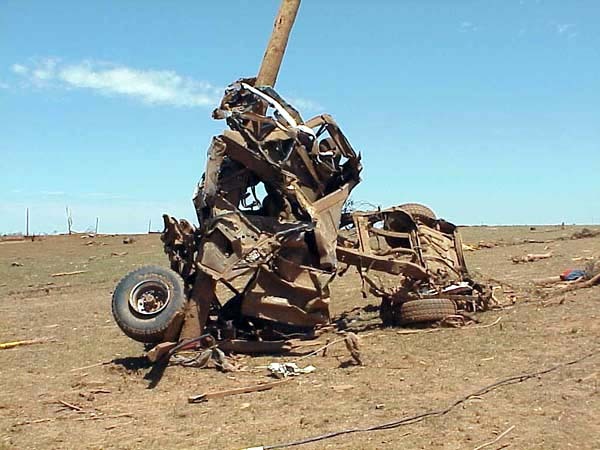 Southwest of Harvest, some steel truss power line towers were ripped from their anchors and thrown, an incredible display of force because the towers provide very little surface area for the wind to act against. Several homes were destroyed near Capshaw before the tornado lifted southeast of Harvest. In all, 28 people were killed, 14 in Mount Moriah and 14 in and around Tanner. Another 267 were injured. Some 500 homes were destroyed. And sadly, the tragedy in Tanner was not yet over. Less than an hour after the tornado struck, rescue operations were well underway in Tanner. Little did they know, they were about to be hit again. A second tornado touched down along the shore of Wheeler Lake and intensified very rapidly. It rolled straight through the heart of the battered community as at least a strong F4, following almost exactly the same path as the first tornado. Dozens of people were still out in the streets assisting with rescue efforts. The second tornado took them completely by surprise. Many of them were killed. 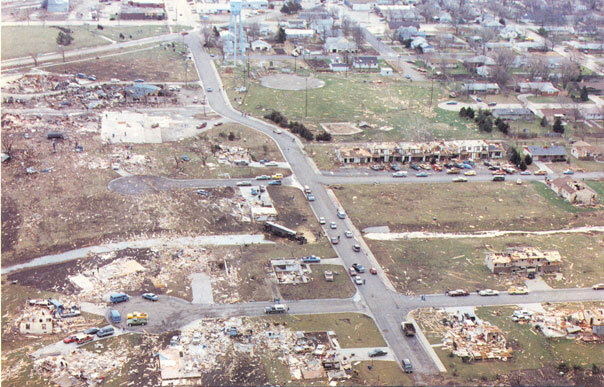 Much of what remained following the first tornado was destroyed by the second. Moving northeastward, the tornado then struck the town of Harvest. The first tornado had missed the town to the south, but the second made a direct hit, destroying numerous homes, some of which were swept away. The tornado continued to cause extensive damage as it passed just north of Hazel Green as an F3, wrecking several homes. Some of the extreme damage southwest of Harvest, probably from the second tornado. This is likely Smith Vasser Rd near Engineer Ct. These homes were likely not anchored, so this damage is probably more in the F4 range. The tornado then crossed into Tennessee as a somewhat weaker tornado. 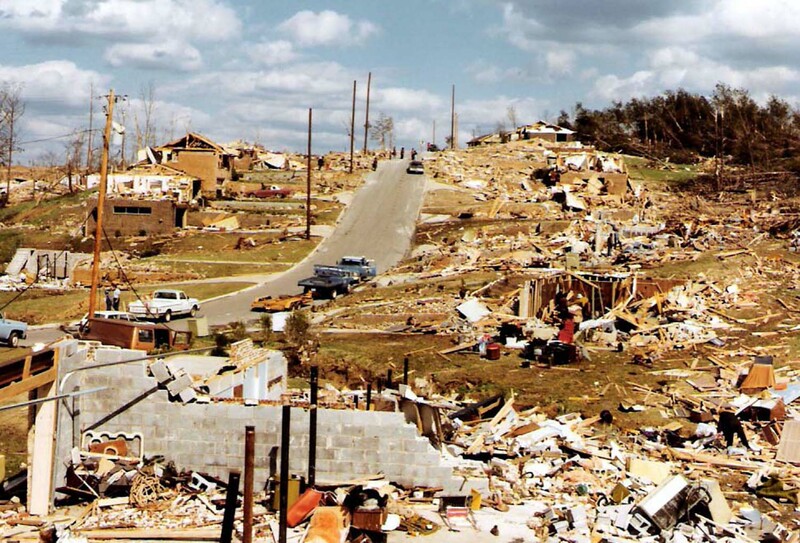 Little is written about the tornado’s effects in Tennessee. The official record has the tornado turning more north-northeastward, continuing past Winchester and Tullahoma before finally lifting just east of Manchester. It’s unclear whether the tornado was continuous for that long. At least 16 people died in the tornado (some sources say 22), most of them in Tanner but several in Harvest and Hazel Green. Debate rages to this day as to whether the 2nd Tanner tornado was an F5. The damage left by the two tornadoes was difficult to distinguish, so we may never know for sure. Homes were swept away throughout Tanner and the paths of the two tornadoes were separated by just half a mile. 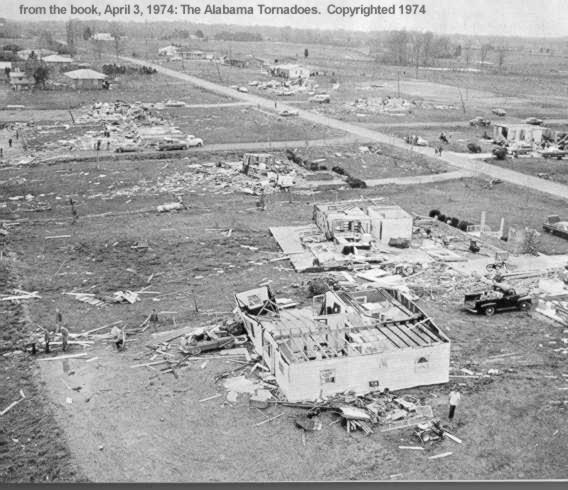 50 people were killed by the Tanner tornadoes and over 400 were injured. Over 1,000 homes were completely destroyed and many others were heavily damaged. 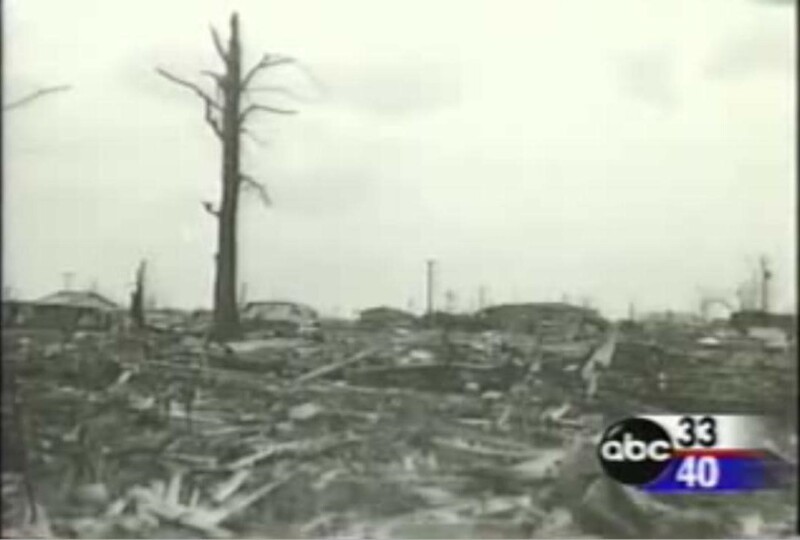 The Guin tornado may have been one of the most powerful tornadoes in history. It caused appalling devastation across a vast swath of northwestern Alabama at least eighty miles in length. It touched down just south of Sulligent in Lamar County shortly before 9pm CT (recent evidence suggests it may have formed back in Monroe County, Mississippi) and moved northeastward, rapidly intensifying. The National Weather Service office in Birmingham issued an urgent tornado warning for the small town of Guin and the surrounding area. 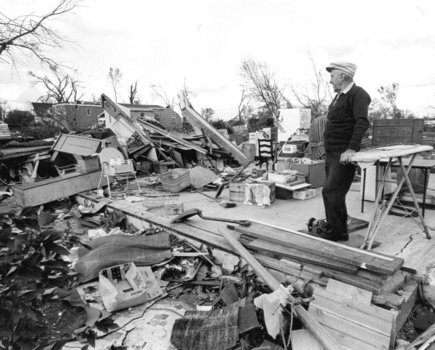 In the darkness, many of Guin’s residents saw an enormous black mass barreling towards the town and scrambled to get into tornado shelters. But it was too late. A view of the devastation in Guin. Rows of homes were wiped out. The tornado slammed into Guin as a monstrous, mile-wide F5. Rows of homes were wiped from the face of the earth. Many of them, including substantial brick homes, simply vanished, with little trace of their existence left behind. Concrete foundations were torn out of the ground. A sprawling industrial warehouse built of concrete and steel was completely destroyed and partially swept away. Steel beams were mangled and twisted like pipe cleaners. Metal frames of mobile homes were found wrapped around trees, many of which were shredded and debarked. Twenty three people died in Guin alone and over 500 buildings were leveled. A swept away home in Guin. 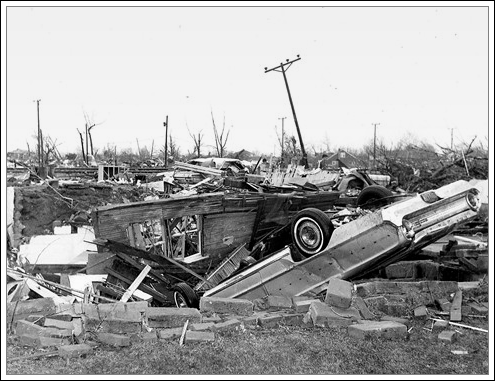 Continuing northeast, the tornado struck the village of Delmar, destroying numerous homes and killing five people. Another two people were killed near the tiny community of Ashridge. The tornado then tore through Bankhead National Forest, leveling tens of thousands of trees. It gradually weakened as it moved through Lawrence County, however it didn’t lift until it was just south of Decatur shortly after 10pm. It had travelled some eighty miles (possibly even more) and was on the ground for roughly an hour and a half. In all, 30 people were killed and 272 were injured. Over 500 homes and businesses were completely destroyed. It was so powerful and long-lived that its damage path could be seen from space. 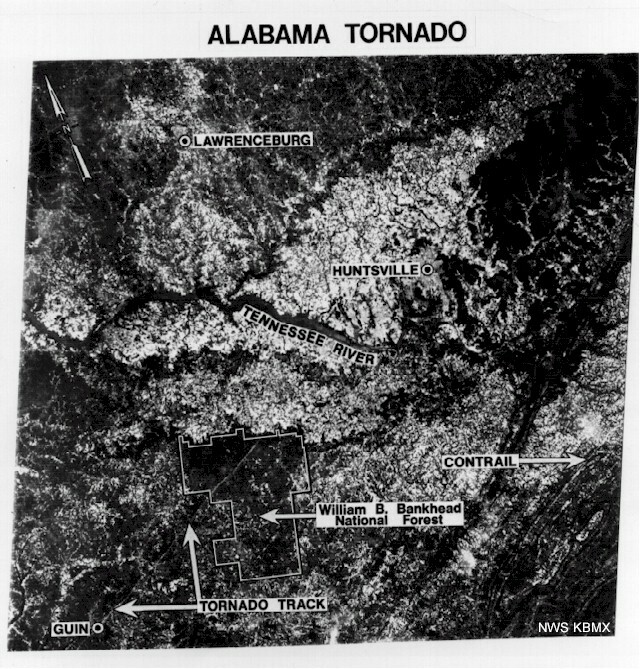 A satellite image showing the damage path through Guin itself and the Bankhead National Forest. 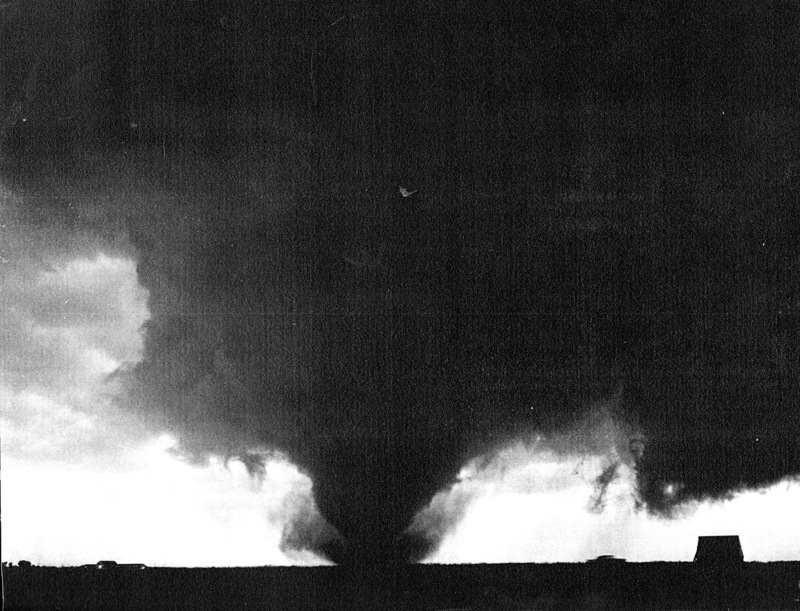 This tornado struck the Spiro, Oklahoma area in late March, 1976. It touched down a few miles northwest of Panama in Leflore County and moved east-northeast, quickly intensifying. It tore through the southeast side of Spiro as a powerful tornado a third of a mile wide. 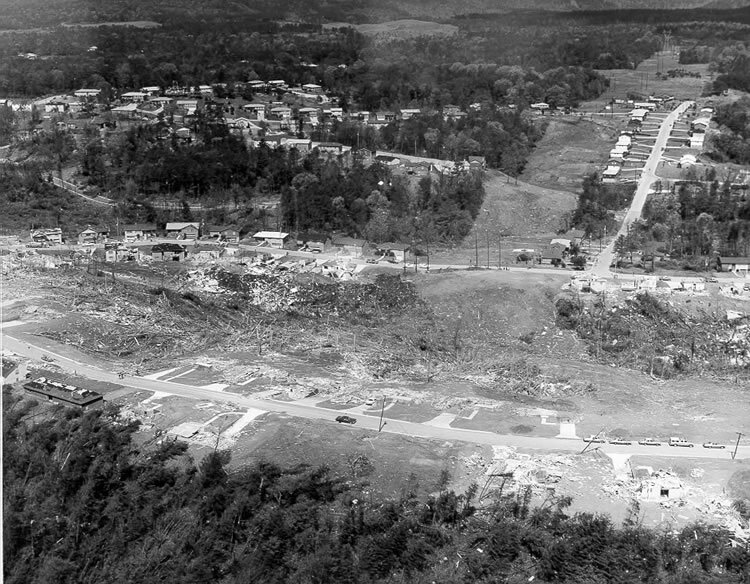 An entire row of homes was wiped out and a new housing addition was wrecked, the debris scattered many miles downstream. Trees were stripped of their branches and debarked. Several cars were thrown from the roads, some flying hundreds of yards through the air and landing in nearby fields. A coal train, with cars weighing some 70 tons each, was thrown from the tracks and a section of track was pulled from the ground. An oil company warehouse was knocked off its foundation and a semi truck was picked up and rolled several times. The most extreme damage occurred in the Murray Spur area just east of Spiro, where several homes were completely swept away. Multiple vorticies were observed with this tornado. It lifted just north of the village of Pocola about six miles east of Spiro. As it did so, two cars were reportedly thrown into a semi, but fortunately nobody was seriously injured. Two people were killed, 64 were injured and numerous homes were destroyed. Less than a month after Spiro, this tornado ripped through rural areas north of Brownwood, Texas. Like the Valley Mills tornado three years earlier, it didn’t hit much. It touched down midway between Bangs and Brownwood at around 1:30pm and moved northeast. The tornado was highly visible and many Brownwood residents saw it churning through farmland to the north. Tornado sirens were sounded in Brownwood but the tornado never struck the city. A farm north of town, however, was devastated. Four houses and several outbuildings were wiped out. At one house, a man huddled in his bathtub rode out the tornado as it obliterated his house. When he emerged, he and the bathtub were all that remained. Several teenagers were picked up and thrown as much as a thousand yards by the tornado when they were caught out in the open, but shockingly all of them survived, though seriously injured. The tornado then struck Brownwood Regional Airport as a slightly weaker tornado. It destroyed several hangers and six aircraft. The tornado lifted shortly after crossing Highway 183 about four miles north of Early. The tornado travelled just ten miles and was only about a quarter of a mile wide but it was extremely powerful. Somewhat remarkably, no one was killed, however eleven were injured. The third F5 of the season, this one ravaged farmland between Boone and Ames, Iowa. It touched down on the east bank of the Des Moines River three miles southwest of Luther and moved northeast. It passed just west of Luther and turned more to the north as it quickly grew and intensified. By the time it reached Highway 30, it was a monster F5 nearly a mile wide. It was at about this time that it began to develop a few satellite tornadoes, one of which was a powerful F3 that was anti-cyclonically (clockwise) rotating, which is very unusual. The main tornado crossed Highway 30 and slammed into the small farming village of Jordan at 3:45 pm. Jordan was obliterated. Nearly every home was completely destroyed or damaged beyond repair. Many homes simply disintegrated, the debris swept away. Cars, trucks, and farm machinery were thrown hundreds of yards through the air and trees were debarked. Corn stalks were pulled out of the ground and there was significant topsoil disruption. The Jordan School, a sturdy, reinforced building was heavily damaged. 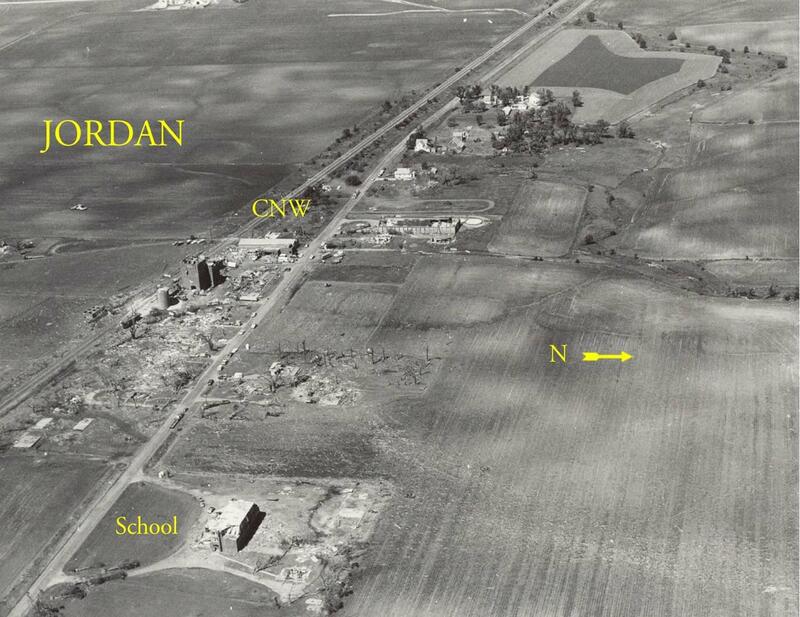 Aerial view of the damage in Jordan. After passing Jordan, the tornado turned sharply to the east-northeast, possibly caused by cold air outflow from the parent thunderstorm, and began to gradually weaken. The tornado lifted right before striking Story City, which was hit with hurricane-force winds from numerous downbursts. Widespread and severe wind damage occurred across the city. Nine people were injured in this tornado, but miraculously, no one was killed. This tornado was studied in depth by Dr. Ted Fujita, who said it was the most intense tornado he’d ever seen. This tornado’s unusual U-shaped path and structure, particularly the clockwise rotating satellite tornado, has been the subject of study. Interestingly, that same day, a mile-wide F4 devastated the town of Lemont, Illinois (which fortunately only killed two people). That tornado also had two clockwise rotating satellite tornadoes. Just three years after the Super Outbreak, Alabama was still rebuilding and memories of that terrible day were still fresh in everyone’s minds. Birmingham has a long and violent tornado history. On April 15, 1956, an F4 devastated McDonald Chapel before ripping through the north side of Birmingham, killing 25. 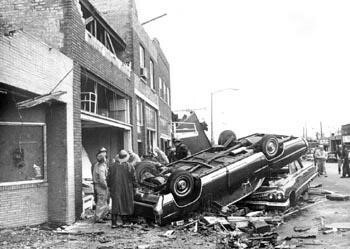 Then on March 5, 1963, another F4 struck the southern suburb of Homewood, though fortunately no one was killed in that event. The subsequent devastating tornadoes of 1998 and 2011 will be discussed later. Entire neighborhoods of well-built homes were devastated. The Smithfield F5 was arguably the biggest and most powerful of them all and the worst strike on Birmingham proper. It touched down just north of Ensley about five miles west northwest of downtown and moved northeast, strengthening very rapidly. It ripped through Pratt City, causing extensive damage and destroying many homes. It roared across US 78 into the Smithfield Estates subdivision as an F5 three quarters of a mile wide. Rows of homes were annihilated. Smithfield Lane all but vanished. 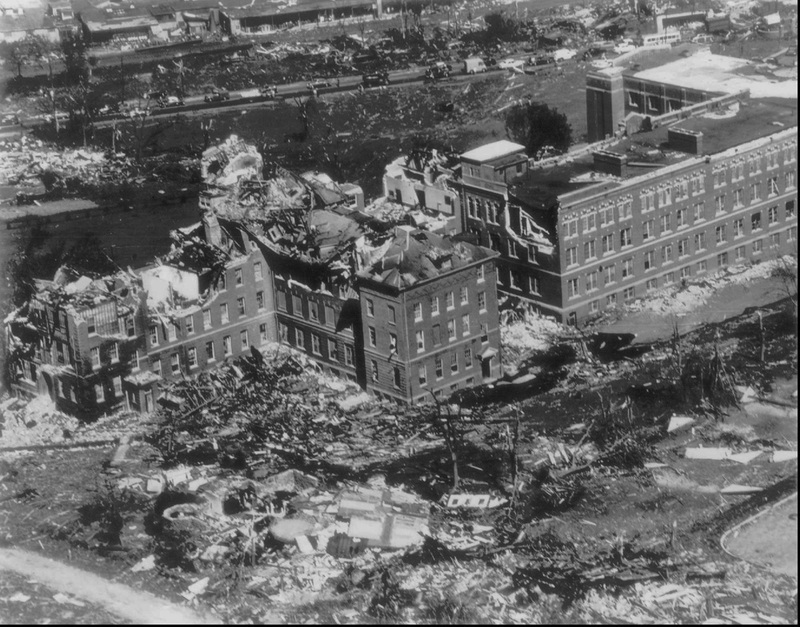 Daniel Payne College, a small black college, took a direct hit and the campus was severely damaged with several buildings being effectively destroyed. The struggling college could not afford to repair the damage and was forced to close. The tornado remained extremely powerful as it crossed I-65, throwing cars and trucks through the air. Between I-65 and US 31, the tornado crossed a ridge. Homes all around this ridge were obliterated. Some homes built into the hillside had their basement walls gouged out of the ground. As the tornado crossed the ridge, two dump trucks were seen swirling in the debris cloud. The tornado then moved through Tarrant, continuing to cause extensive damage. It steadily weakened after that, moving through Zion City and lifting near Robison Drive in Huffman. A row of homes along Smithfield Lane simply vanished. In all, 22 people were killed, 130 were injured, and hundreds of homes were severely damaged or destroyed. Dr. Ted Fujita followed the tornado in an airplane and was part of the team that surveyed the damage, rating the tornado an F5. 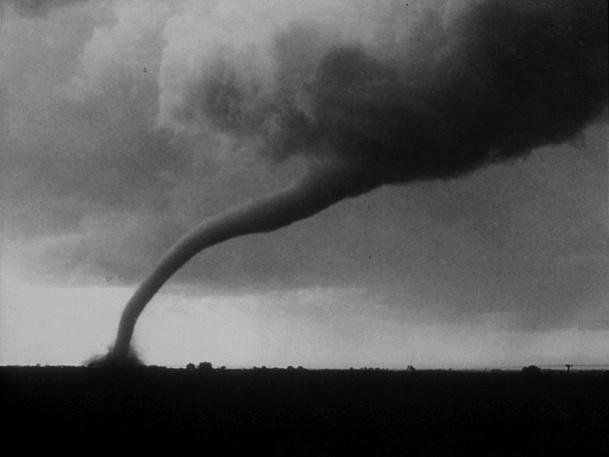 Fujita briefly considered rating the tornado an F6, which was considered by many scientists to be unachievable. The Fujita scale has since been changed to eliminate any upper boundary to the F5 category. Later that same afternoon, Southern Airways Flight 242 got caught in a severe thunderstorm near Rome, Georgia. Hail damage to the engines forced the plane to make a crash landing on a rural highway. The flight crew, 61 passengers and nine people on the ground were killed. Nineteen passengers and both flight attendants survived. It was one of the worst weather-related aviation accidents in US history. It had been five years since the last F5, one of the longest droughts in recorded history. 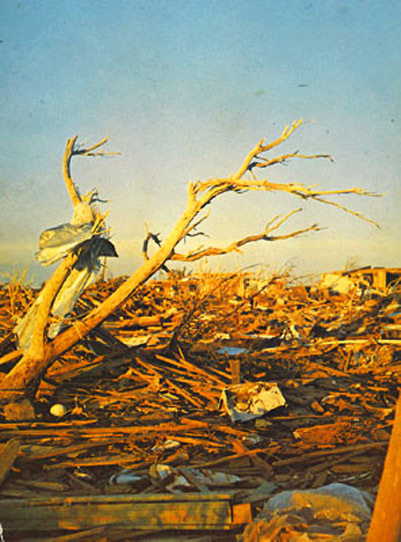 The devastating Wichita Falls tornado of 1979 was somewhat controversially rated an F4, however this rating has been strongly supported by scientists and researchers in the years since. This rural southeastern Oklahoma monster finally broke the drought. It touched down over rural Choctaw County between Antlers (which was hit by its own F5 in 1945) and Hugo near the farming village of Speer and moved east southeast, quickly becoming very powerful. 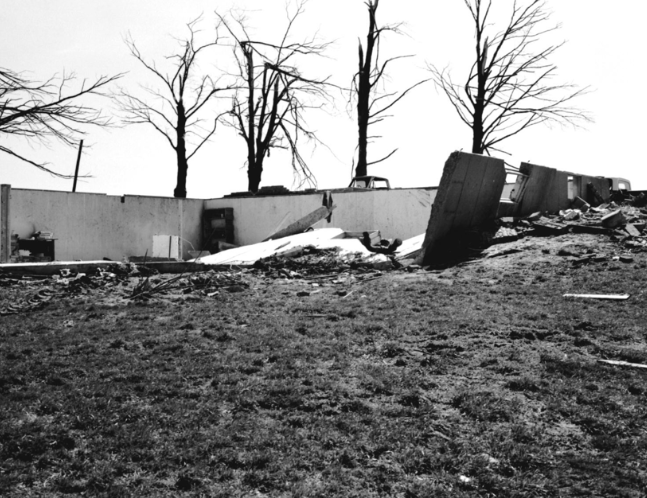 It struck the tiny community of Messer, were a house was wiped from the face of the Earth. All that was left was a concrete slab and the carpet tack strips. Nearby, a 2×4 was driven through an oak tree. The tornado crossed Hugo Lake and moved out over mostly rural farmland, continuing to grow in size. Several farms suffered extensive damage, with heavy machinery being thrown great distances. Crossing into McCurtain County, it passed south of Wright City and very near the village of Golden, where the tornado was a mile and a half wide and a few rural homes were destroyed. It then ripped through the south side of Broken Bow, a small city of a few thousand. Fortunately, the area hit wasn’t very well developed. The Tri-Night Motel was completely destroyed. Its large sign was found thirty miles away in Arkansas. A nearby church and a lumber yard was also destroyed. Cars and other vehicles were picked up and thrown. The tornado continued almost due east for roughly another five miles before lifting just south of Eagletown. Twenty-nine people were injured in this tornado but fortunately no one was killed. Some 30-40 homes were destroyed, including some that were completely swept away, with an estimated $7 million worth of property damage. Another $1 million worth of timber, a major industry in the region, was destroyed. A view of the destruction in Barneveld. The home in the foreground has been swept away. Extreme tornadoes are relatively rare during the overnight hours. After sundown, the atmosphere begins to cool off and stabilize. After about 10pm, there typically isn’t enough available energy to support a strong tornado. However, that’s exactly what happened in the early morning hours of June 8, 1984. It was very warm and humid in the upper Midwest that day in advance of a mid-latitude cyclone. Strong overnight tornadoes tend to be more common in the warmer months when surface heating persists for longer after sundown and atmospheric moisture is often abundant. With strong vertical wind shear (change in wind speed and direction with height) present over southern Wisconsin, the stage was set for a significant tornado event. After producing a brief tornado to the southwest, the same cell spawned the main tornado a few miles south of Ridgeway at 12:41am. It rapidly intensified as it moved northeast, headed straight for the town of Barneveld. The tornado slammed into Barneveld shortly before 1am as an F5 a quarter of a mile wide. The town was virtually wiped out. 90% of it was leveled. 93 homes and 17 out of the town’s 18 businesses were completely destroyed. A home reduced to its foundation in Barneveld. This is probably F5-level damage. At a cul-de-sac on the northeast side of town, several newly-built homes completely vanished. Cars throughout the area were thrown great distances and trees were debarked. A nearby church was also obliterated. Lightweight debris from Barneveld was reportedly found 135 miles away, one of the greatest distances ever recorded for tornado debris. Passing northeast of town, the tornado destroyed some two dozen rural homes near the tiny village of Vermont before striking the town of Black Earth, where eight homes were destroyed. The tornado continued northeast through more rural areas, passing near Marxville and Aldens Corners before lifting near the town of Dane. In all, the tornado killed nine people, a remarkably low number given the circumstances, and roughly 200 were injured. Damage amounted to $40 million and it remains the costliest tornado in Wisconsin history. Tornadoes are not uncommon in Russia. In fact, they are believed to have the highest frequency of tornadoes outside of the United States. On June 29, 1904, what’s believed to have been at least an F3 tornado struck Moscow, killing thirty people. More recently, in 2009, an F3 struck the Krasnozavodsk area, causing extensive damage. 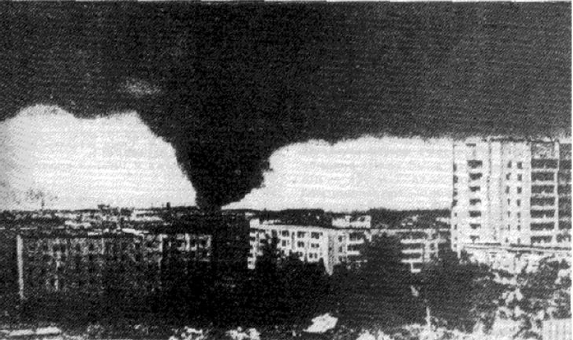 The outbreak of June 9, 1984 (the day after Barneveld), however, was the worst tornado outbreak in modern European history, causing appalling devastation to areas around the cities of Ivanovo and Kostroma 120-150 miles northeast of Moscow. A satellite image of the low pressure system as the outbreak was in progress. The Ivanovo tornado touched down at about this time. It was a warm and very humid day in western Russia. A powerful occluded low pressure system was moving in from the west and warm, moist, unstable air was streaming northward from the Black Sea. At around 3pm local time, a series of powerful supercells began to move north through areas around and east of Moscow. Shortly after 3:30pm, a tornado touched down near the town of Lezhnevo in Ivanovo Oblast and moved almost due north. It quickly began to grow in size and intensity. At around 4pm, the tornado tore through the west side of Ivanovo, a city of hundreds of thousands of people, as an F5 half a mile wide. Hundreds of homes were destroyed and some were completely swept away. A large section of the city was simply gone. Large, steel reinforced concrete buildings were completely swept away, leaving little debris behind. An industrial crane weighing 355 tons was picked up and thrown 200 meters (220 yards). Numerous vehicles were also thrown great distances and asphalt was scoured from a nearby highway. Taken as the tornado entered Ivanovo. The tornado maintained its incredible intensity as it passed north of Ivanovo. Near the Volga River west of Volgorechensk, a 55 ton water tank was thrown 200 meters. Several 40,000 gallon steel water containers were lifted over 300 feet in the air and carried a full kilometer (over half a mile). Hail weighing a full kilogram was reported with this storm. The tornado crossed the Volga River and quickly weakened, lifting near the town of Lunevo in Yaroslavl Oblast east of Kostroma. It had traveled at least fifty miles (some sources say a hundred). Ivanovo was devastated. At least 92 people were killed. Some sources put the number as high as 400. 1,180 homes are believed to have been destroyed, many of which simply vanished. It was by far the worst European tornado of the 20th Century. Just half an hour later, an F4 devastated the nearby town of Kostroma. The death toll of that tornado is unknown. 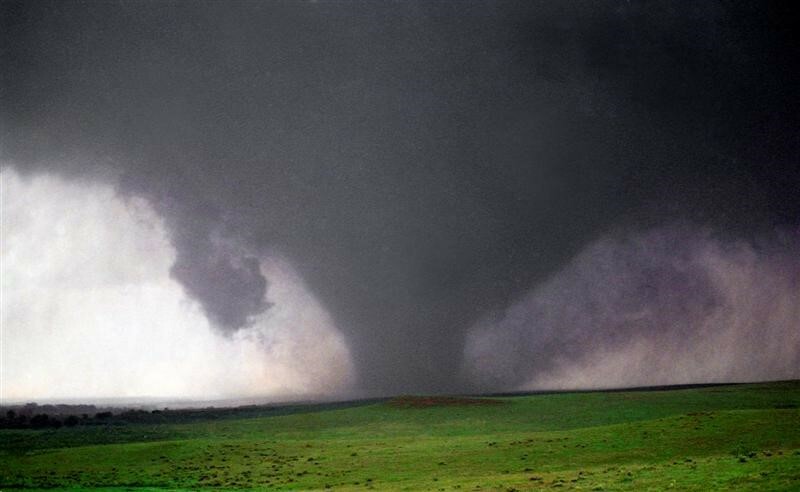 The Ivanovo tornado has been studied extensively by Russian and western scientists. The information in this section is derived from publications by Soviet scientists A. A. Vasiliev, B. E. Peskov, and A. L. Snitkovskii in 1985 and 1986 in peer reviewed Soviet science journals. It was vetted by Finch and Bikos (2012) in the Electronic Journal of Severe Storms Meteorology. Western sources conservatively rate the tornado F4 because the quality of construction of the homes swept away could not be properly assessed, but it is widely believed to have been an F5, largely due to the extreme damage to reinforced industrial buildings. Pennsylvania had largely avoided destructive tornadoes throughout history with the notable exception of the outbreak of June 23, 1944, when two violent F4s devastated areas just south of Pittsburgh. That was the same day that another F4 wiped out the town of Shinnston, West Virginia, killing 100 people. Then, 41 years later, another even more violent outbreak struck the state. 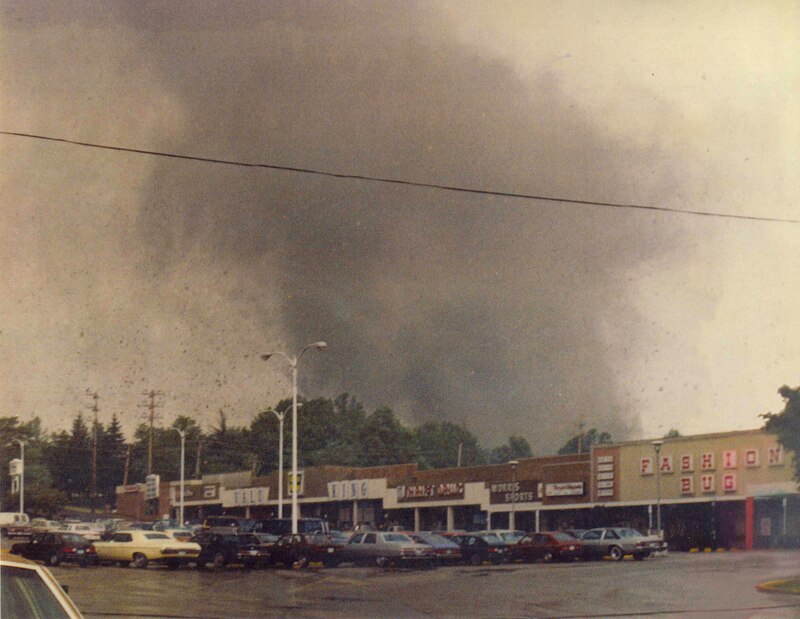 A spectacular view of the tornado taken from the Village Center Plaza shopping center in Niles, looking south. It was a hot, humid day across the eastern Great Lakes region, with Cleveland reaching 87 degrees. A low pressure system was digging through the western Great Lakes with a cold front advancing rapidly through Ohio. As the day reached peak heating at around 4pm, tornadoes began to touchdown. 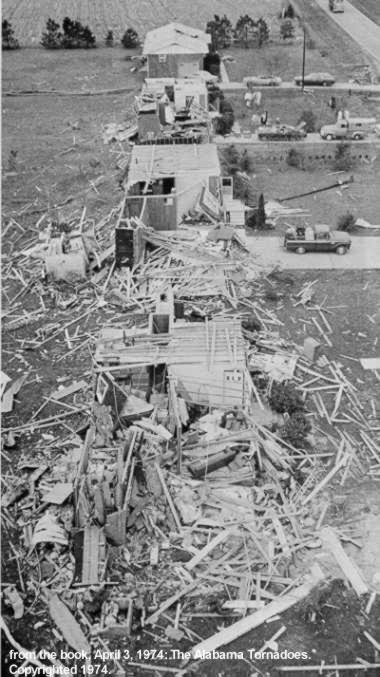 At around 4:30, a large, long-track F4 devastated Grand Valley, Ontario, Canada’s first violent tornado in nearly six years. Less than an hour later, nearly simultaneous F4s ravaged Albion, Pennsylvania and Barrie, Ontario, killing a combined 20 people. 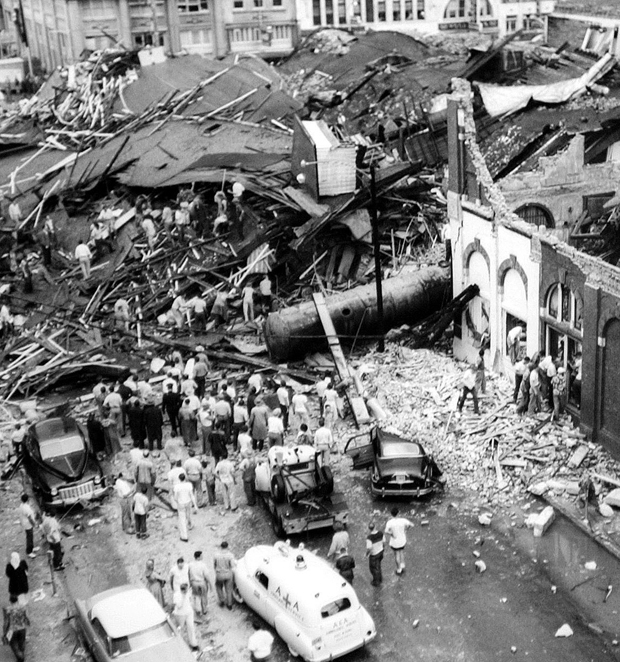 The devastation continued at about 5:20 when another F4 devastated rural communities across western Pennsylvania, killing 16. The next hour was quiet, but little did anyone know that the most powerful and devastating tornado of the outbreak was about to touch down. The Niles Park Plaza shopping center was obliterated. Niles, Ohio and Wheatland, Pennsylvania are two suburban towns separated by only about eight miles. Niles was a small city built on industry, at the time home to some 15,000 people, lying midway between the larger cities of Youngstown and Warren. Wheatland was a small, working class community of about 1,000 located just south of the larger towns of Sharon and Hermitage along the Ohio border. After today, they would be inextricably linked by tragedy. At 6:30pm, a tornado touched down in the Ravenna Arsenal west-northwest of Newton Falls and moved almost due east. It moved through the north side of Newton Falls as an F3, destroying or severely damaging hundreds of homes. The tornado continued to grow and intensify, passing just north of Lordstown as an F4 a third of a mile wide. A partially swept away home in Niles. It slammed into Niles as an F5 shortly before 7pm, ripping through residential areas on the north side of town. Numerous well-built homes were destroyed and some were completely swept away. At an industrial area just west of town, a few large metal petroleum tanks that were thirty feet tall and weighed 75,000 lbs were ripped from their anchors and thrown, one of them travelling some sixty yards. The Niles Park Plaza shopping center across town was completely destroyed and partially swept away. A nearby skating rink was also obliterated. Eight people were killed in Niles. The destroyed trucking plant in Wheatland. A portion of the structure has been swept completely away. The tornado moved over rural areas north of Interstate 80 as it headed for the Pennsylvania border, growing into a large, wedge tornado half a mile wide. It roared across the border and into Wheatland as an F5 right around sunset at 7:15pm. The town was virtually obliterated. 95% of it was leveled and many homes were completely swept away. A steel-frame trucking plant was flattened. All that remained was a pile of twisted and mangled steel beams. At a nearby manufacturing plant, asphalt was torn from the parking lot and pieces of sheet metal and paper routing slips were found wedged under the remaining asphalt. Continuing eastward, the tornado lifted near the town of Mercer. It had traveled 47 miles. In all, 18 people were killed, nine of them in Niles and eight in Wheatland, and 310 were injured. Roughly 700 homes were severely damaged or destroyed. The day was far from over. Four (possibly five) more violent tornadoes struck the state of Pennsylvania that day. One of them was massive, approaching two miles wide at times as it tore through Moshannon State Forest. Another killed seven people near Tionesta when the German Hill subdivision was devastated. Yet another ravaged the town of Kane in McKean County. Interestingly, one of the tornadoes tore through the Saxonburg area, killing nine people. This tornado was initially rated F4 but downgraded to F3, possibly due to questions raised about quality of construction. Homes were reportedly swept away along Knoch Road south of Saxonburg and cars were thrown into nearby corn fields hundreds of yards away. A view of the tornado taken from Interstate 135. South central Kansas is the tornado capital of the world. In the past 130 years, an astonishing eleven F5s have struck the section of Kansas and Oklahoma between US 56 and US 412 north to south and US 77/177 and US 281 east to west – a region I have dubbed “F5 Alley”. This climatological hot zone along the Interstate-135/35 corridor is fed by persistent low-level moisture flowing north from the Gulf of Mexico, a climatological wind shear maximum, and very strong surface heating. These frequently combine to create ideal conditions for strong tornadoes in this region. Aerial view of several swept away homes in Hesston. The March 13, 1990 event was uniquely spectacular. It’s not uncommon for the same convective cell to produce multiple tornadoes, but never has one cell produced tornadoes this powerful in such quick succession. It was also unusually early for such an extreme event. These were the earliest F5 tornados in nearly two decades. A leeside low pressure system had developed in western Kansas and a dryline was advancing through the central part of the state. However the day up until that point had been quiet. The outbreak began with a bang. The first tornado touched down near Pretty Prairie in Reno County at 5:34pm and moved northeast. It quickly intensified, hitting the Haven area as a half mile wide F4, flattening several homes. Moving into Harvey County, the tornado struck Burrton as an F3, wrecking some homes and killing a small boy. Unusually, the tornado actually narrowed as it reintensified, shrinking to about a third of a mile wide. It slammed into Hesston, a few miles northwest of Newton, as an F5. Ninety homes were destroyed and thirty all but vanished. Checks from Hesston were found over a hundred miles away. Miraculously, no one in Hesston was killed. Overall, sixty were injured. Taken as the tornado crossed Kansas 15 southeast of Goessel. As the first tornado moved through Hesston, a new mesocyclone developed on the northeast side of the storm system. A mesocyclone is a mid-level low pressure circulation that a tornado forms from. The second tornado touched down at around 6:30 near the McPherson County line as the first one began to weaken to the north east of Hesston. This new tornado quickly grew and intensified and began to consume the first tornado, which soon roped out and was absorbed by the second tornado, which, after initially wobbling around, began to move northeastward into Marion County. By the time it crossed Arrowhead Road, it was nearly a mile wide. It was in this area that an elderly woman was killed when her home was destroyed. The tornado ripped through farm country just south and east of Goessel. Several homes were destroyed and some were completely swept away. It continued northeast, gradually weakening. It passed near Hillsboro before lifting near the Marion Reservoir. Amazingly, there was just the one fatality and no one else seems to have been injured. Just two people were killed in the entire event, one by each tornado. This has been attributed to significant advance warning, the tornado was highly visible, and most people in the area had access to basements or storm cellars. It was a remarkable event unlike any that had been observed before. It was only the second time in recorded history that two F5s formed from the same convective cell (the Depauw cell in the Super Outbreak being the other) and the only time it happened as a continuous event, with one absorbing the other. Forecasting had come a long way by 1990. Radar systems were better and spotter networks were very effective. Just two tornadoes killed twenty or more people in the United States during the 1980s, a dramatic improvement over previous decades. However, forecasters are still human beings. They are counted on to catch everything. If just a single dangerous storm is missed, the consequences can be devastating. Never was that more tragically demonstrated than with the tornado that hit Plainfield, Illinois on August 28, 1990. Strong tornadoes are fairly rare in August. While there’s plenty of heat and moisture, wind shear usually isn’t strong enough and temperature gradients are weaker. This was one of only two August F5s in recorded history (Rochester, MN – August 21, 1883 being the other). It was a hot, humid day in northern Illinois, with temperatures soaring to around 90 degrees and dewpoints into the lower 70s. There was an incredible amount of energy in the atmosphere. One of the measures meteorologists use to gauge the amount of energy available to storms is called CAPE (Convectively Available Potential Energy), and by late afternoon, values over northern Illinois were a staggering 8000 J/kg. 1000 J/kg is normally plenty sufficient for severe weather. However, wind shear wasn’t very strong, so most meteorologists thought that a major squall line was more likely than strong tornadoes. What happened would shake the meteorological community to its core. Beginning in the early afternoon, winds began to shift and wind shear spiked. A developing storm near the Wisconsin border began to take on supercell characteristics as it moved southeastward, eventually developing a hook echo on radar. However no tornado had been reported and forecasters at the National Weather Service office in Chicago were concerned about warning prematurely. The meteorologist in charge elected not to issue a tornado warning. It was a fateful decision. The tornado touched down near the town of Oswego in Kendall County shortly before 3:30pm and headed southeast, rapidly intensifying. On farmland south of Oswego, corn stalks were pulled from the ground, roots and all. As it crossed the Lincoln Highway, a 20-ton tractor trailer was picked up and thrown half a mile, killing the driver. Three other drivers were also killed when their cars were thrown from the road. Just a few minutes later, the tornado slammed into the suburban town of Plainfield. Rows of homes were wiped out. Over a hundred homes in Plainfield were destroyed. The Peerless Estates neighborhood was particularly hard hit, with 75 homes destroyed. Well-built homes in the Patriot Square area simply vanished. Nearby, a dumpster was found wrapped around a tree. The tornado struck Plainfield Central High School, all but demolishing it. It was the day before classes were due to start, however several students and teachers were on campus. A dean in the front office saw the tornado through a window and pulled the fire alarm before running for cover. Football and volleyball players at practices took shelter in the hallway of the gymnasium moments before the tornado hit. They were trapped by wreckage as the building collapsed on top of them but all survived. The hallway where they were taking shelter was the only part of the building that remained standing. Three people in the school were killed. The Crest Hill Lakes apartment complex after the tornado. The destruction continued as the tornado passed southeast of Plainfield. Numerous homes along Lily Cache Road were leveled. People at Louis Joliet Mall watched as the tornado passed just to their southwest. Two people were killed in the Crystal Lawns subdivision and several homes were destroyed. The tornado moved through Warwick before striking Crest Hill as an F3. The Crest Hill Lakes apartment complex took a direct hit and was severely damaged. Eight people there were killed. The tornado mercifully lifted before striking the city of Joliet, but the devastation had been done. Twenty-nine people were killed and 350 were injured. It was Illinois’ deadliest tornado since an F4 struck the Chicago suburb of Oak Lawn on April 21, 1967 at the height of evening rush hour, killing 33. At the time, NWS Chicago was responsible for providing warnings for the entire state. They were simply overwhelmed and egregious errors were made. Forecasters failed to recognize the rapidly changing wind shear conditions and too much reliance was placed on storm spotters, who had a difficult time seeing the tornado because it was wrapped in rain. Also, at the time, forecasters were very concerned about “crying wolf” and were reluctant to issue warnings. In the meteorological world, the Plainfield tornado became a cautionary tale about the consequences of missing a warning. The idea that it’s better to issue too many warnings than miss a critical one became known as “Plainfield Syndrome,” a philosophy that persists to this day. This tornado accelerated the development of the new NEXRAD Doppler Radar network, which vastly improved tornado detection. The responsibilities of the NWS Chicago office have since been greatly reduced as warning duties for central and southern Illinois have been passed off to other offices. Despite being in the heart of the most explosive tornado region in the world, Wichita, Kansas has been remarkably fortunate. Wichita proper has never been hit by anything stronger than an F3 since 1948. The area’s most significant tornadoes have all happened on the outskirts. This one was the strongest and most destructive ever to strike the Wichita area. It was part of a widespread tornado outbreak across the southern Great Plains. The outbreak had a classic set up with a large trough and associated cold front digging through the region. A speed maximum in the jetstream (a “jetmax”) and abundant low level moisture created substantial instability and tornadoes began touching down early that afternoon. The highlight of the day, however, touched down near the town of Clearwater about 12 miles south-southwest of Wichita at around 6pm and moved northeast. It struck the southern suburb of Haysville as an F2, causing widespread damage. Crossing the Arkansas River, the tornado hit McConnell Air Force base as an F3, narrowly missing a brand new line of ten B1 bombers, each costing about $280 million. Instead, it ripped through base housing, causing $62 million worth of damage. Fortunately no one on the base was killed. Some of the most extreme damage occurred along Douglas Avenue and Chapel Drive, where several well-built homes almost completely vanished. The tornado continued to grow and intensify as it headed northeast up the Kansas Turnpike. It struck the Greenwich Heights subdivision as a high-end F4 and numerous homes were destroyed and some were swept away. At 6:35pm, the tornado slammed into the suburban village of Andover as an F5 half a mile wide. The town was devastated. Homes on the west side of North Andover Road were completely swept away, leaving just bare foundations. Trees were shredded and debarked. The Golden Spur mobile home park was wiped out. Mobile homes simply disintegrated, and some were thrown considerable distances through the air. A car was thrown over half a mile and destroyed beyond recognition. Thirteen people were killed at the mobile home park alone. Cars were thrown from the Kansas Turnpike as the tornado passed south of Towanda. One was found wrapped around a tree. The fate of the driver was unknown. The tornado steadily weakened as it passed west of El Dorado. It lifted shortly after crossing El Dorado Lake. Overall, the tornado killed 17 people and injured another 225. Hundreds of homes were severely damaged or destroyed. 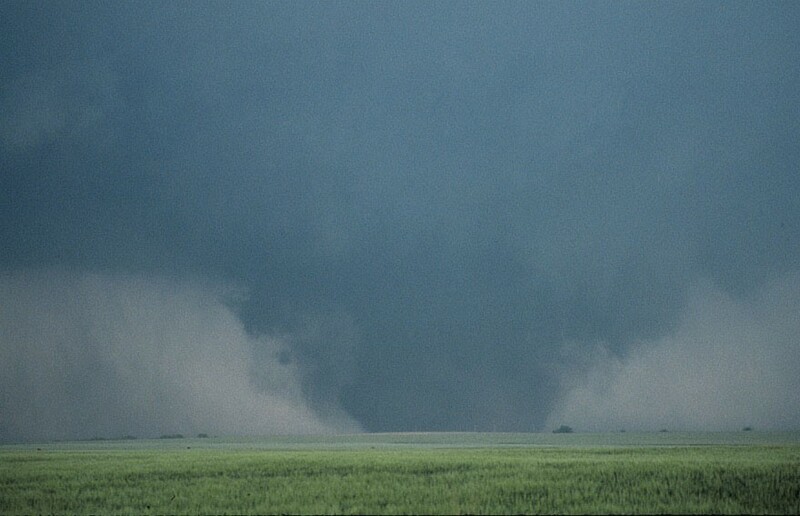 This tornado, like much of the outbreak, was extensively filmed and photographed by storm chasers and media personnel and has been the subject of extensive study. Taken by a storm chaser while the tornado was southeast of Billings, probably from I-35. Just half an hour after the Andover tornado touched down, another monster began to develop over rural north central Oklahoma. It touched down near Garber in eastern Garfield County and headed east-northeast over open farmland. Crossing into Noble County, the tornado grew into a monster roughly a mile wide. Near the county line, several oil tanks were destroyed and well pumps were toppled over. A few miles to the northeast, a rural home was completely destroyed. The tornado appeared to grow even stronger as it passed over open country north of Red Rock. Trees were debarked and pavement was scoured from roads east of I-35. At least one vehicle was thrown a considerable distance and its tires were ripped from the chassis, one of which was found with a small piece of wood speared into it. A mobile Doppler radar deployed by the University of Oklahoma measured wind speeds as high as 268 mph, near the threshold of F5 intensity on the old Fujita scale. At the time, it was the greatest wind velocity ever measured. 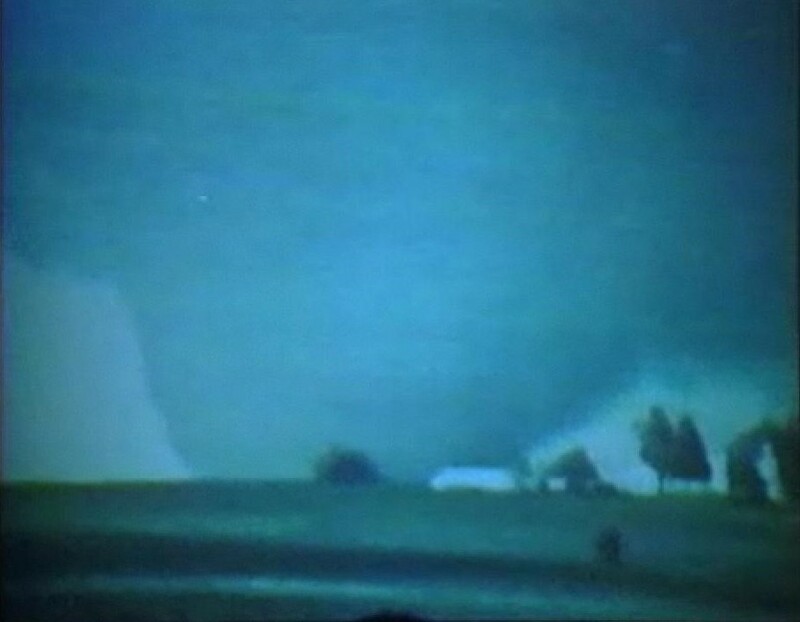 However, much like the Valley Mills tornado of 1973 and the Gates, Nebraska event of 1961, this tornado was difficult to rate because it didn’t hit much. Despite the Doppler radar measurement, meteorologists elected to conservatively rate the tornado an F4. It is, however, widely believed to have been an F5. No one was killed by the tornado and only six people were injured. This tornado was highly visible and was seen for miles. It continued on to the east-northeast, crossing the Arkansas River into Osage County, gradually weakening. It passed north of Fairfax before lifting a few miles northwest of Pawhuska. It travelled 66 miles but hit just a single house. Taken as the tornado was between Chandler and Lake Wilson. June is prime tornado season in the upper Midwest and northern Great Plains, where the tornado season peaks later. A substantial mid-latitude storm system was moving through the central part of the country. The day before, a series of tornadoes, including two F4s, swept through Kansas. Fortunately no one was killed. The outbreak the next day would be even more widespread. After a handful of tornadoes impacted South Dakota, the main tornado touched down in Nobles County, Minnesota, just south of Leota, around 5pm, moving northeast. 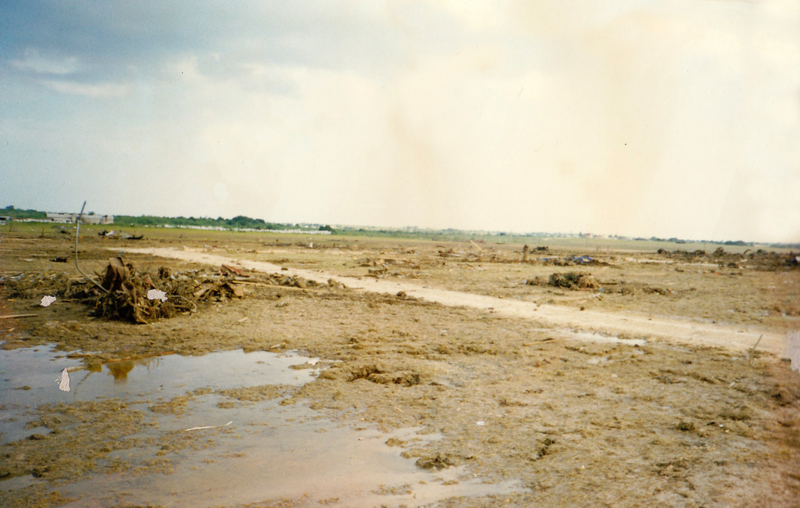 A farm and a couple of houses were destroyed east of Leota. The tornado turned north and intensified, growing into an F5 three quarters of a mile wide. The home of the Buys family simply disintegrated. It was one of several homes swept away in Chandler. It ripped through the west side of Chandler at 5:18 pm. 75 homes were destroyed and some were completely swept away. Forty people were injured and a woman taking shelter in her basement was killed by falling debris. The town’s damaged water tower remains standing, a symbol of the tragedy. The tornado narrowly missed Lake Wilson, which had just been hit by an F4 tracking roughly parallel to the Chandler F5. Moving over more rural areas, the tornado curved to the northeast, steadily weakening. Passing north of Lake Sarah, the tornado lifted near the Lyon County line. Miraculously, just one person was killed in the entire outbreak. The lessons from Plainfield had been well learned. 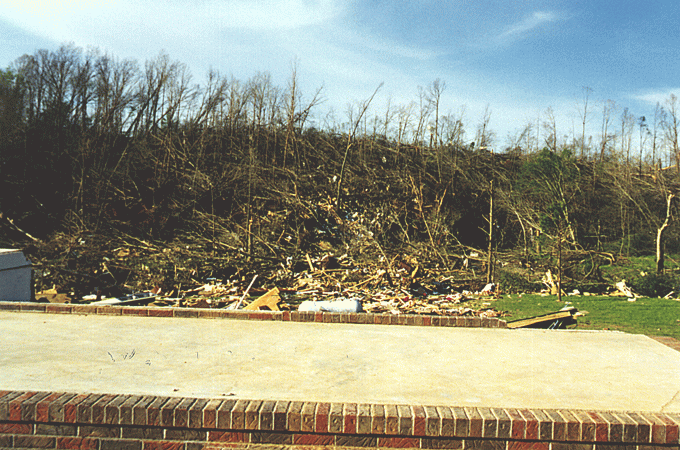 Surveying tornado damage is so much more than analyzing the damage itself. Context is also crucial. Surveyors are a little like accident investigators. They have to determine how things were originally and where debris came from in areas they may not be familiar with, on top of determining the nature of the construction of damaged/destroyed structures and analyzing damage patterns. It’s like a multi-thousand piece mental jigsaw puzzle. It’s very easy to miss things. And accurately rating a tornado that hit virtually nothing tends to take a lot more time and effort than the National Weather Service is willing to spend. 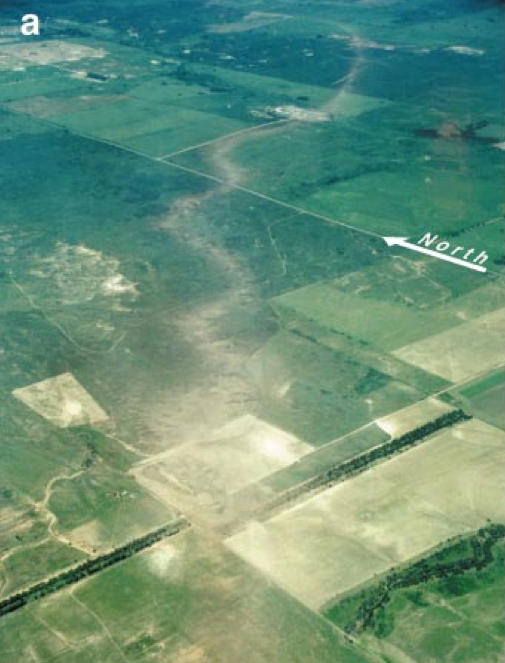 Severe ground scouring and a cycloidal damage path are indicative of a powerful tornado. VORTEX (Verification of the Origins of Rotation in Tornadoes Experiment) was a research project conducted by a team of scientists from 1994 through 1995. Their goal was to learn more about how tornadoes form and, particularly, why some supercells produce tornadoes and others do not, with an eye to improving tornado detection and warnings. The outbreak of June 8, 1995 in the Texas Panhandle was one of the last outbreaks they studied and has been the subject of much discussion. It was a classic dryline event. 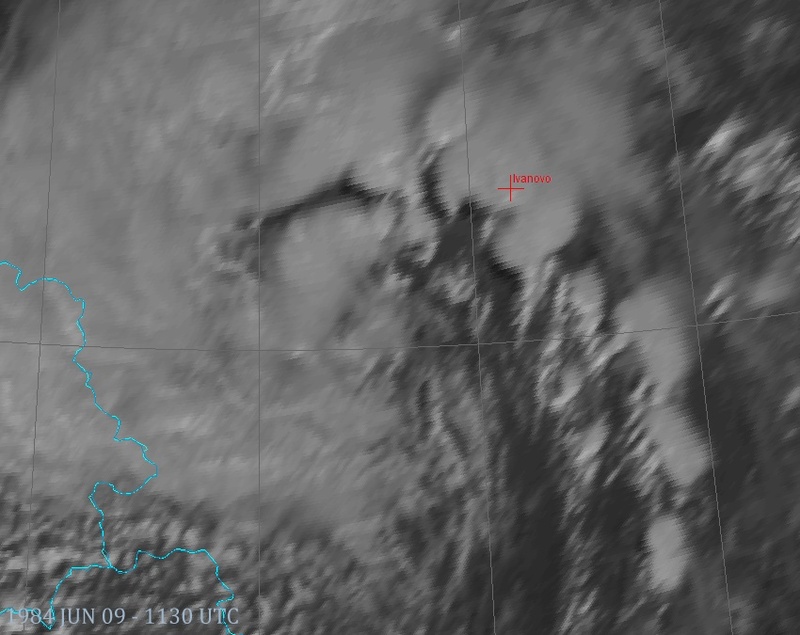 Supercell thunderstorms began to develop along the dryline around noon as it moved east into the Texas panhandle. At around 4:30pm, a narrow “stovepipe” F4 ripped through rural areas near Pampa. That was just the beginning. At 6:35, another violent tornado touched down just north of McLean in southeastern Gray County and moved northeast over open country. Crossing into Wheeler County, the tornado steadily strengthened and grew in size, eventually growing to half a mile in width. The VORTEX team chased it in an airplane equipped with ELDORA airborne Doppler radar. Intense ground scouring and topsoil disruption was observed, along with extensive wind rowing. Pavement along McCarty Street south of the village of Kellerville was scoured from the ground. 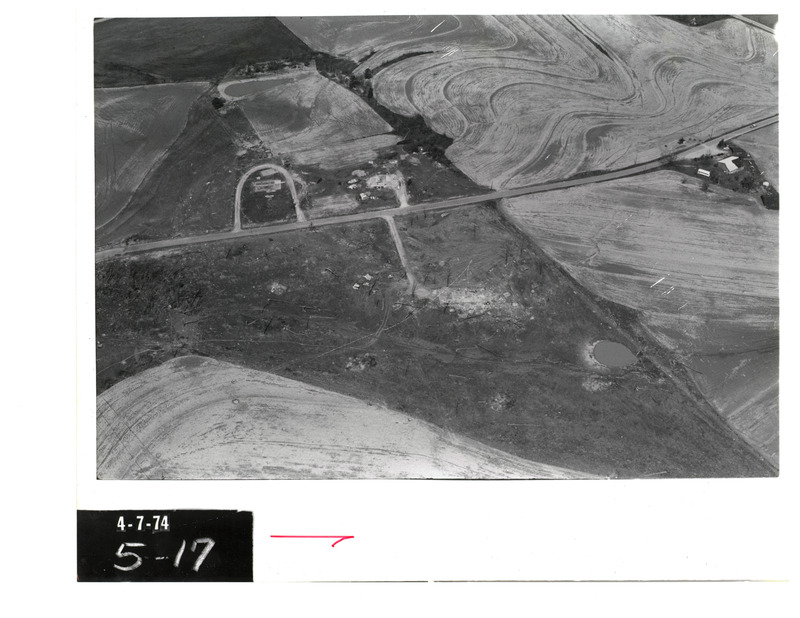 It was in this area near the Wheeler-Gray County line that a rural home literally vanished. So little remained that the National Weather Service survey team likely missed it. The totality of the destruction made it virtually impossible to determine the nature of its construction, but it’s likely the house was not anchored to its foundation, which may have been a simple cinderblock foundation. That said, there was extensive ground scouring throughout that area. A pair of homes swept away in Kellerville. These homes were likely poorly anchored, however. Note the lack of damage to the stronger structure to the right. The tornado likely reach its peak over open country to the southwest. The tornado weakened and narrowed as it passed a couple miles east of Kellerville. Continuing northeast over empty farmland, the tornado crossed Oklahoma Avenue midway between Wheeler and Mobeetie. Weakening further, the tornado curled to the northwest, lifting shortly after crossing Cowboy Creek Road. 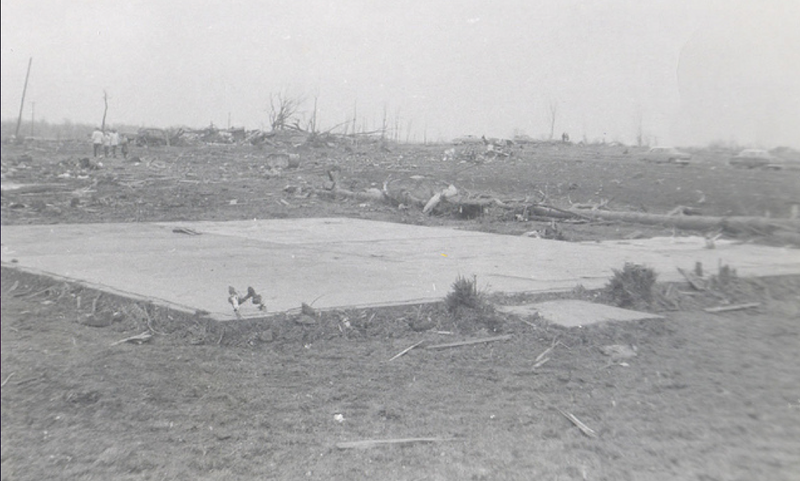 Because so few manmade structures were hit, the National Weather Service conservatively rated it an F4. However, based on their analysis of the damage path and Doppler radar measurements, the VORTEX team concluded that the Kellerville tornado was likely an F5. No one was injured by this tornado. Just over an hour later, a massive F4 over a mile wide ripped through farmland west of Allison. Like the Kellerville tornado, this one hit so little, rating it proved difficult. It was not extensively studied by the VORTEX team, but four homes were destroyed. It was rated F4, but may have been an F5. This tornado was a spectacular stovepipe tornado that caused very localized extreme damage in the community of Oakfield, Wisconsin, a few miles southwest of Fond du Lac. 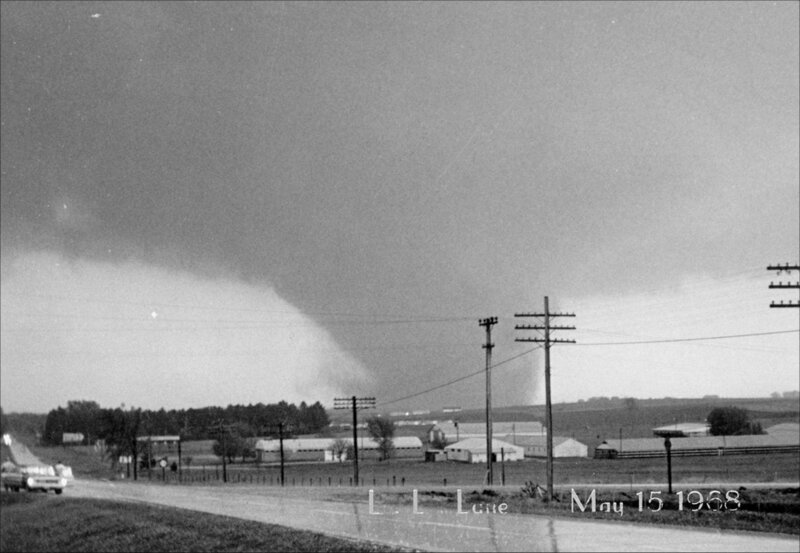 It was part of a relatively minor outbreak, with only twelve tornadoes being reported, of which the Oakfield tornado was the only one stronger than F2. It touched down at 7:05pm along Highway 26 a few miles northeast of Waupun and moved just south of due east. The tornado crossed US 151, where it was photographed by several chasers, who tracked it to the east. Just ten minutes after touching down, the tornado ripped through the south side of Oakfield as an extremely narrow F5 just a couple of blocks wide. Four homes were completely swept away, with little debris left at the site. An additional 56 homes were severely damaged or destroyed. This home simply vanished. Debris was carried well away from the site, chewed into small pieces and widely scattered. The Friday Canning Company building was leveled, with empty cans spread out over a fifty mile radius. A couple of cars were thrown roughly 130 yards through the air and destroyed. Thanks to timely warnings, no one was killed in the tornado. Twelve people were treated for injuries. Crossing US 41, the tornado curved slightly to the northeast, lifting just northwest of Eden. The tornado was initially rated F4 but was later upgraded. It was extremely narrow for its intensity. It was never wider than a quarter of a mile and was merely a hundred yards wide when it struck Oakfield at peak intensity, making it possibly the narrowest F5 ever observed. As exemplified by the many tornado events that grace these pages, Nature has the inescapable capacity to inspire awe. The power of these storms simply defies human comprehension. 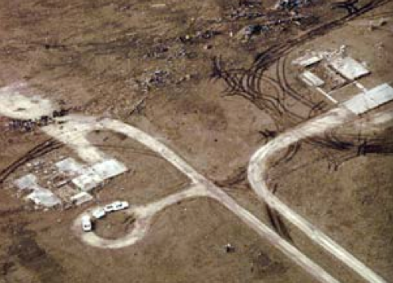 What happened to Jarrell, Texas on May 27, 1997 is among the most incredible of all. 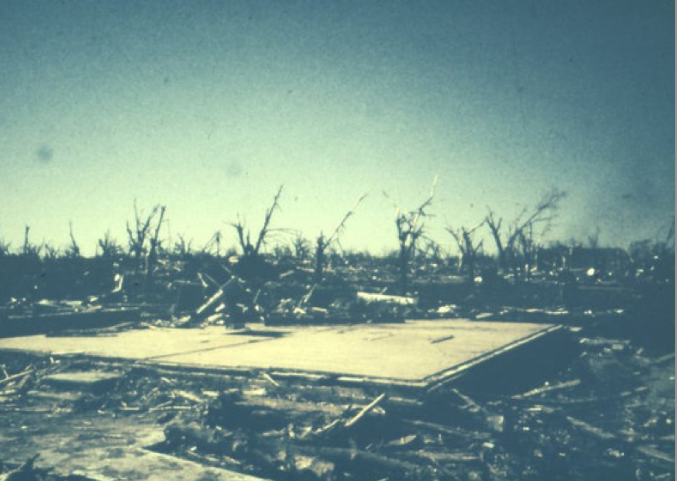 The Jarrell tornado may have been one of the most powerful tornadoes ever observed. Some of the extreme ground scouring that occurred in the Double Creek area. The area around this access road was once a grassy field. It was part of a relatively consolidated outbreak across central Texas. During the overnight hours the previous night, a mesoscale convective complex (a very large system of thunderstorms) developed over eastern Oklahoma and western Arkansas. The downdraft of a thunderstorm generates significant temperature differences and a smaller scale front called an “outflow boundary” or “gust front,” forms along the edge of the cold air underneath the thunderstorm. An outflow boundary, like a front, can generate rising air to foster thunderstorm development. This set up the outbreak that happened that afternoon. It also contributed to the backbuilding (storm regeneration opposite of mean flow) that caused the unusual northeast-to-southwest movement of the supercells that day. Shear was relatively weak given the intensity of the storms, but the atmosphere was so unstable that it was able to overcome that. Precisely why such an extreme event occurred in a seemingly less than ideal environment, however, remains a mystery. This is the site of a home that was completely wiped out. Even the foundation was torn up and carried away. The people who lived here died in the tornado. You can see flowers left on cinder blocks in the foreground. Note the tires and axle of a car left on the site. The Jarrell tornado began as a thin, rope tornado near the Bell-Williamson County line at 3:45pm, moving southwest toward Jarrell. Within minutes, it exploded into a monster F5 three quarters of a mile wide. The tornado slammed into the Double Creek Estates subdivision northwest of Jarrell shortly before 4pm. The entire subdivision, totaling roughly fifty homes, simply vanished. Every home was completely swept away and some had their foundations torn away or buried in several inches of mud, making it impossible to tell a home ever existed there. Hardly a scrap of debris remained. These were substantial, well-constructed suburban homes anchored to their foundations. Throughout the area, up to a foot and a half of topsoil was torn loose. What was once a lush, grassy field with beautiful suburban homes was now a muddy, desecrated crater. Experienced National Weather Service surveyors said it was some of the most incredible damage they’d ever seen. The debris from Double Creek was pulverized into small pieces and scattered up to a mile or more downstream. The remains of a large recycling plant. What few steel beams were left were badly mangled and twisted. Vehicles were thrown up to half a mile through the air. Some were never found. Others were torn to pieces and scattered about the surrounding fields. An engine block was found in the middle of a field, no trace of the car it belonged to was ever found. A piece of timber was speared into the ground over a foot in depth. Telephone poles were snapped off at the base and splintered, and trees throughout the area were shredded and debarked. Nearby, a steel frame recycling plant was obliterated and nearly swept away. All that was left were a few mangled and twisted steel beams. The steel frame of a mobile home was found wrapped around a tree. On a rural road just outside of Jarrell, a 500-foot section of asphalt was torn from the ground. The tornado lifted shortly after entering a wooded area southwest of Jarrell. It had travelled just five miles and was only on the ground for roughly half an hour. The remains of the Igo family residence. The entire family of five died here. For the residents of Double Creek, it was a death sentence. Twenty-seven people died there. Just one person in the direct path of the tornado survived. Entire families were wiped out, including all five of the Igo family and all four of the Moehrings. Double Creek rebuilt and beside the new neighborhood is a park dedicated to the memory of those who died. It sits on the seven acres once owned by the Igo family. Twenty-seven trees form a semicircle at the entrance. There is a baseball field and a community center, as well as two public storm shelters should nature’s wrath visit them again. The memories here are hard, but the people of Double Creek know they have twenty-seven angels watching over them. Twenty-one years after the Smithfield tornado, the Birmingham area was hit again. This tornado devastated portions of western Jefferson County. It was part of a relatively small outbreak of just 14 tornadoes, the three most significant of which were all from the same supercell. Conditions were somewhat meteoric, with by far the most favorable environment coming after sundown. Beginning around 6:30pm, a supercell began to develop over west-central Alabama. At 7pm, it spawned an F3 tornado that moved through rural areas north of Tuscaloosa. Aerial view of the destruction in the Oak Grove/Rock Creek area. Just half an hour later, the main tornado touched down along the banks of the Black Warrior River in northeastern Tuscaloosa County, moving northeast. When it slammed into the small village of Oak Grove just minutes later, it was at best a borderline F4, but the results were devastating. Most of the homes in the community were small and poorly constructed. 74% of them in the path of the tornado were severely damaged or destroyed. The Oak Grove school complex took a direct hit. The elementary school was completely destroyed. At the high school, a group of cheerleaders were practicing in the gymnasium. They ran for cover in the lobby, one of the worst places to be. A partially collapsed wall prevented them from being crushed when the roof collapsed on top of them. The high school was so badly damaged that it had to be torn down and rebuilt. Miraculously, only three people died in Oak Grove itself. However the tornado was just beginning. Oak Grove High School after the tornado. It continued to intensify as it churned northeast. It struck the town of Rock Creek as a rapidly-intensifying F4. Numerous homes were destroyed. 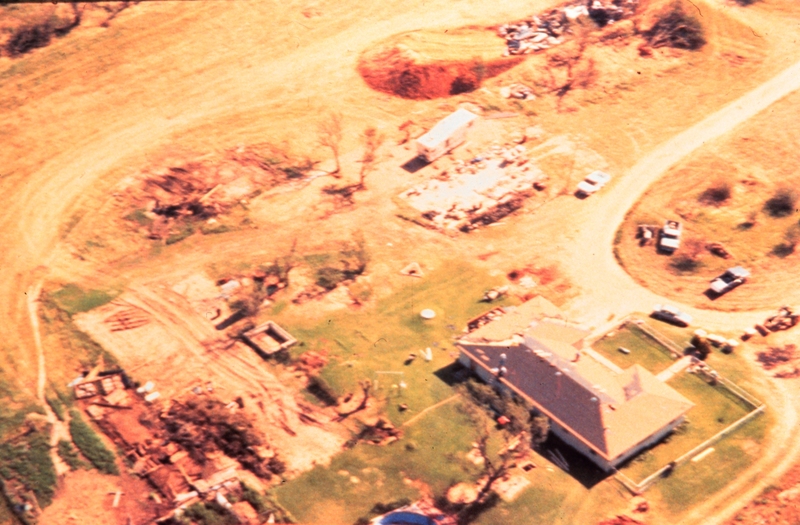 A few homes southeast of town were completely swept away as the tornado briefly reached F5 intensity. Several cars were blown nearly 200 yards into a ravine. Eleven people in the Rock Creek area were killed. Four more were killed when several homes were destroyed south of Sylvan Springs. The greatest devastation, however, was yet to come. This tornado is traditionally referred to as the Oak Grove tornado. The near destruction of that community received considerable news coverage. Forgotten, however, was what happened to the northwestern suburbs of Birmingham. 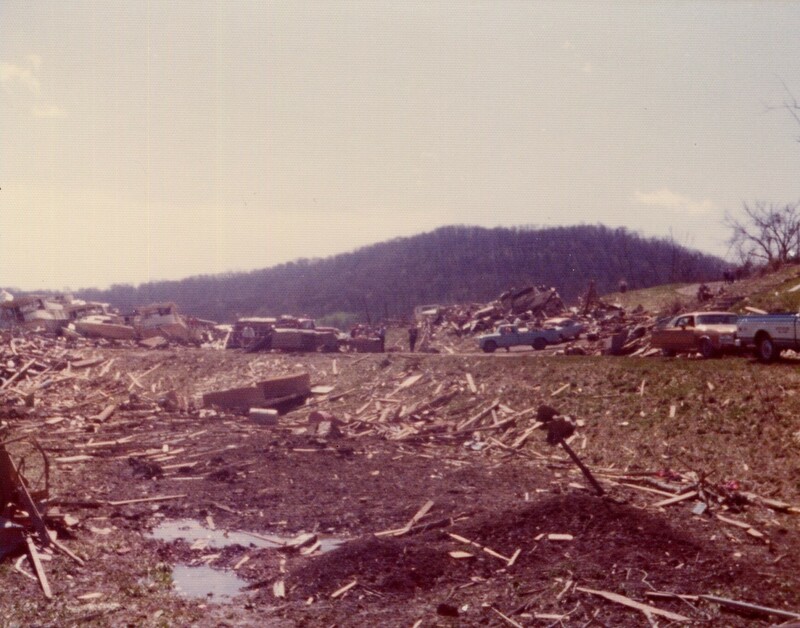 The Wylam Heights subdivision west of McDonald Chapel was virtually annihilated. 94% of it was severely damaged or destroyed and eight people were killed. The tornado then ripped through the south side of Edgewater as an F5 three quarters of a mile wide. The Edgewater Baptist Church was leveled and homes along Galveston Street were completely swept away. Six people were killed in Edgewater. The tornado steadily weakened after that. The Open Door Baptist Church south of Minor took a direct hit. Sixty-seven people attending a Wednesday night prayer meeting took shelter in the hallway as the roof and exterior walls were destroyed. Cars in the parking lot were thrown into a nearby ravine. Fortunately, no one was seriously injured. The tornado finally lifted as it moved through Pratt City. The same cell produced a third tornado, an F2, in St. Clair County that killed two people when it destroyed a mobile home. In all, 32 people were killed in the Jefferson County F5 and 259 were injured. Hundreds of homes were completely destroyed. It was Alabama’s deadliest tornado since 1932. The tornado moving over rural Lawrence County. Just eight days after the Oak Grove tornado, another monster F5 roared through rural Lawrence County, Tennessee. The setup was strikingly similar, with a low pressure system over the Great Lakes and a cold front moving through the Mississippi Valley. This time, however, tornadoes began touching down that morning and continued through the afternoon hours. At around 3:30pm, an F3 ripped through downtown Nashville, killing one and injuring 60. It was one of the most notable tornadoes to strike a metropolitan area in recent decades. An hour and twenty minutes later, another tornado touched down in eastern Hardin County south of US 64 and moved east-northeast into Wayne County. It gradually intensified as it churned through rural areas south of Waynesboro. Three people were killed on Lay Creek Road (which seems to have been renamed at some point since). One frame home was swept away and a person inside was killed. 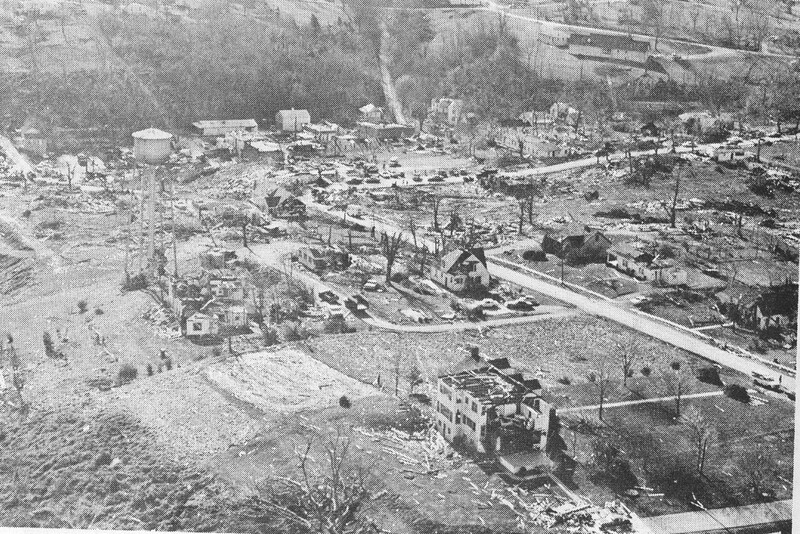 Thirty-three other rural homes were destroyed and many others were severely damaged elsewhere in Wayne County. This brick home was completely swept away, the debris thrown into the adjacent hillside. This is F5 level damage. By the time the tornado reached the Lawrence County line, it was a mile-wide F5. Well constructed homes north and west of the small village of Deerfield were completely swept away, including substantial brick homes. Vehicles were thrown up to half a mile through the air. The remains of a pick-up truck were reportedly found twenty miles from where it originated. A 200-foot section of grass was scoured from a pasture and significant disruption of topsoil occurred. Asphalt was also scoured from local roads and trees were completely debarked. The tornado weakened as it continued northeast. Passing south of Summertown, the tornado moved into northern Giles County, where five homes were destroyed. It turned more to the north-northeast into Maury County. Several homes were seriously damaged northwest of Culleoka. The tornado finally lifted near Interstate 65 east-southeast of Columbia. It had traveled 69 miles. A recent reanalysis of this event suggests that it may have in fact been three violent tornadoes that formed one after the other, with the Lawrence County section being an F5 and the others being F4s (it’s been suggested that the first one may have also been an F5 in Wayne County). Fortunately, the tornado stayed over mostly rural areas. The only fatalities were the three in Wayne County. Another 36 people were injured and roughly a hundred homes were destroyed. It remains one of only two F5s in Tennessee history, the Pinson tornado of 1923 being the other. This picture of a pickup truck stripped to the frame rails and wrapped around a telephone pole became arguably the most iconic image of the outbreak. Tornadoes are a fact of life in central Oklahoma. Every spring, they play host to nature’s most powerful force, as regular as the sunrise. 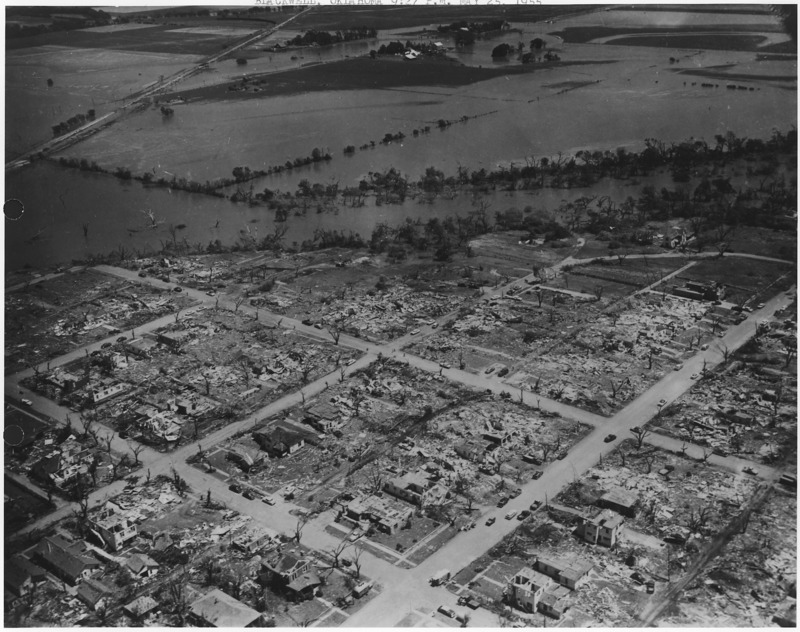 In and around Oklahoma City, devastating F4s had struck Moore in 1893, Bethany in 1930, and the west side of OKC in 1942. However, the Oklahoma City metro hadn’t been hit by a violent tornado since 1978. This one would be the most devastating of them all. May 3, 1999 is a legendary date in meteorology. What happened that day has become one of the most studied weather events in history. It was a balmy but humid late spring day in central Oklahoma. A dryline was moving through the Texas panhandle and into the western part of the state. Substantial instability was building in the atmosphere and as the day progressed, it became increasingly clear that a major severe weather outbreak was imminent. What happened was Oklahoma’s greatest tornado tragedy in over half a century. 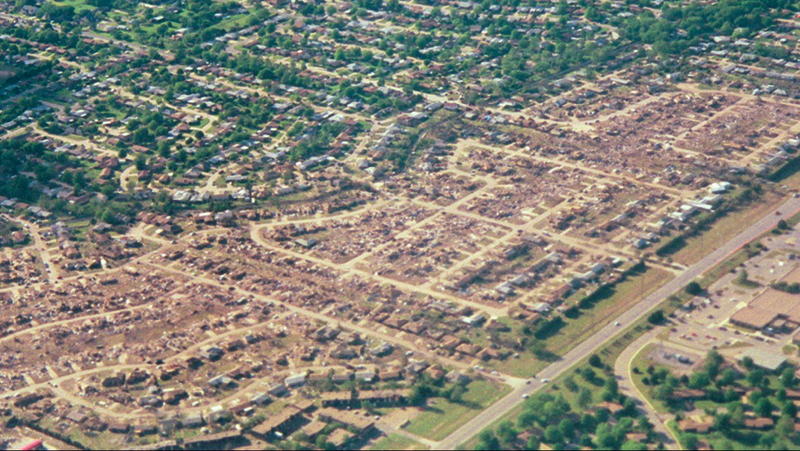 Aerial view of the destruction in Moore. The tornado touched down at 6:26 pm a few miles southwest of Amber and moved northeast along Interstate 44, quickly intensifying, crossing Highway 92 as an F4. It slammed into the rural community of Bridge Creek as a mile wide F5. The village was virtually obliterated. A few well-built homes were completely swept away and cars were thrown up to a quarter of a mile through the air. All mobile homes in the path of the tornado simply disintegrated. Grass was pulled from the ground and asphalt was scoured from a rural road. A pickup truck was stripped to the steel frame and wrapped around a telephone pole. Twelve people died in Bridge Creek, all of them in the decimated Willow Lake area, nine of them in mobile homes. Passing north of Newcastle, the tornado crossed I-44 as an F4. A woman taking shelter under an overpass was sucked out by the tornado and killed. The tornado then crossed the Canadian River, headed right for the city of Moore. It struck the Country Place subdivision, were a dozen homes were completely destroyed and one was swept away. Cars were hurled across Pennsylvania Avenue into adjacent neighborhoods. One vehicle was found wedged under a bridge near the intersection of Pennsylvania and SW 134th, roughly a quarter mile from where it originated. An airplane wing from the Chickasha Municipal Airport was found here, roughly twenty miles away. The Eastlake Estates subdivision was devastated. Numerous homes simply vanished. The tornado then ripped through the densely populated Eastlake Estates subdivision as an F5 nearly a mile wide. Rows of homes were simply annihilated, some of which were completely swept away. At the Emerald Springs apartment complex, a two story apartment building was obliterated and three people were killed. Westmoore High School was heavily damaged. A number of people attending an awards ceremony took shelter in a hallway and were uninjured. Cars in the parking lot were thrown through the air and destroyed. The tornado tore through the north side of Moore as a high-end F4. Numerous homes along Santa Fe and Janeway Avenues were destroyed and four people were killed. As the tornado was moving through Moore, a Doppler On Wheels (DOW) mobile radar unit operated by meteorologist Josh Wurman estimated wind speeds of approximately 300 mph in the tornado. These are the strongest winds ever recorded on the face of the Earth. Aerial view of the incredible devastation in Midwest City. Hundreds of homes were annihilated. Crossing Interstates 35 and 240, the tornado moved through an industrial area east of Crossroads Mall. An 18-ton freight car along a section of track parallel to I-240 near Bryant Avenue was picked up and rolled nearly three quarters of a mile. It’s believed to have been airborne for roughly fifty to a hundred yards at a time. Hundreds of homes were severely damaged or destroyed as the tornado tore through Del City and six people were killed. The tornado remained very strong as it crossed Interstate 40 into Midwest City. Cars from a car dealership were picked up and thrown roughly 350 yards across the interstate. Numerous homes on the west side of Midwest City were leveled and a few were nearly swept away. Then, just as suddenly as it formed, the tornado was gone; lifting just north of Reno Avenue near Heritage Park Mall. The devastation it left in its wake was appalling. Fifteen hundred homes were completely destroyed and thousands more were seriously damaged. Thirty-six people were killed and 583 were injured. It was Oklahoma’s deadliest tornado since Woodward in 1947 and the deadliest in the US since the devastating Wichita Falls tornado in 1979. Two other violent tornadoes would strike Oklahoma that day, including one near Mulhall that was a mile and a quarter wide. The Mulhall tornado, particularly its complex structure, has been the subject of intensive study. 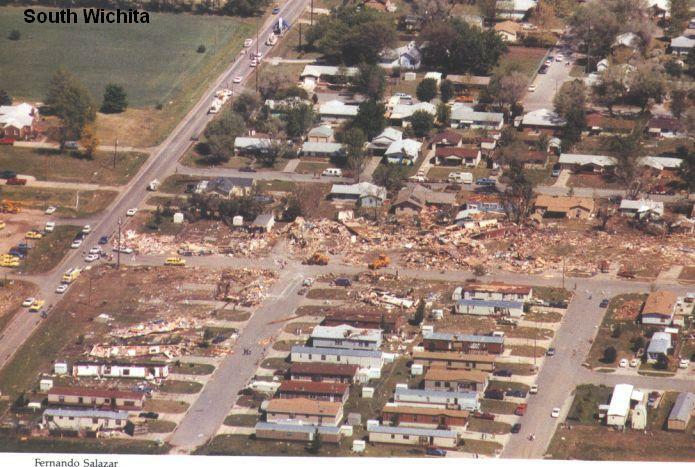 A third F4 struck the Haysville suburb of Wichita, Kansas. Damage from the Moore tornado came to roughly $1 billion, making it the costliest tornado in history at the time. Moore rebuilt and funding was put toward building storm shelters across the OKC metro. The residents of Moore had no idea how dearly they would soon need them.